I started doing these “looking back” posts for two reasons; I thought it would be fun to see the different seasons pass all in one post and I also thought they would be easy, because I wouldn’t have to take any photos. I was right and wrong, because they are fun but they aren’t easy. Picking a few photos out of a choice of hundreds of them can be tough, so I decided to choose the best examples of the what the month at hand brings. 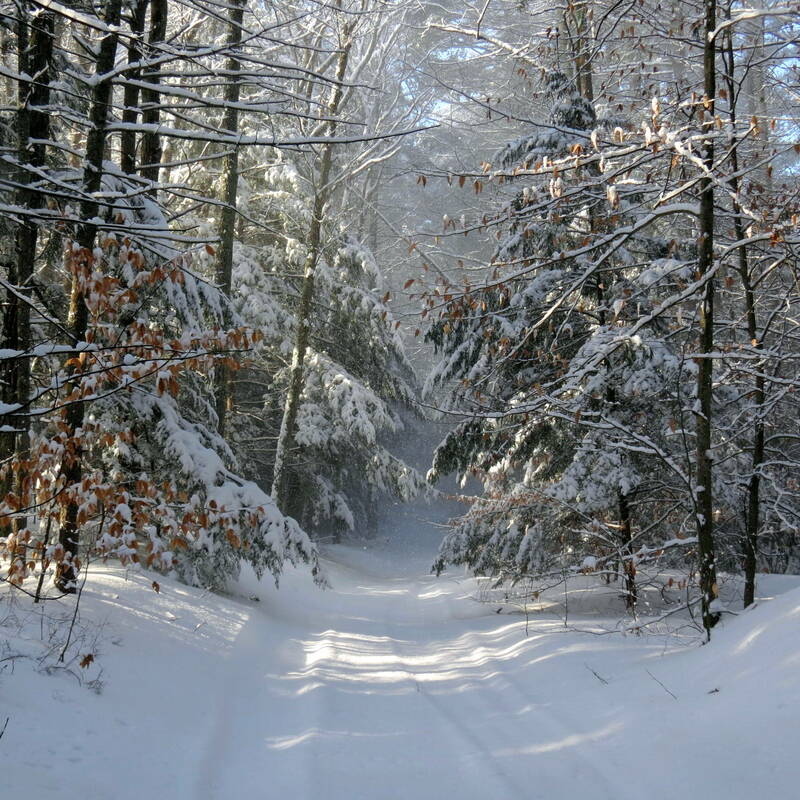 January for instance is a month most people in New Hampshire expect to be cold, and that’s what the above photo shows. 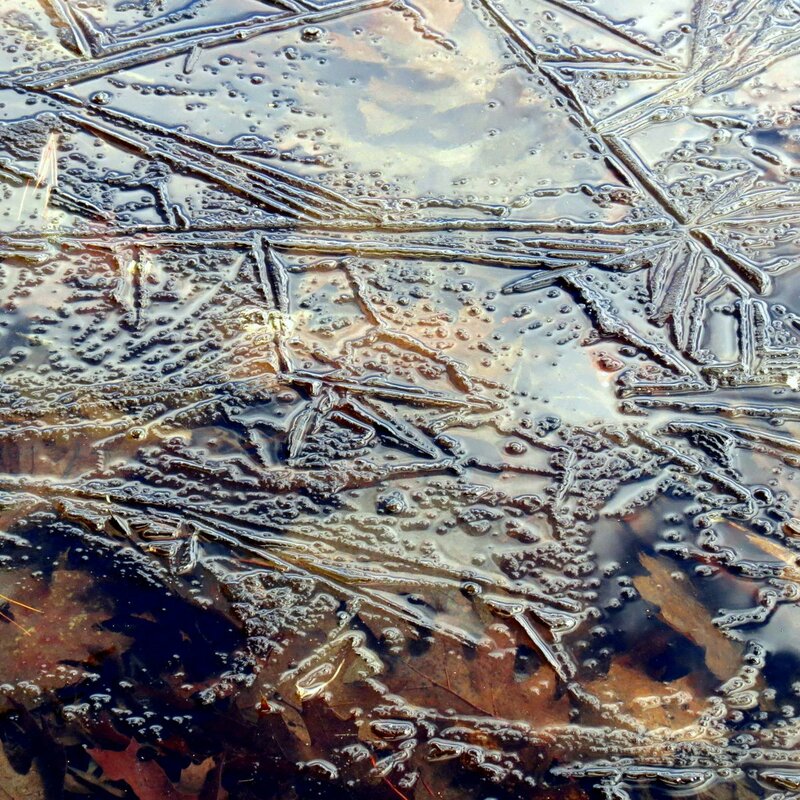 It was a cold month; I wrote that record breaking, dangerous cold had settled in and lasted for a week. It was -16 °F the morning I wrote that post, too cold to even go out and take photos. 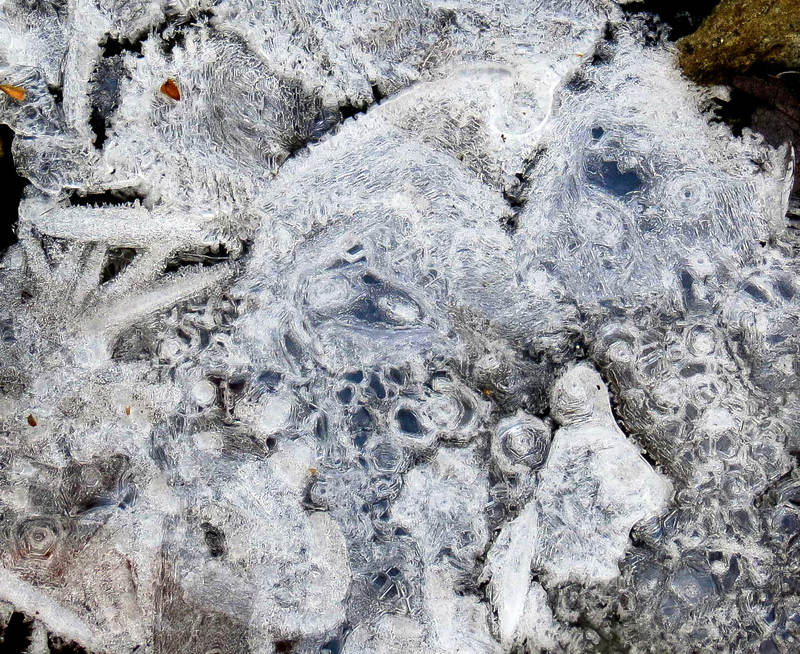 But even cold weather has its beauty, as this January photo of ice shows. 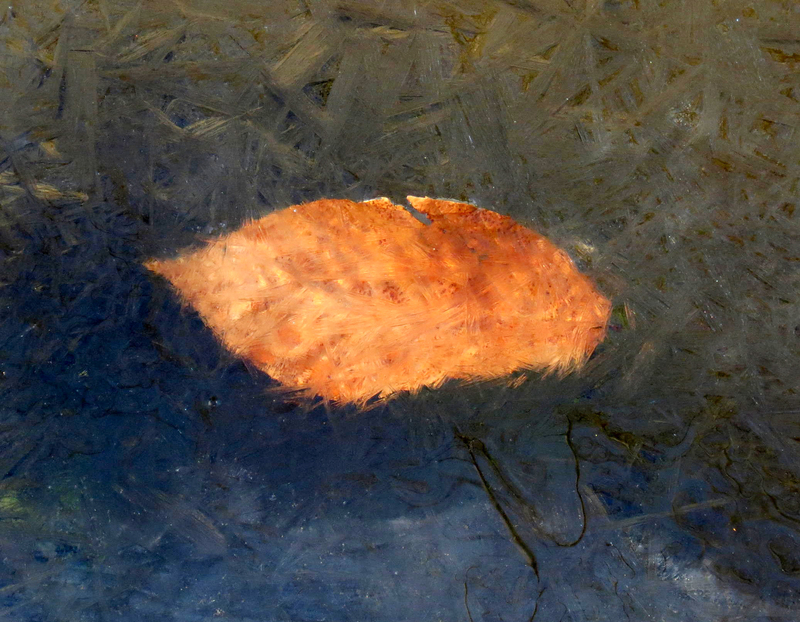 There was no thaw in February, as this beech leaf frozen in ice shows. But February had its moments and it did warm up enough to snow. This storm dropped about 7 inches of powder that blew around on the wind. 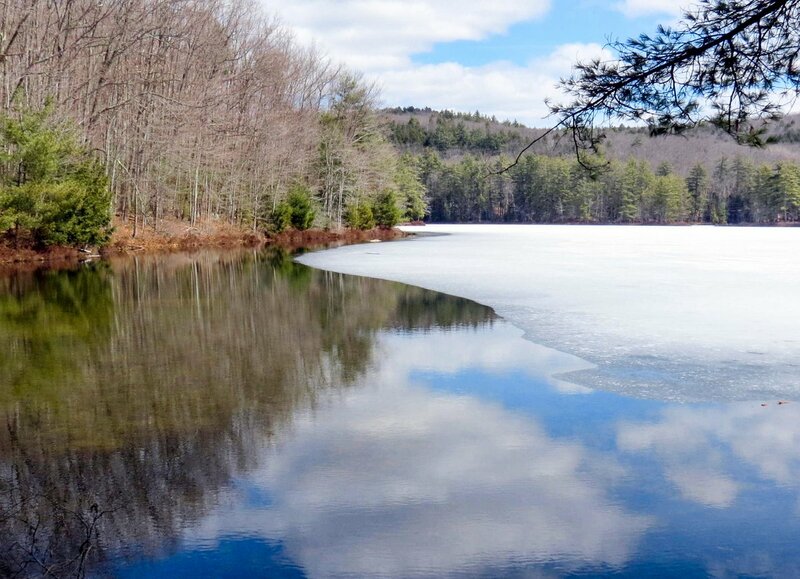 March is when the earth awakens here in New England and it is the month when you can find the first flowers blooming, if you’re willing to look for them. 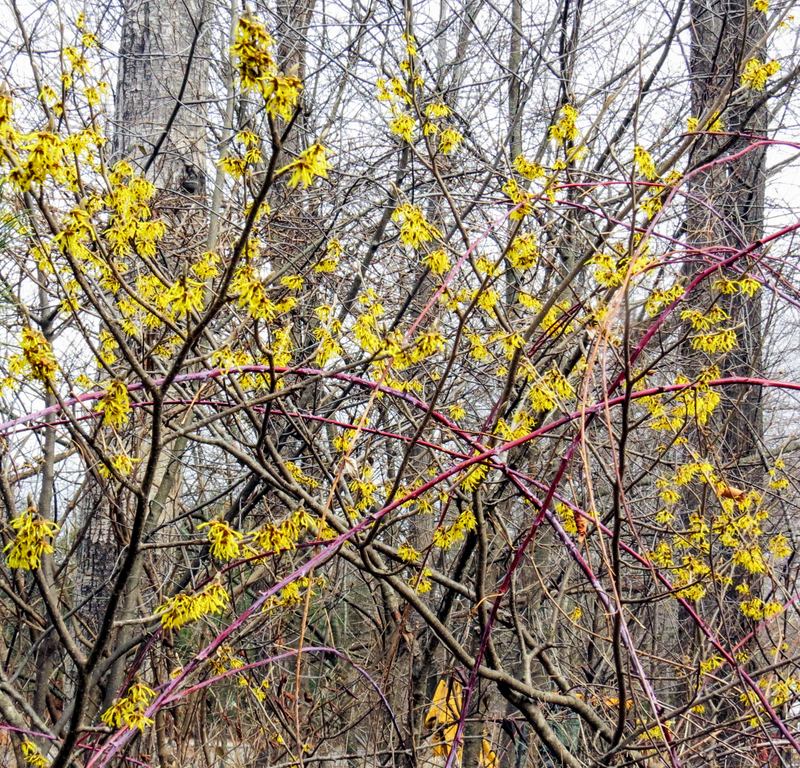 Sometimes it’s too cold for all but the hardiest blooms like skunk cabbage, but last March the vernal witch hazel (Hamamelis vernalis) was blossoming. 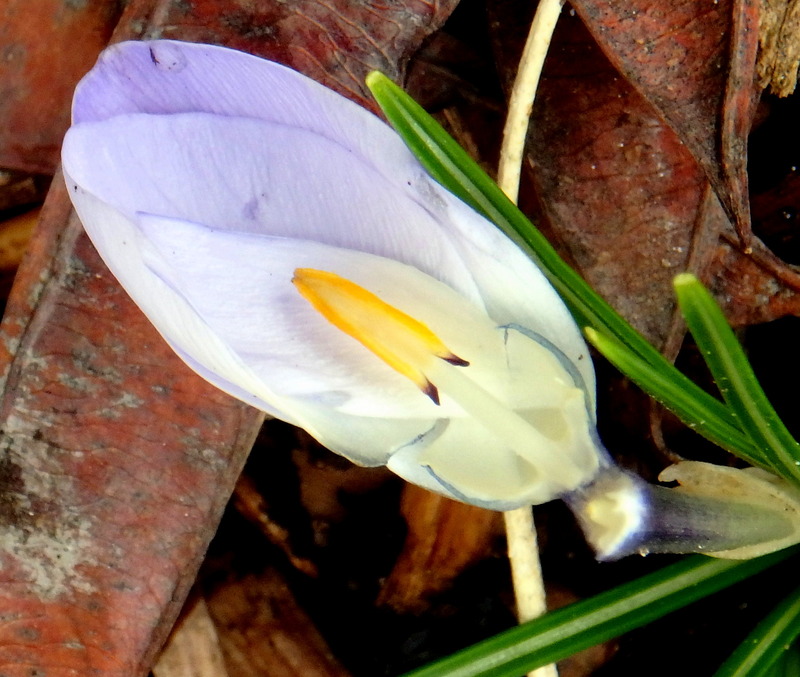 Crocus also bloomed in March. This strange one looked as if it had been cut in half lengthwise. April is when nature really comes alive and flowers in bloom get easier to find. I saw these female American hazelnut flowers (Corylus americanus) blooming on the 18th. By the end of April there are so many flowers in the woods you really have to watch where you step. 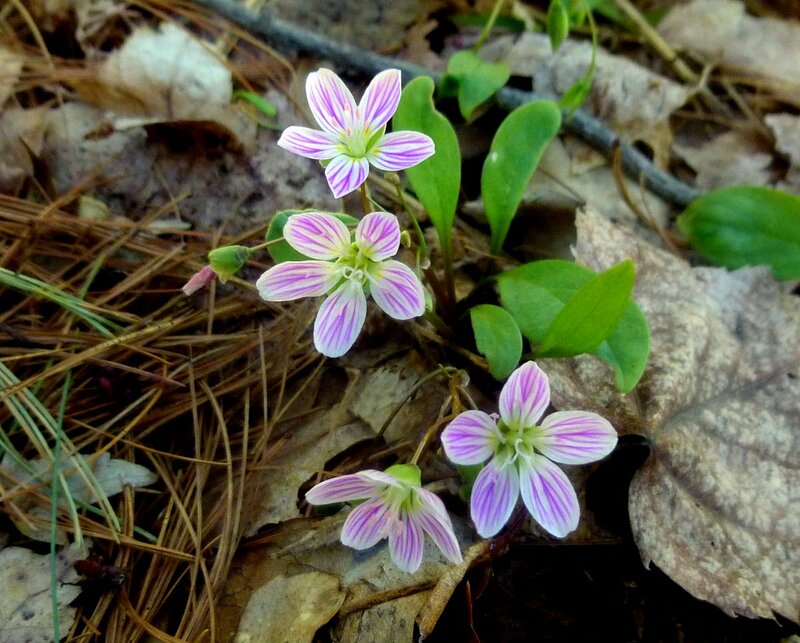 I found these spring beauties (Claytonia virginica,) part of a huge colony, on April 25th. Trout lilies, coltsfoot, violets, dandelions, and many other flowers first show themselves in April. I’m very anxious to see them all again. Though we see flowers in March and April it doesn’t usually truly warm up until May, and that’s when some of the more fragile flowers like these beautiful little fringed polygalas (Polygala paucifolia) appear. Bluets, lily of the valley, honeysuckles, blue eyed grass, starflowers, wild azaleas, lilacs, trilliums, wild columbine and many other flowers also often appear in May. 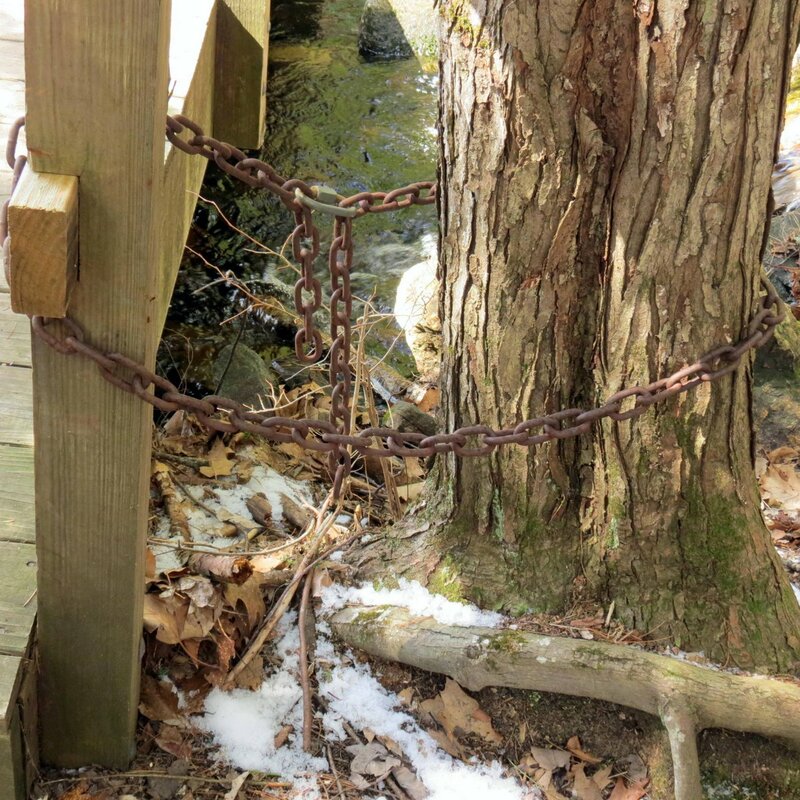 Flowers aren’t the only things that appear in spring; some of the most beautiful things in the forest go completely unnoticed, like breaking tree buds. 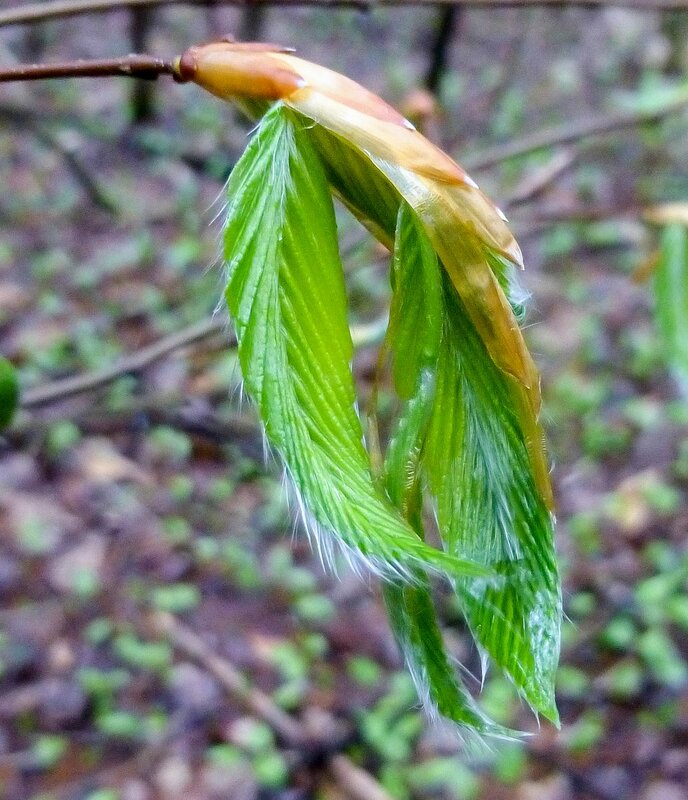 As this just opened bud of shagbark hickory (Carya ovata) shows, opening buds can be every bit as beautiful as flowers. Many other buds like beech, oak, maple, and elm also open in May and are just as beautiful. I hope you’ll look for them this spring. 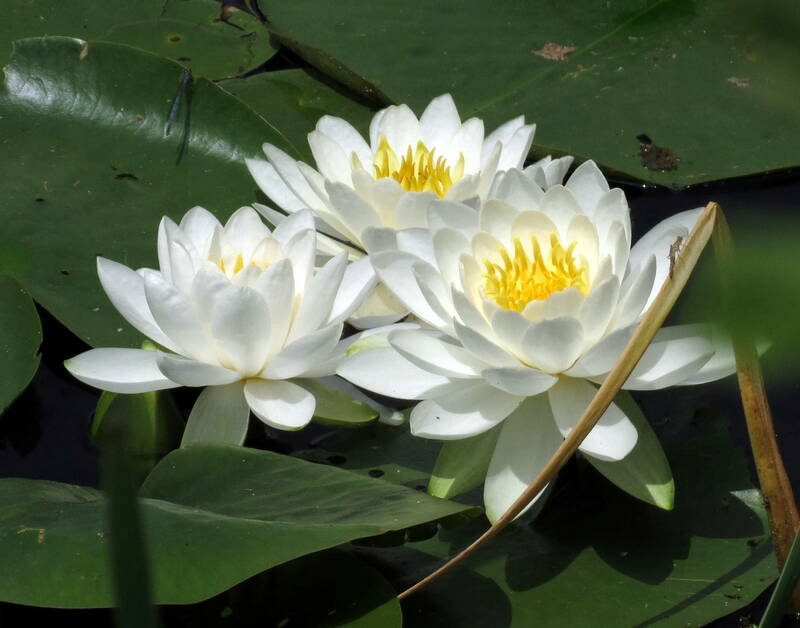 One of our most beautiful aquatic flowers, the fragrant white waterlily (Nymphaea odorata,) comes along in June. 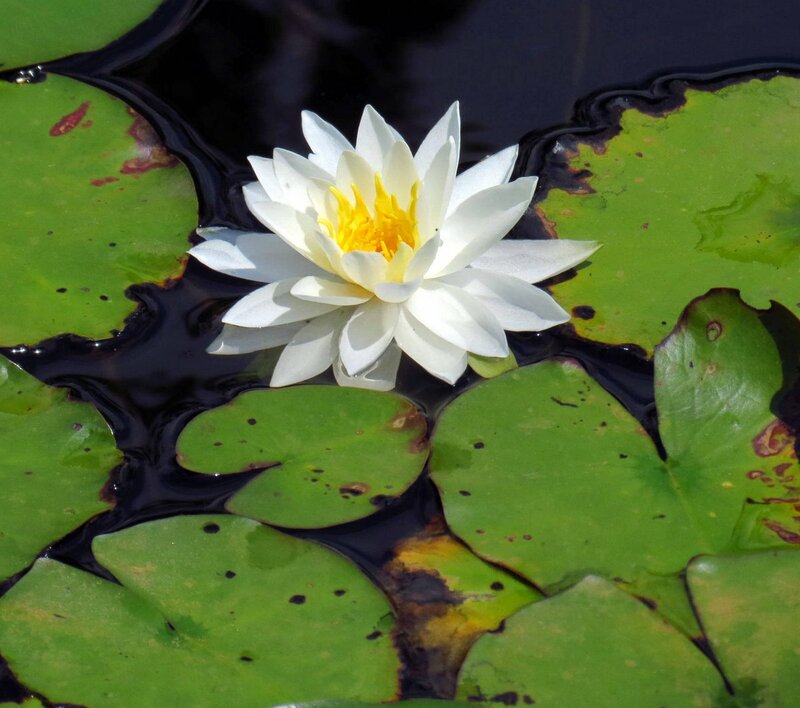 These plants bloom in still, shallow waters of ponds and along rivers. Each blossom lasts only three days but the plants will bloom well into September. Some say the blossoms smell like ripe honeydew melons and others say more spicy, like anise. It’s their beauty rather than their fragrance that attracts me and that’s probably a good thing because they’re a hard flower to get close to. 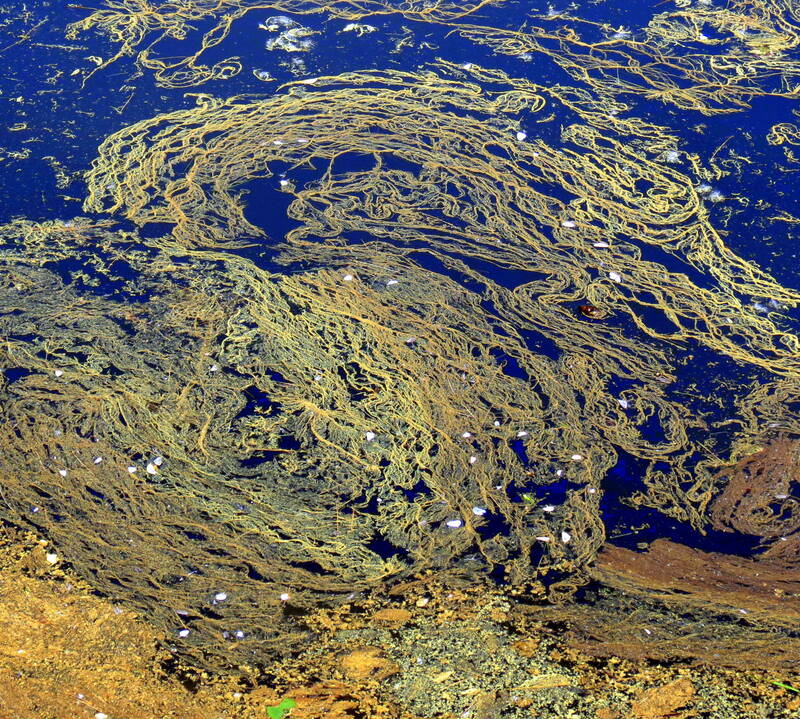 June is also when a lot of trees like oak, ash, willow, hickory, and others release their pollen to the wind and it ends up coating just about everything, including the surface of ponds, which is what this photo shows. The white petals are from a nearby black locust tree which had finished blossoming. 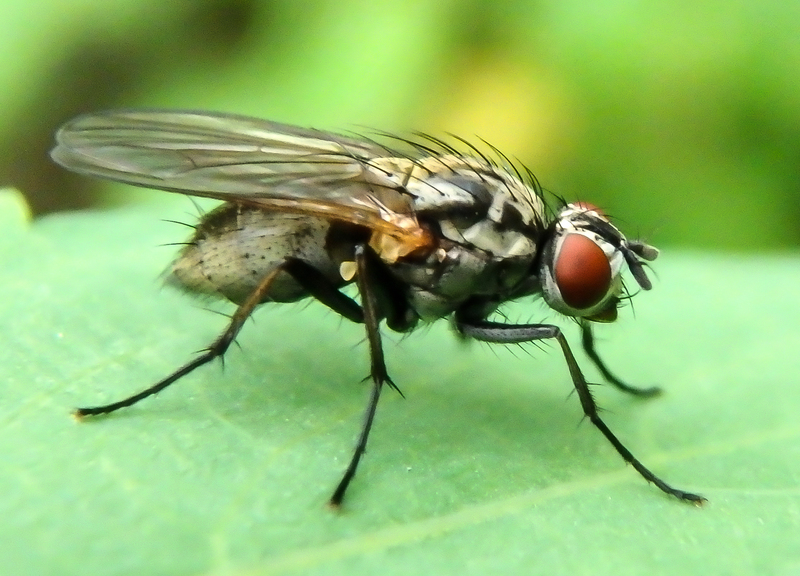 In July I saw a fly that was willing to pose. 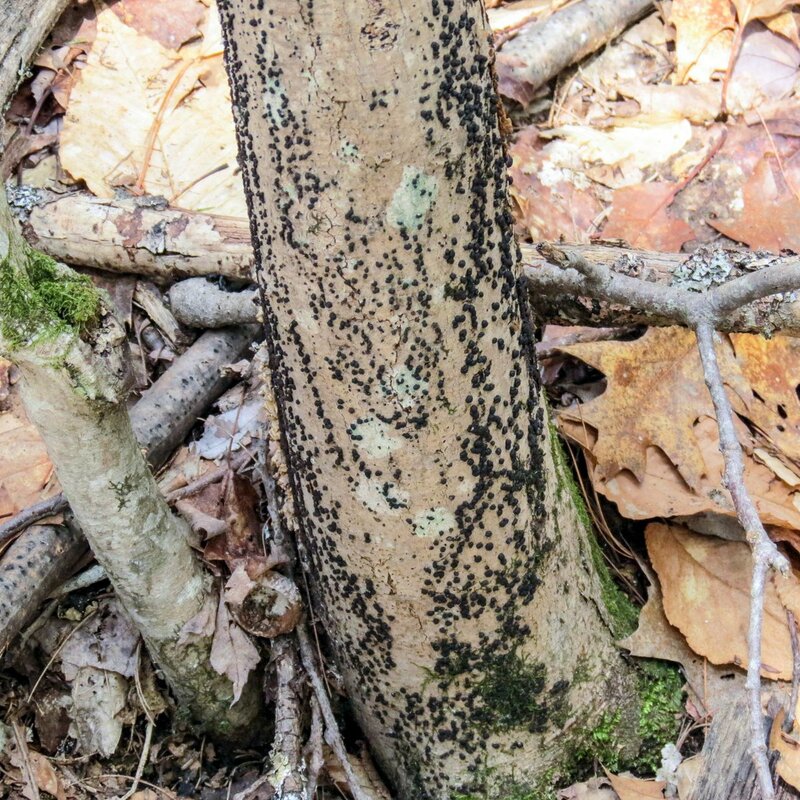 By the time the heat of July arrives insects like black flies and mosquitoes aren’t as bothersome as they were in the cooler months, but ticks are still a problem. Other insects of interest are monarch butterflies which often start to appear in July. I’ve seen more of them each year for the last two or three. 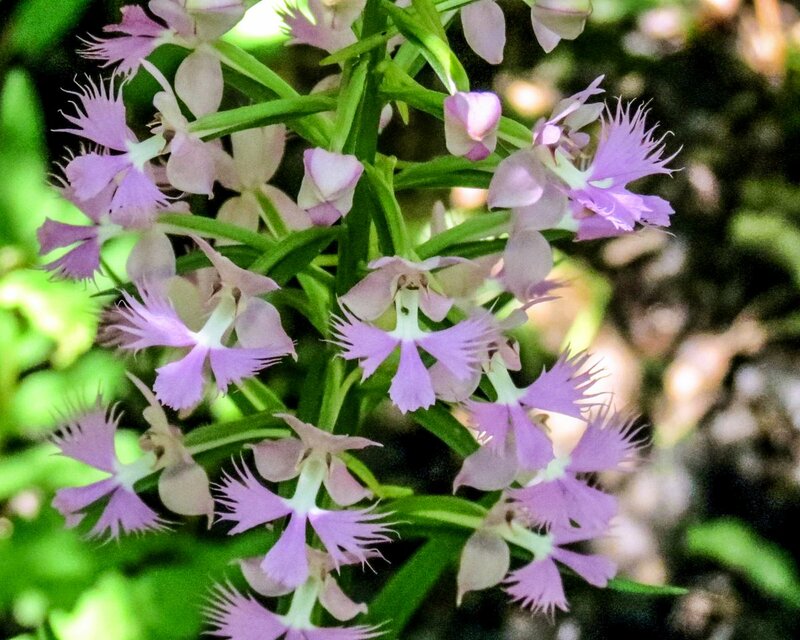 One of the things I most look forward to in July is the blooming of the greater purple fringed bog orchids (Platanthera grandifolia) I found growing in a swamp a few years ago. It is easily one of the most beautiful flowering plants I’ve seen, and I’ve seen a few. At one time there were so many of these plants Native Americans made tea from their roots, but I’ve only seen two plants in my lifetime and those grow almost beside each other, so I’d say they are very rare in this area. Many mushrooms usually appear in spring and then there is a bit of a lull before they start in again in late summer, but spring of 2018 brought a moderate drought so I had to wait until August to find beauties like this reddening lepiota (Leucoagaricus americanus.) This is a big mushroom with a cap that must have been 4 inches across. It is said to turn red wherever it is touched. August is also when our roadsides start to turn into Monet paintings. The larger wildflowers like goldenrod, purple loosestrife, Joe Pye weed and boneset all bloom at once and put on quite a show. Though fall can start in the understory as early as July when plants like wild sarsaparilla begin turning color it doesn’t usually happen with our trees until September. 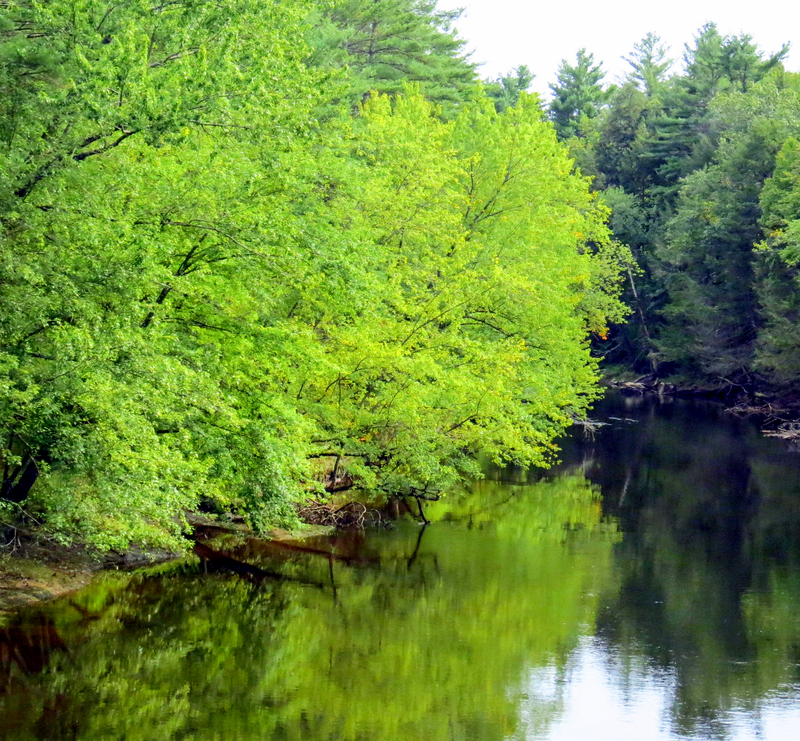 That was when I saw these maples along the Ashuelot River. 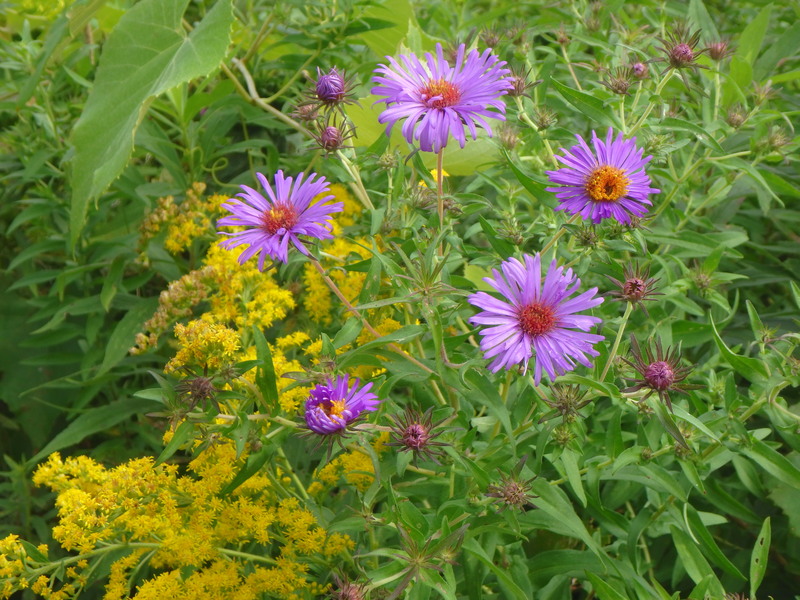 September is also when the New England asters begin to bloom. 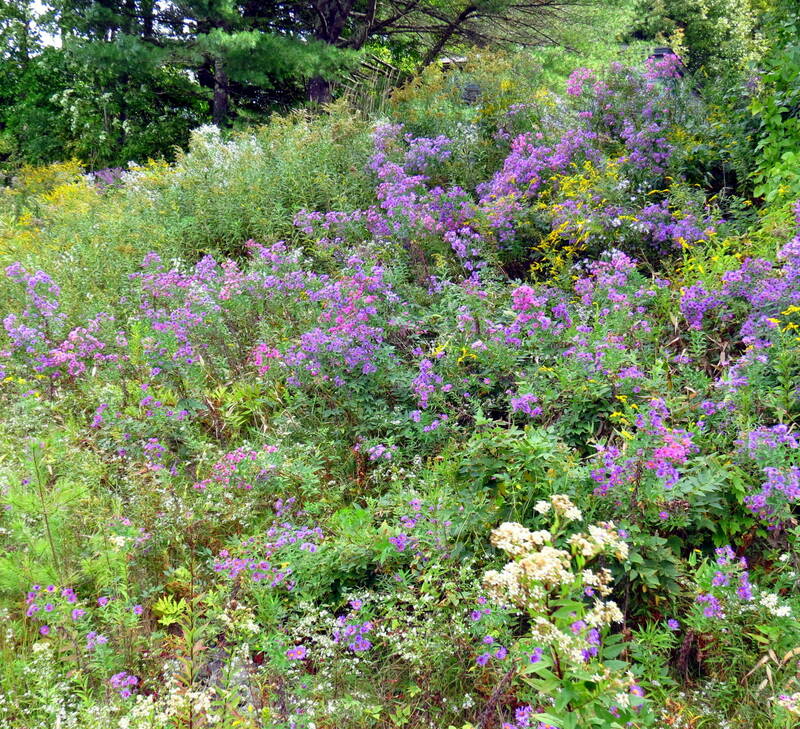 They’re one of our largest and most beautiful wildflowers and though my favorites are the dark purple ones seen in this photo, they come in many shades of pink and purple. 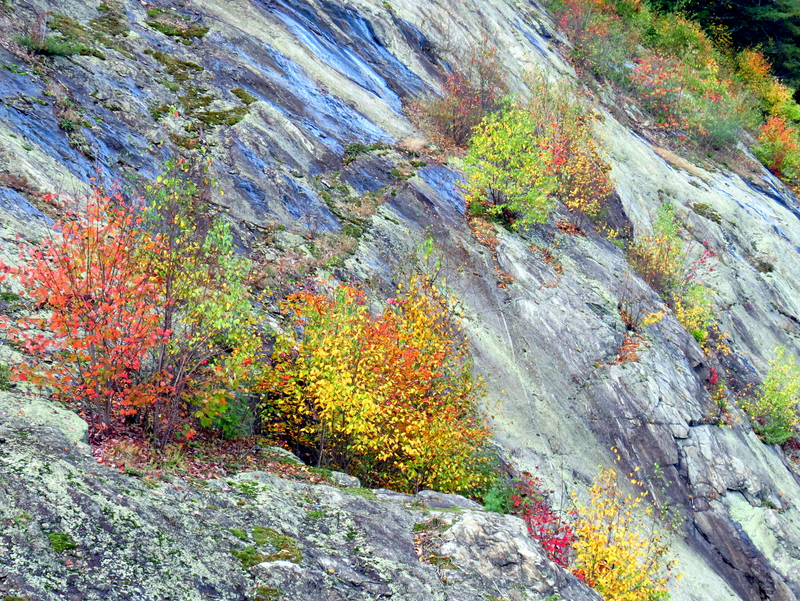 Fall foliage colors peak in mid-October in this part of the country and that’s when I saw these young birch trees clinging to stone ledges in Surry. The blue color came from the sky reflecting on the wet stone, and it made the scene very beautiful. You can still see plenty of beautiful roadside wildflowers in October but this is the month that usually brings the first real freeze, so by the end of the month all but the toughest will be gone. But there is still plenty of beauty to be seen, even in November. 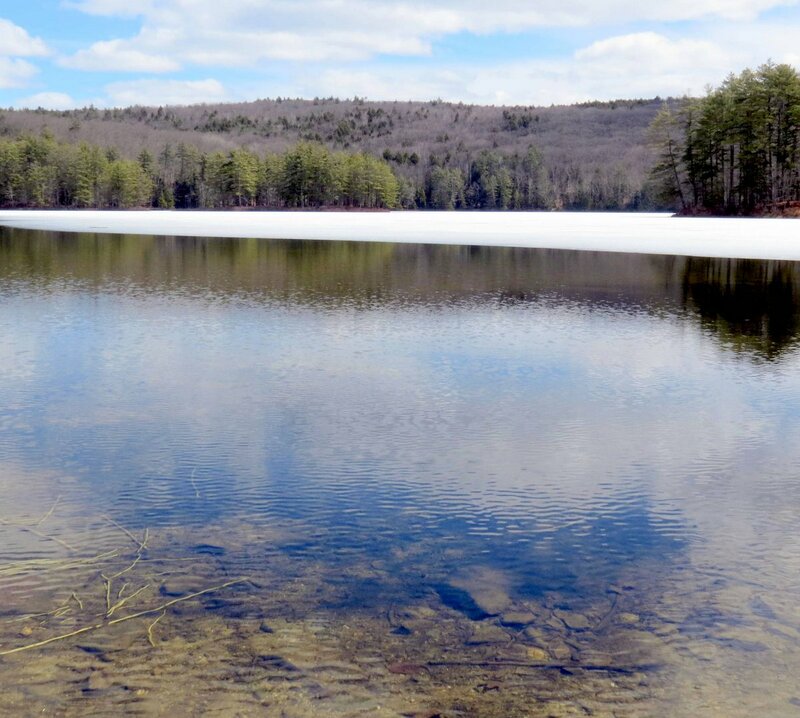 Very early in the month is the best time to see the beeches and oaks at Willard Pond in Hancock. This is easily one of the most beautiful spectacles of fall foliage color that I’ve seen and I highly recommend a visit, if you can. We don’t usually see much snow in November but in 2018 we hadn’t even gotten all the leaves raked when winter came barreling in. We had three snowstorms, one right after another, and that made leaf raking out of the question for this year. There is going to be a lot of cleaning up to do in spring. 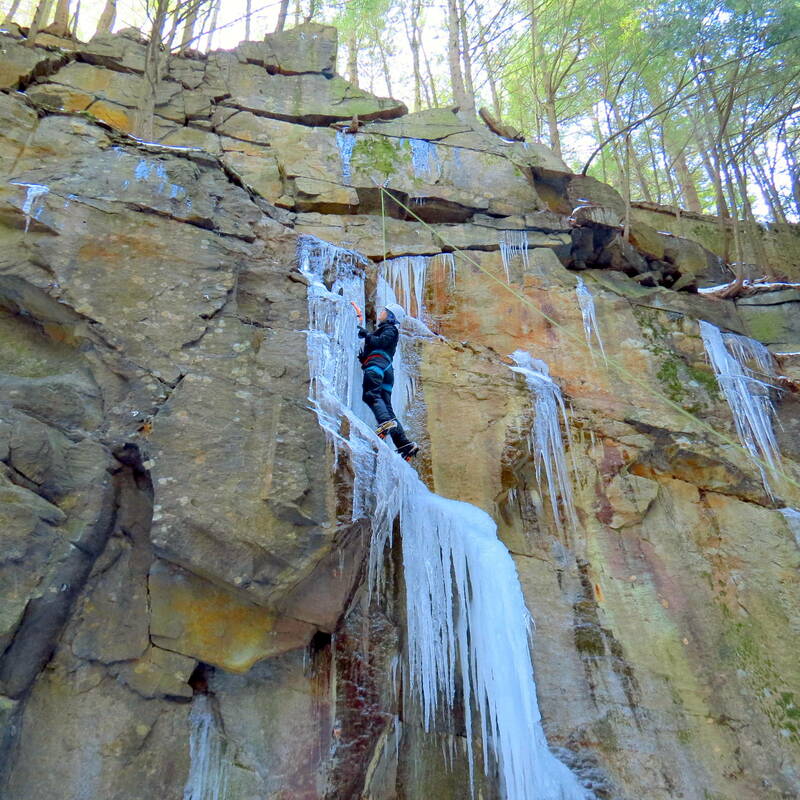 December started out cold but it didn’t last, and all the ice this ice climber was climbing was gone just a week later. They (ice climbers) call this deep cut railbed “The icebox” but this year maybe not. I’ll re-visit it sometime this month and see. 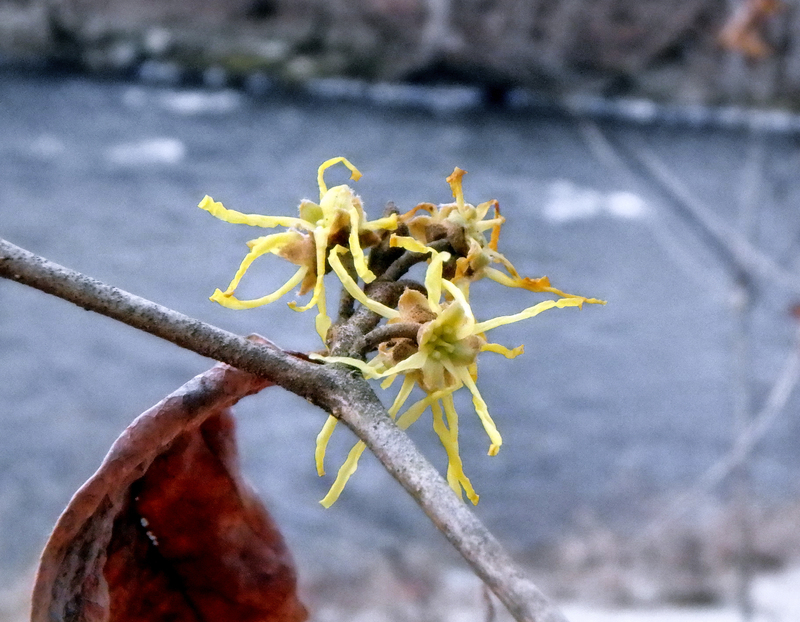 As of right now, 40 degree daytime temperatures are common and the witch hazel still blooms, so this is my kind of winter. I hope everyone has a very healthy and happy 2019. Thanks for coming by. 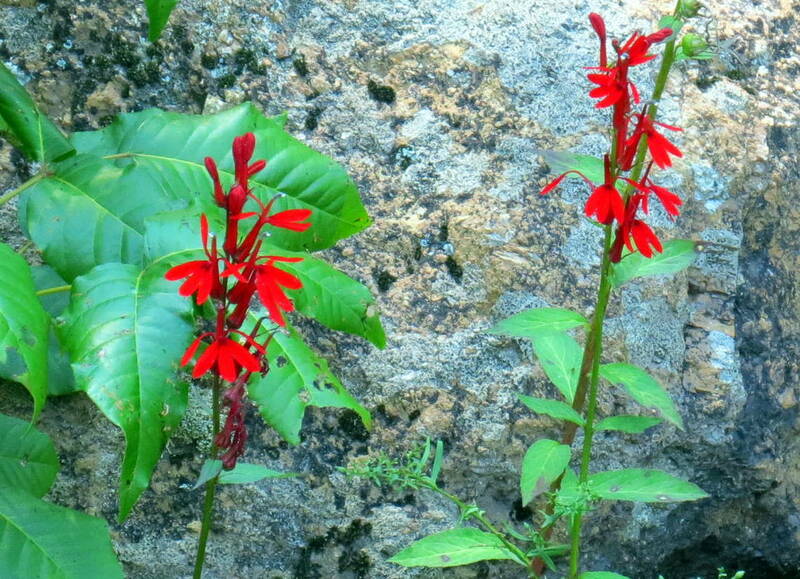 Because I have trouble seeing red I doubted I’d ever be able to show cardinal flowers (Lobelia cardinalis) on this blog but finally, after years of searching for them, here they are. Judy from the New England Garden and Thread blog wrote and told me she had seen them along a stream up in Stoddard and her excellent directions led me right to them. 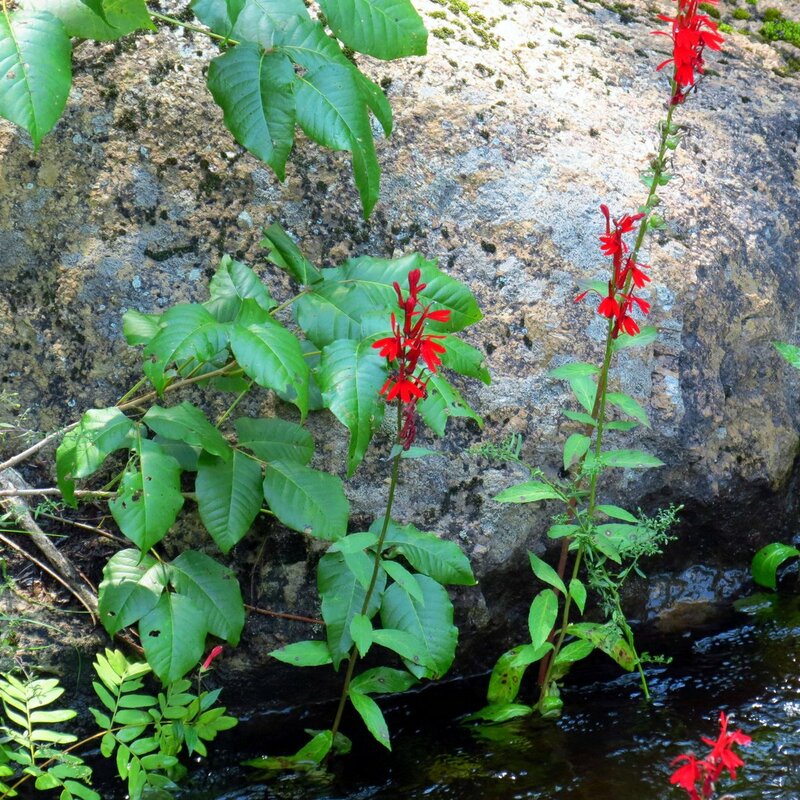 The color red when it is against the color green becomes invisible to me, but these bright red flowers were against gray stones and blue water and for the first time in my life I saw cardinal flowers. Though I couldn’t get close they were even more beautiful than in photos. Here’s a closer look. Unfortunately because of all the rain the stream had come up on the stems and the plants swayed back and forth wildly, which made getting a photo almost impossible. Out of probably close to 50 attempts I got exactly one useable photo and this one is cropped out of that single shot we saw previously. But the beauty of it all is now I know what the plants look like, where they grow and when they blossom, so I’ll be able to go back and see them next year. Thank you Judy, it was worth the drive! I can’t think of a single time that I have found northern water horehound (Lycopus uniflorus) growing away from water. It’s an odd little plant that might get knee high on a good day, and often leans toward the water that it grows near. 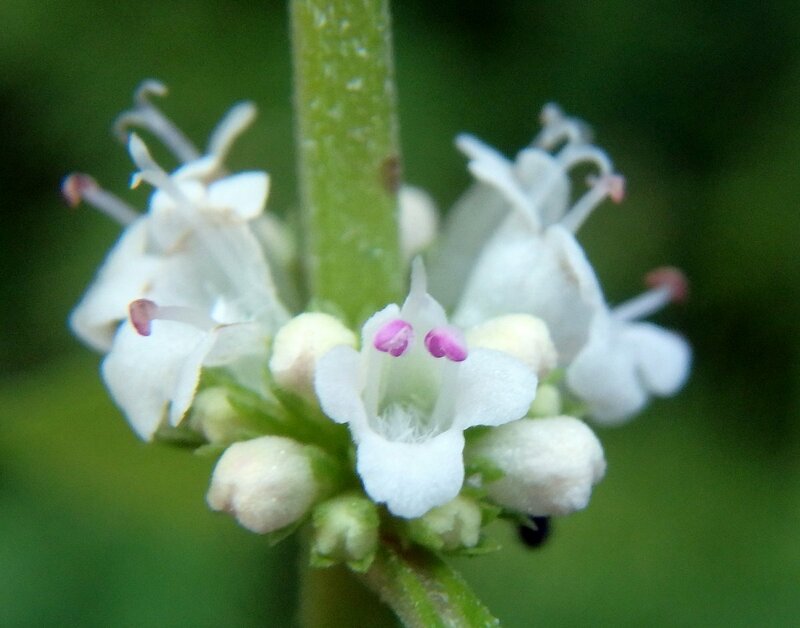 Its tiny flowers grow in round tufts at each leaf axil and remind me of motherwort, which has the same habit. 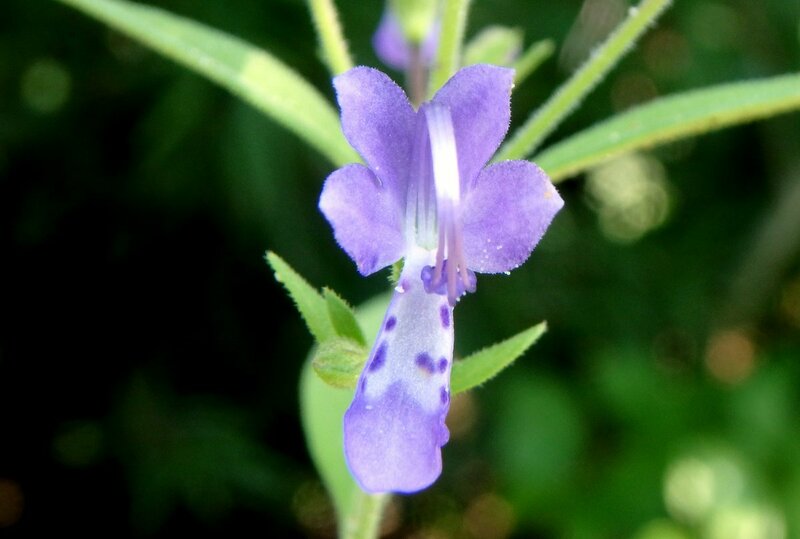 It is in the mint family and has a square stem as so many of the plants in that family do. 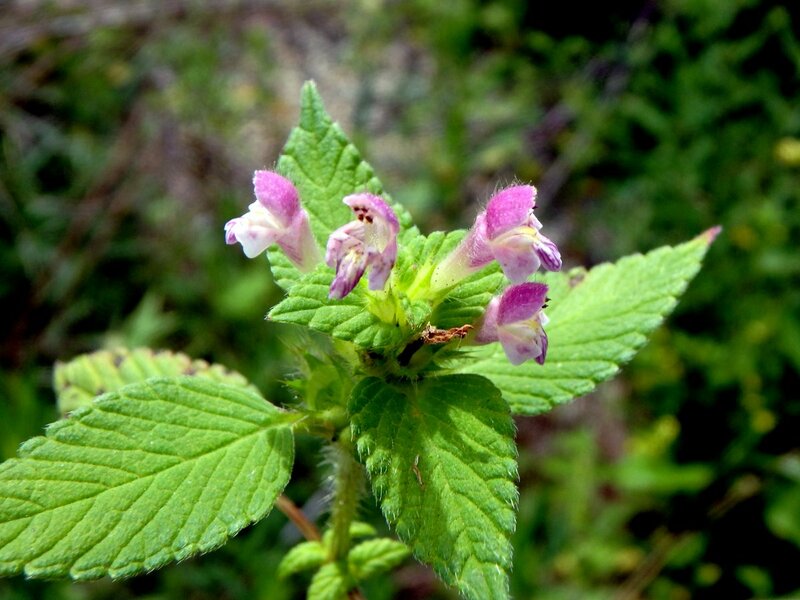 It is also closely related to American water horehound (Lycopus americanus) and the two plants are easily confused. Paying close attention to leaf shape helps tell them apart. The foliage is said to be very bitter and possibly toxic, but Native Americans used the tuberous roots for food. The flowers of northern water horehound are pretty little bell shaped things, but they are small enough to need a hand lens (or macro lens) to really appreciate them. The tiny things are pollinated by bees, wasps and flies and each one will become 4 small nutlets. I don’t know what birds or animals eat the seeds, but muskrats love the roots. Another name for the plant is northern bugleweed. I think this is the earliest I’ve ever seen it flower. 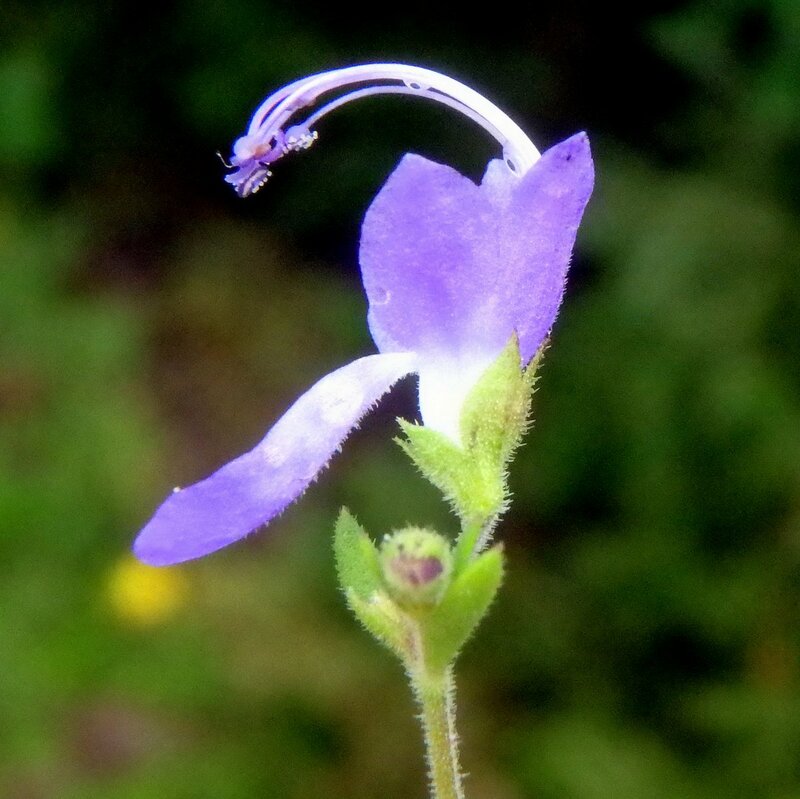 Forked blue curls (Trichostema dichotomum) have just started to bloom. I love their bright color and always look forward to seeing them as soon as August arrives. Eastern forked blue curls have beautiful flowers that might make a half inch across on a good day and the entire plant barely reaches ankle high, so it’s a challenging plant to photograph. One unusual thing about the flower other than its unique beauty, is its four long, arching stamens that dust bees with pollen when they land on its lower lip. You can just see the white pollen granules on the ends of the arched stamens in this photo. The insect is guided by the spotted lower lip of the flower. This plant is an annual that grows new from seed each year. It seems to like sandy soil and I find it growing along river banks and sometimes roadsides, and sometimes in my own yard. 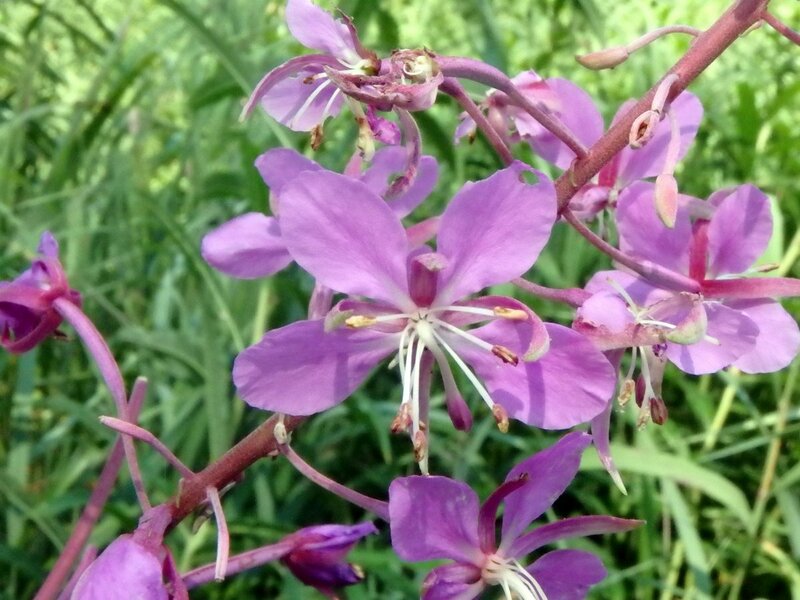 This very beautiful rosebay willowherb (Chamerion angustifolium) grows just off the side of an old dirt road at the edge of a swamp. At least I think it is rosebay willowherb; there seems to be some confusion among sources about the regions it grows in. According to the USDA it doesn’t grow in New England, but the University of Maine lists it in its database. 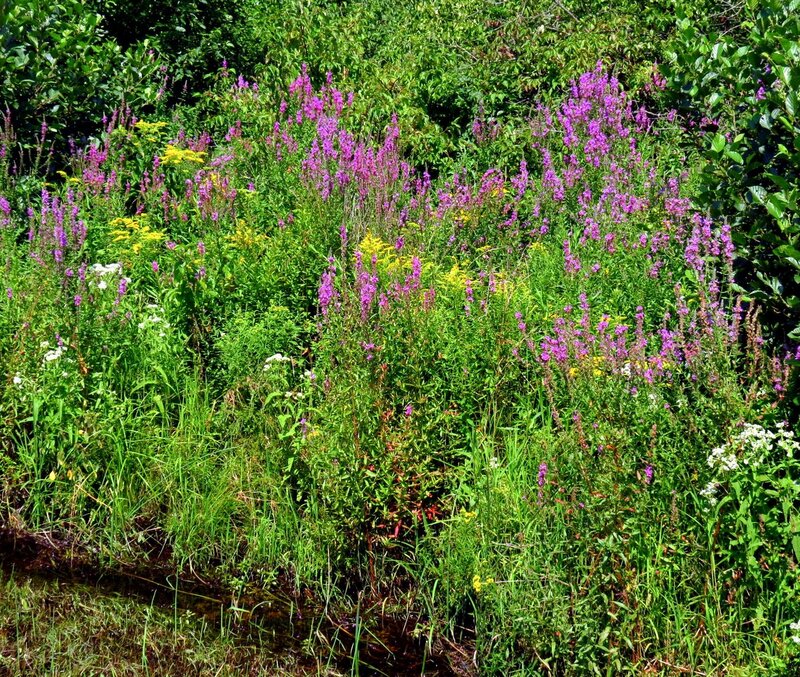 Another name for the plant is fireweed and Henry David Thoreau mentions seeing great stands of it in 1857, so I’m wondering if the USDA map is incorrect. 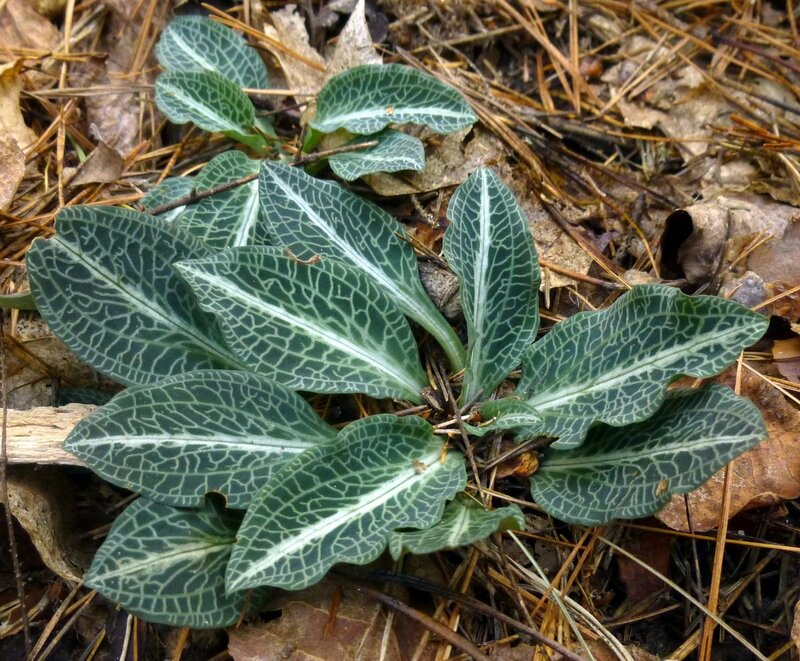 If you live in New Hampshire and have seen this plant I’d love to hear from you. 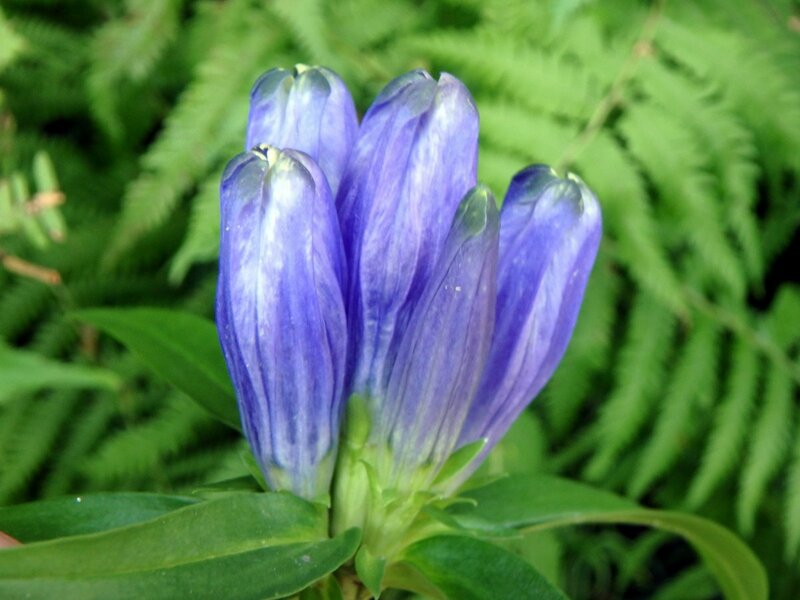 Narrow leaved gentians (Gentiana linearis) grow alongside the same road that the rosebay willowherbs were on. Gentians of any kind are extremely rare in these parts and I’m always as excited to see them as I would be to see a field full of orchids. Narrow leaf gentians like moist, calcium rich soil and that’s one reason you don’t see them here very often, because our soil is generally acidic. Another reason is that the flowers never open so insects have to force their way in, and it takes a strong insect like a bumblebee to do so. Third is how its seeds are too small to interest birds and its foliage too bitter to interest herbivores. Put all of that together and it’s a wonder that this plant is seen at all. It’s listed as rare, endangered or vulnerable in many areas. I love its beautiful deep blue color and I hope this small colony will spread. Luckily readers have told me that there are also other hidden colonies of it in Nelson as well. It isn’t uncommon to see a carpet of knee high, white blooms in the woods at this time of year. 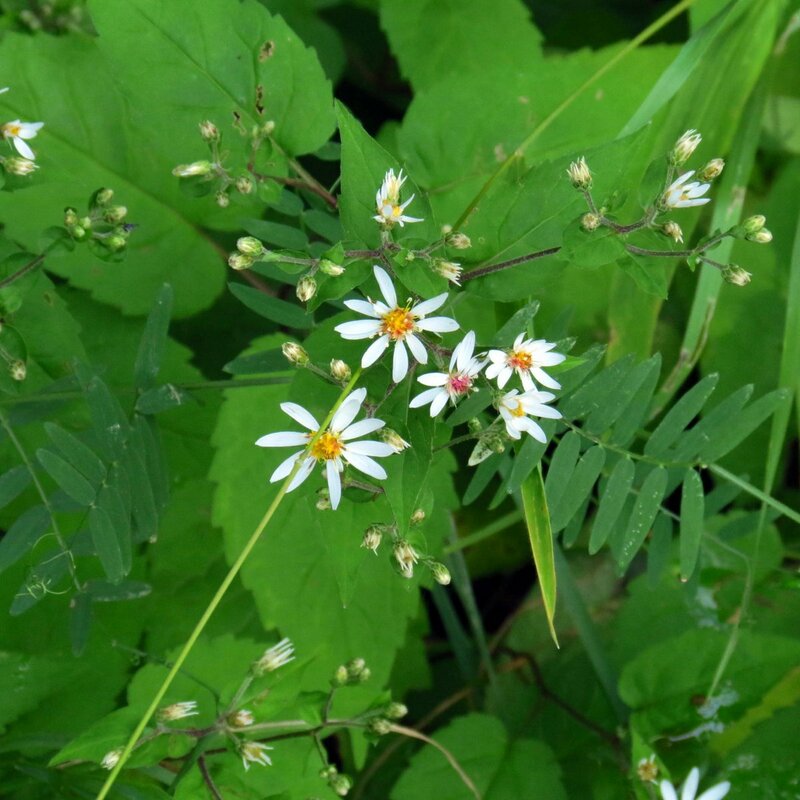 White wood aster (Aster divaricatus) is known for its drought tolerance and will grow under a heavy leaf canopy. The stalked, coarsely toothed, heart shaped leaves help with identifying this plant. The small, one inch flowers of white wood asters can have red or yellow centers. This aster is very easy to grow and makes an excellent choice for a dry shaded woodland garden. It is best used in mass plantings and many nurseries sell native asters grown from seed. Where I work they’re used as under plantings for lilacs, but the choice was theirs and they moved under the lilacs completely on their own. 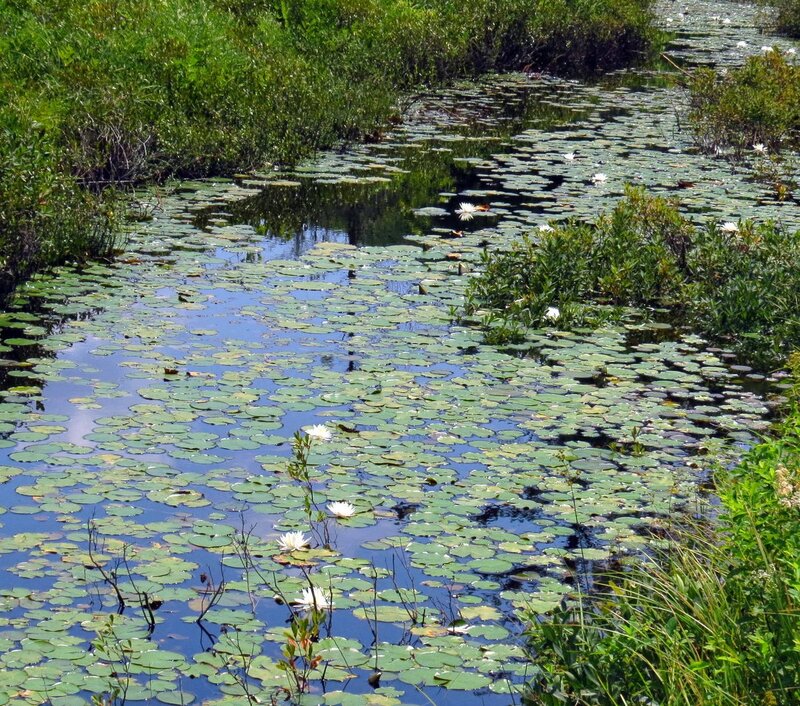 A roadside stream was filled with fragrant white water lilies (Nymphaea odorata) and I had to stop and see. It’s hard not to just sit and stare at something so beautiful, lost in the fire that burns at its center. I first met the beautiful little marsh St. John’s wort (Hypericum virginicum) when I was in a kayak and I remember what a time I had getting a photo of them then. Luckily though, I found them growing in the wet soil at the edge of a pond so getting their photo is easier these days. Sort of, anyway; this plant closes its flowers at night and won’t open them again until they’re in full sunshine the following afternoon, so you’ll never find them blooming on a cloudy day or in the morning. This is the only St. John’s wort I know of with pink flowers; all of our other St John’s worts are yellow. 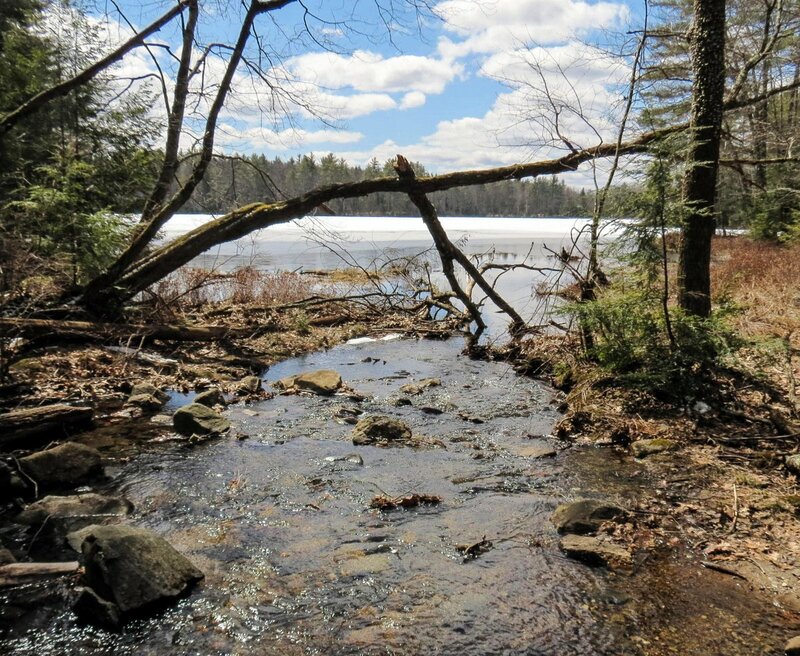 The plant likes saturated soil and will even grow in standing water at the shoreline. The flowers are small, about 3/4 of an inch across on a good day but usually more like 1/2 an inch. This beautiful little shin high plant grows south to Florida and crosses the Mississippi River only in Texas and Oklahoma. Like the cardinal flower seen earlier the club spur orchid (Platanthera clavellata) has never been seen on this blog, because I’ve never seen one until very recently. I jumped a roadside ditch, looked down and discovered that I was almost stepping on a group of 5-7 plants. They’re small plants, no taller than 6 inches, and the flowers are also very small. Each plant has a single leaf at the base of the stem and another about half way up. The flowers of this orchid seem to go every which way, spiraling up the stem as they do, so getting a photo of just one is impossible. I couldn’t even seem to get a shot looking into one. My orchid books say this orchid is “occasional“, meaning it isn’t rare but it isn’t common either. It self-pollinates so it doesn’t have to rely on insects. Orchids are notorious for disappearing from one year to the next but I hope to see these again. 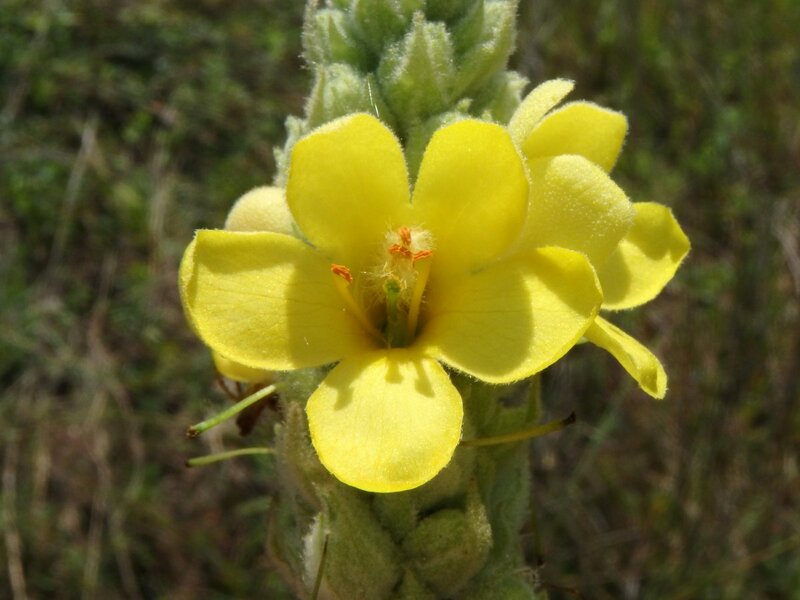 The flowers of mullein (Verbascum thapsus) grow in a great long spike and they bloom from the bottom to the top. Once the blossoms reach the very top of the flower spike the plant is done. Native Americans used tea made from its large, gray green furry leaves to treat asthma and other respiratory ailments. It is also said to be useful as a relaxant and sleep aid. 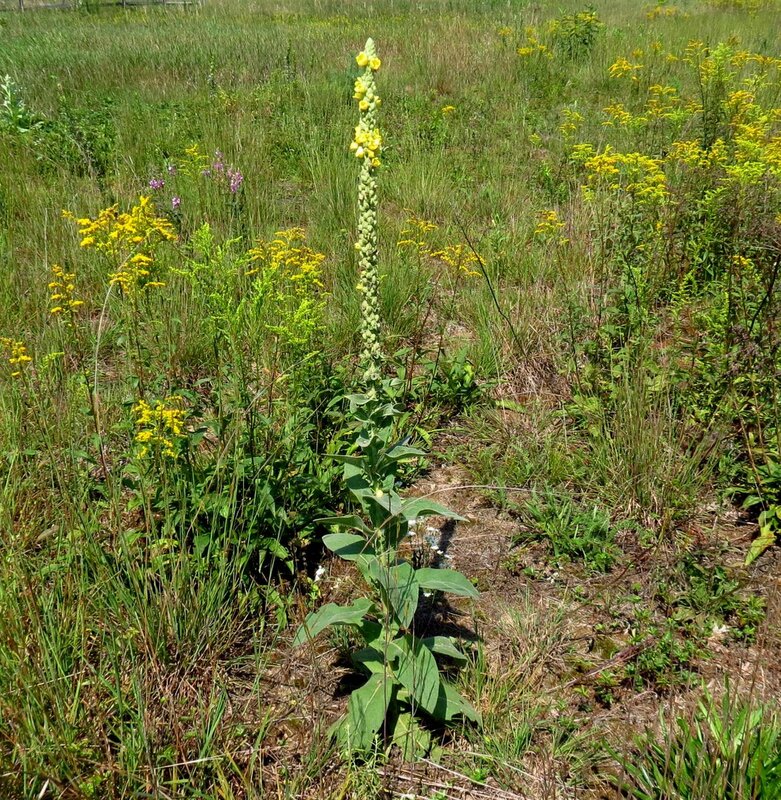 Mullein is a biennial and flowers and dies in its second year of growth. It is considered a weed but if all of its flowers opened at once along its tall flower stalk I think that it would be a prized garden specimen. 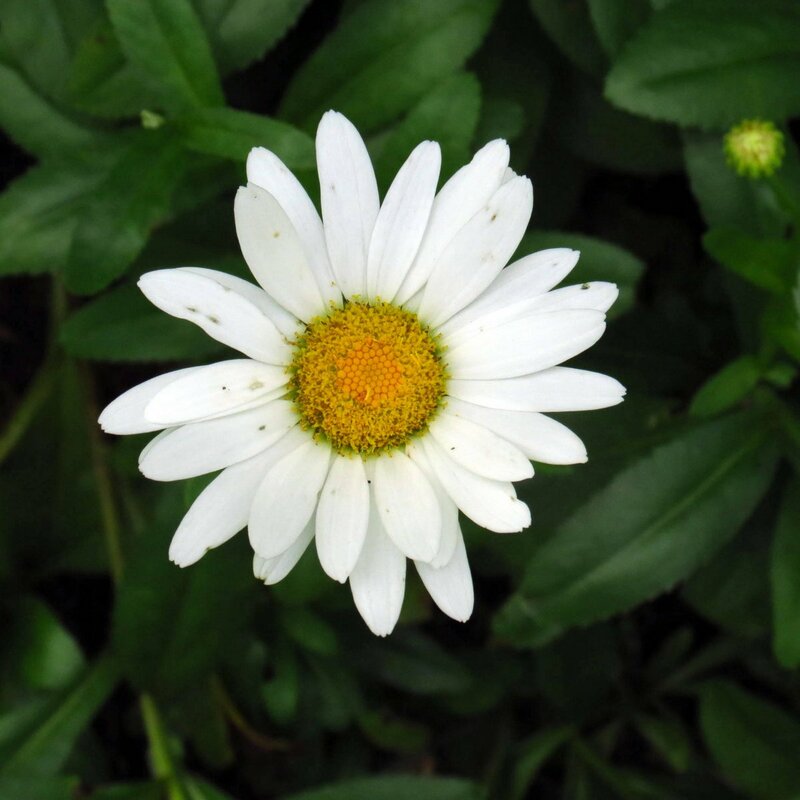 The Shasta daisy was developed by plant breeder Luther Burbank over 100 years ago and was named for the white snow of Mount Shasta. These plants are a hybrid cross of the common roadside ox-eye daisy and an English field daisy called Leucanthemum maximum. They are one of the easiest perennials to grow and, other than an occasional weeding, need virtually no care. Dwarf varieties are less apt to have their stems bent over by heavy rains. I haven’t seen many of them this year, and this one was quite late. I’m still seeing scenes like this one here and there along roadsides and I always try to stop and get a photo when I do. That leads to a few curious stares from people but I hope they also notice the flowers when they stare. Next time maybe it will be they who will stop and take photos. 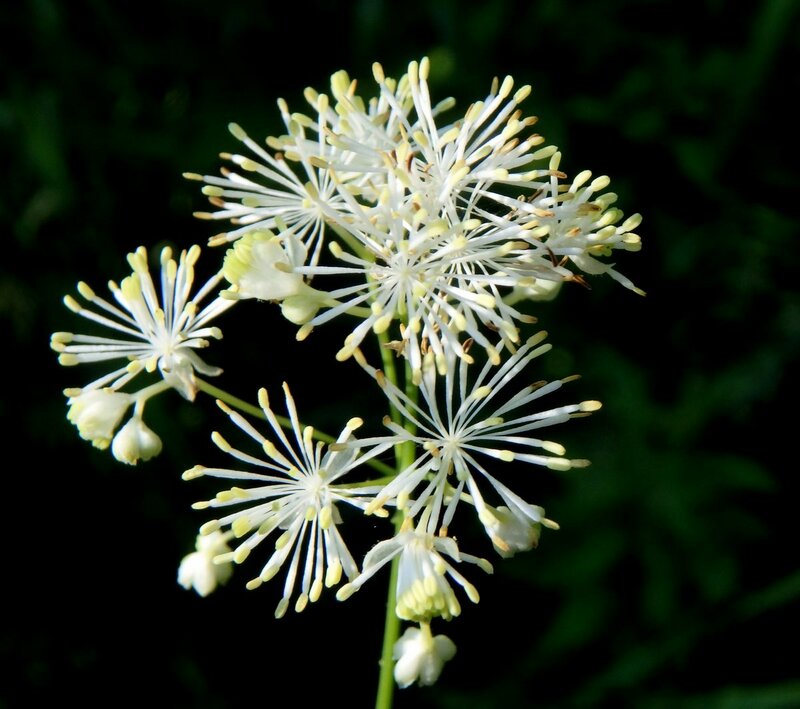 Tall meadow rue flowers (Thalictrum pubescens) always bloom close to the 4th of July and always remind me of “bombs bursting in air.” These are the plant’s male flowers; starbursts of petal-less dark yellow tipped stamens. I don’t see tall meadow rue in meadows unless the meadow is very wet. I usually find it growing at the edge of streams or in ditches as the example in the above photo was. In fact this one sat just where a ditch met a stream. It was down an embankment, which was a good thing because it often grows 7-8 feet tall and towers over me. Getting above it is usually next to impossible without a ladder. 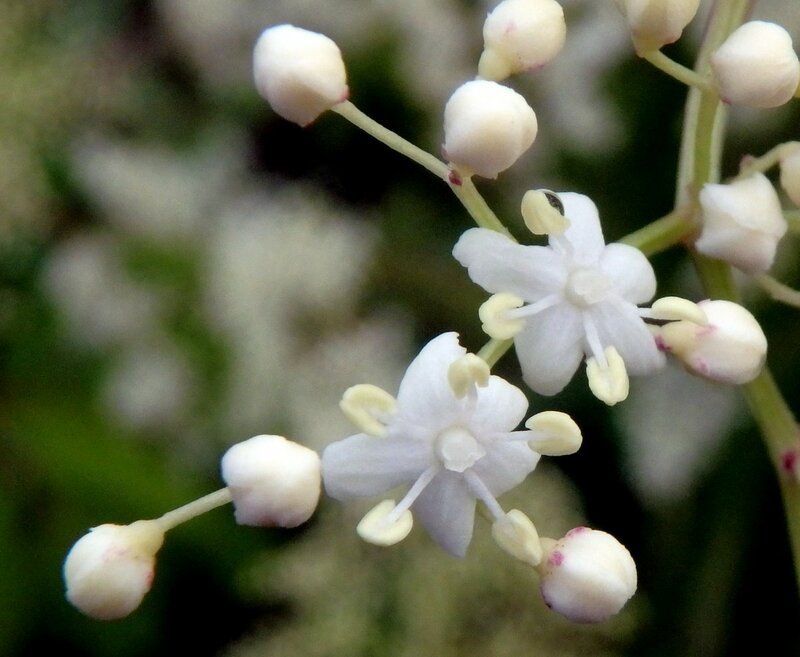 Native Americans are said to have given lethargic horses ground meadow rue leaves and flowers to increase their vigor and to renew their spirit and endurance. 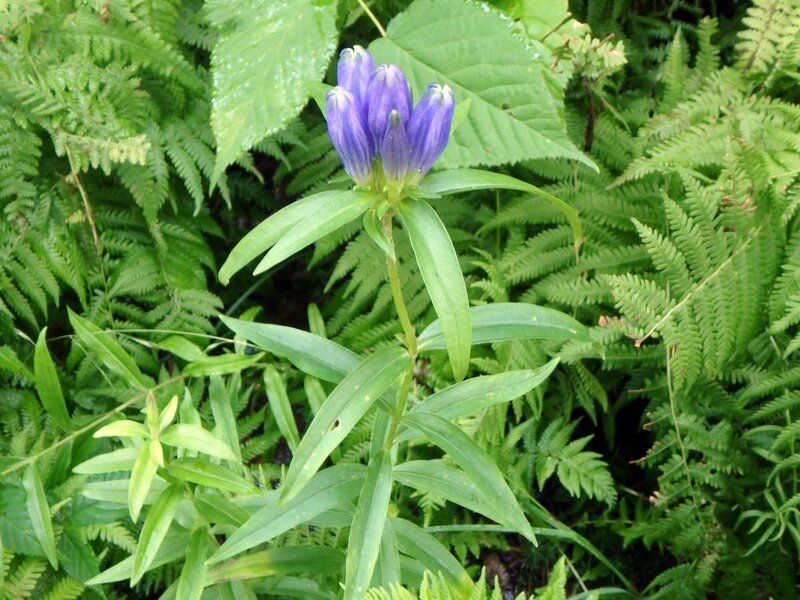 In spring the plant’s young leaves fool many into thinking they’ve found wild columbine. 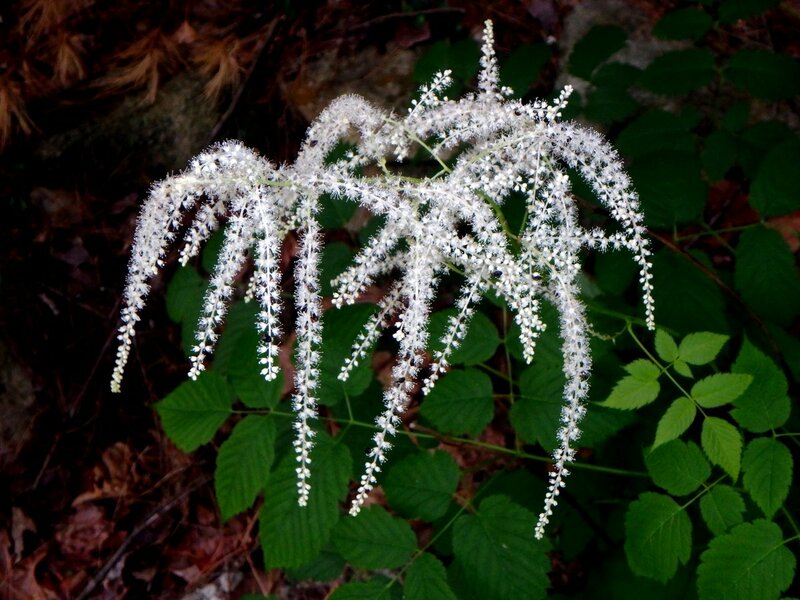 Goat’s beard (Aruncus dioicus) also reminds me of fireworks. This one grows in my garden and also reminds me of the friend who gave it to me several years ago. Hers grew to towering heights but this one usually stays at about three feet. This beautiful hedge bindweed (Calystegia sepium) blossomed after the rain we finally got last Thursday. It wasn’t enough but it helped. Though for many years all I ever saw were white flowered hedge bindweeds it has gotten to the point where all I see now are these bicolor ones. 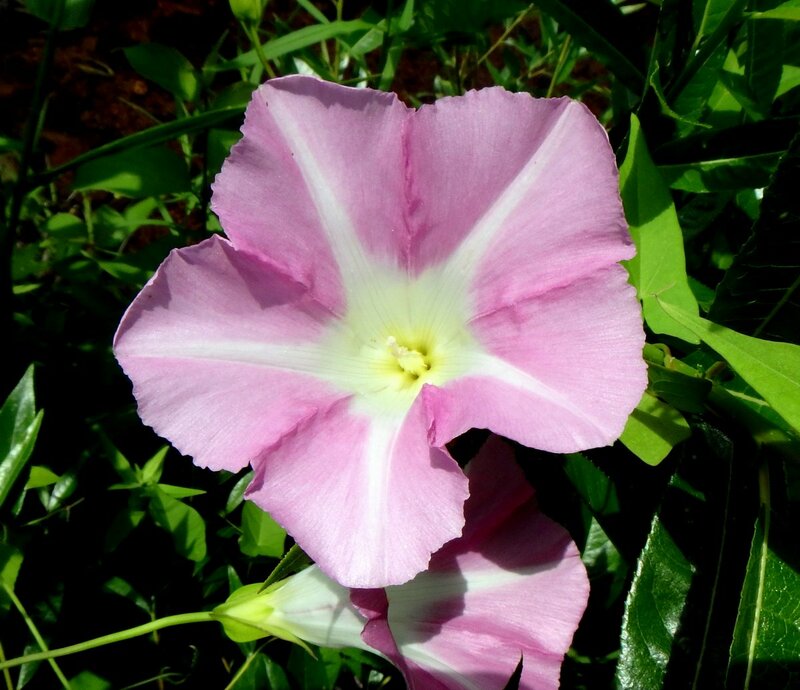 Bindweeds are perennial and morning glories are annuals and one good way to tell them apart is by their leaves; morning glory (Ipomoea) has heart shaped leaves and bindweed has narrower arrowhead shaped, triangular leaves. As I was admiring the hedge bindweed blossoms I happened to glance over to where one of our most beautiful wildflowers bloomed. Canada lilies (Lilium canadense) are blooming about two weeks early this year. These plants are sometimes very tall and can tower over a person of average height but this one came only to my chin, and I’m not tall. 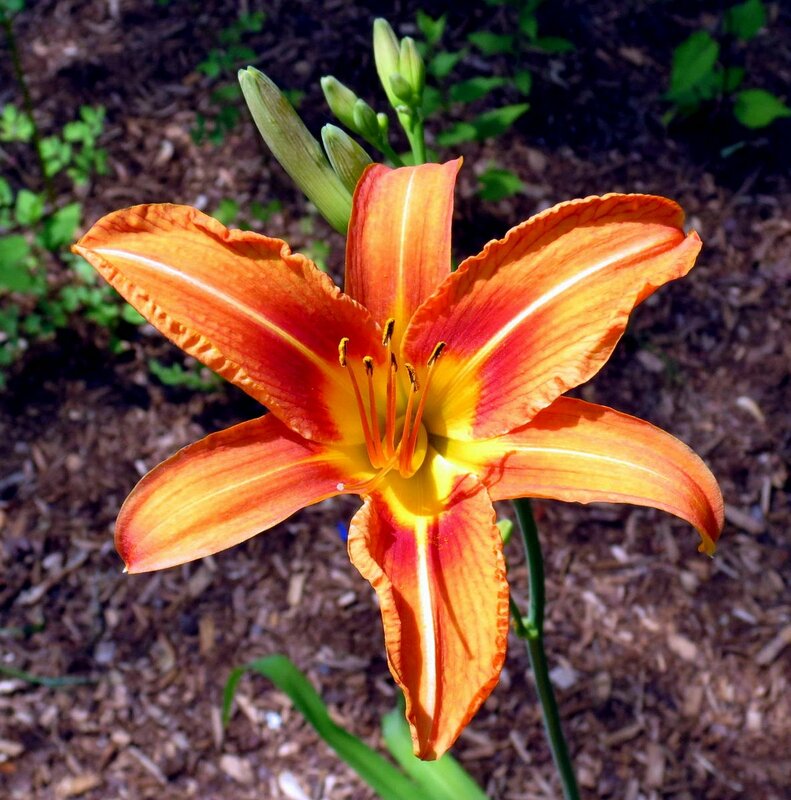 The common orange daylily (Hemerocallis fulva) doesn’t have Lilium in its scientific name because daylilies aren’t a true lily. 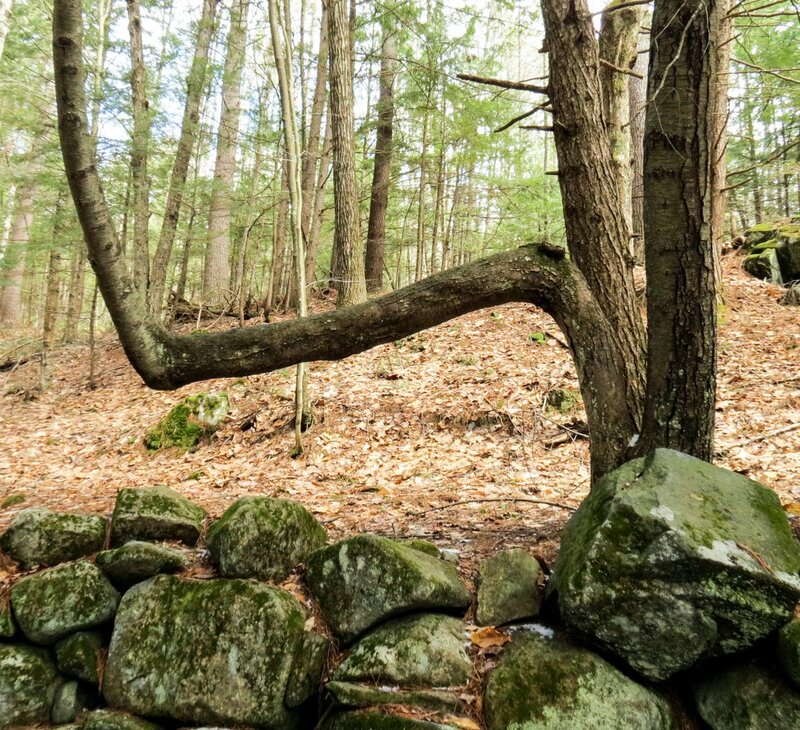 It’s a plant you’ll find growing near old stone cellar holes out in the middle of nowhere and along old New England roads. 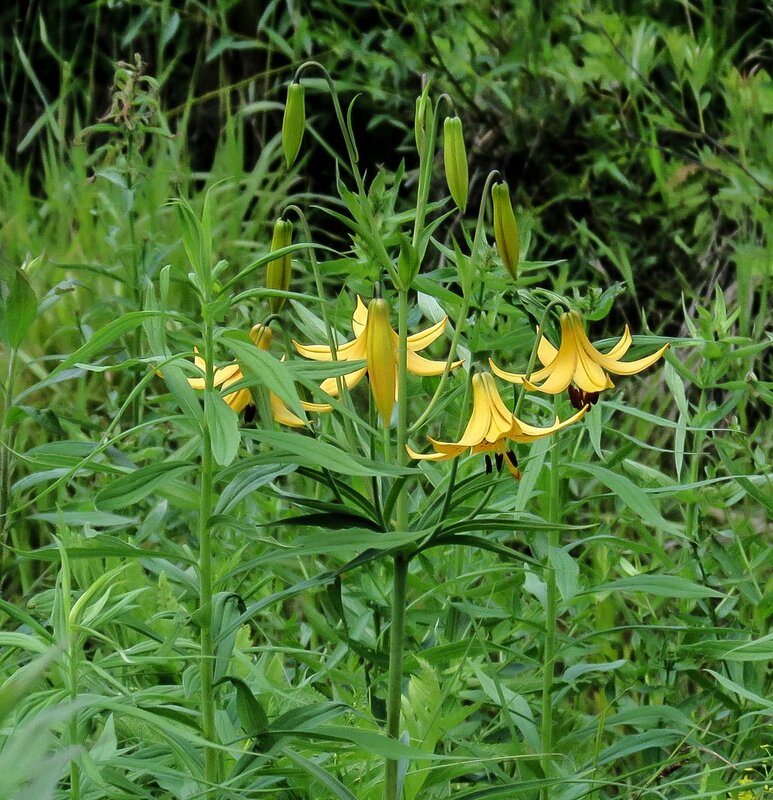 It is often called the ditch lily, because that’s where it grows. 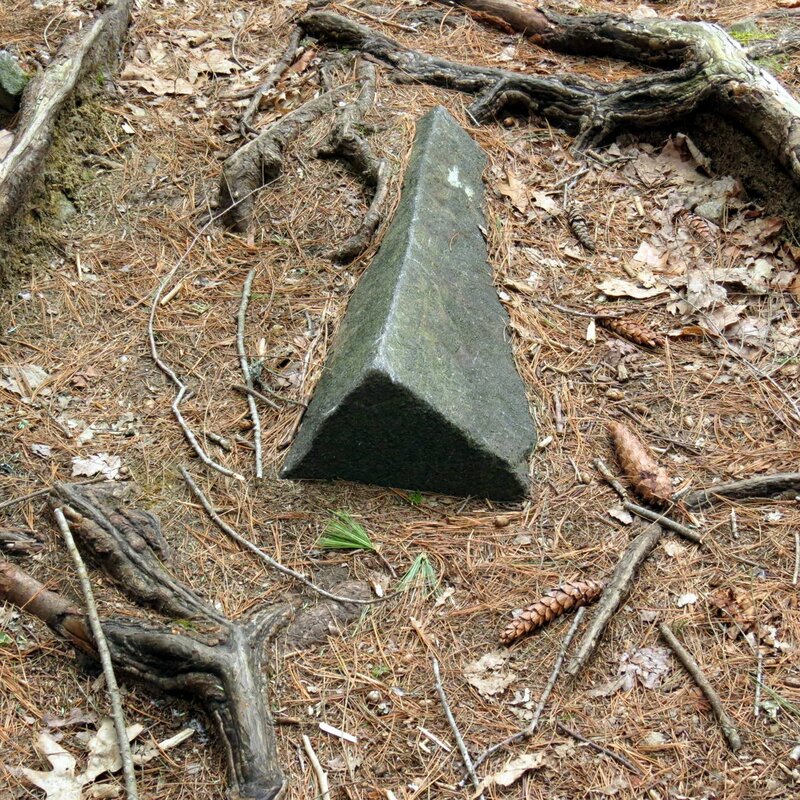 It is also found in cemeteries, often planted beside the oldest graves. It is one of those plants that were passed from neighbor to neighbor and spread quickly because of it. These days it is one of those plants that new homeowners go out and dig up when they can’t afford to buy plants for their gardens. It is both loved for being so easy to grow and hated for being so common. 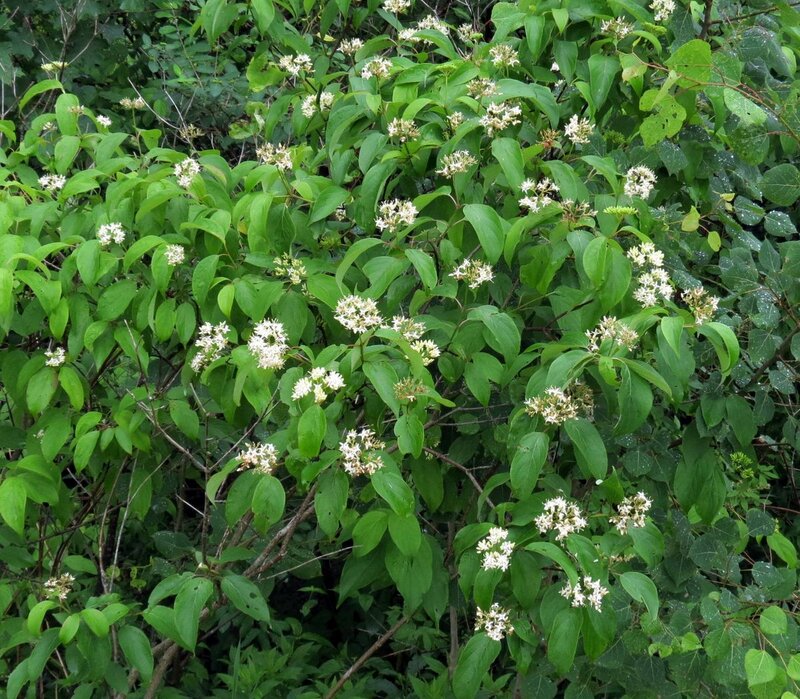 If you see a flat topped flower cluster on a native dogwood it’s either a silky dogwood (Cornus amomum) or red osier dogwood (Cornus sericea.) If the flower cluster is slightly mounded it is most likely a gray dogwood (Cornus racemosa,) as is the one in the above photo. All three shrubs bloom at about the same time and have similar leaves and individual white, four petaled flowers in a cluster and it’s very easy to mix them up. Sometimes silky dogwood will have red stems like red osier, which can make dogwood identification even more difficult. Both gray and red osier dogwoods have white berries. Silky Dogwood has berries that start out blue and white and then turn fully blue. Native dogwoods are also sometimes confused with viburnums, but viburnum flowers have five petals and dogwoods have four. Most of our native dogwoods like soil that is constantly moist and they can be found along the edges of ponds, rivers, and streams. Common milkweed (Asclepias syriaca) has just started blooming here but I haven’t seen any monarch butterflies in the area yet. I keep hoping they’ll make a comeback and we’ll once again see them in the numbers we did when I was a boy. I’ve only seen a handful each year for the past several years but last year they seemed a little more plentiful. Several times over the years I’ve meant to write about how complicated milkweed flowers are to pollinate but the process is so complicated the task always ends up in my too hard basket. Instead I’ll just ask that you trust me when I say that it’s nearly a miracle that these flowers get pollinated at all. I’ll enjoy their beauty and their wonderful scent while trusting that nature will see to it that they’re pollinated, just as they have been for millennia. 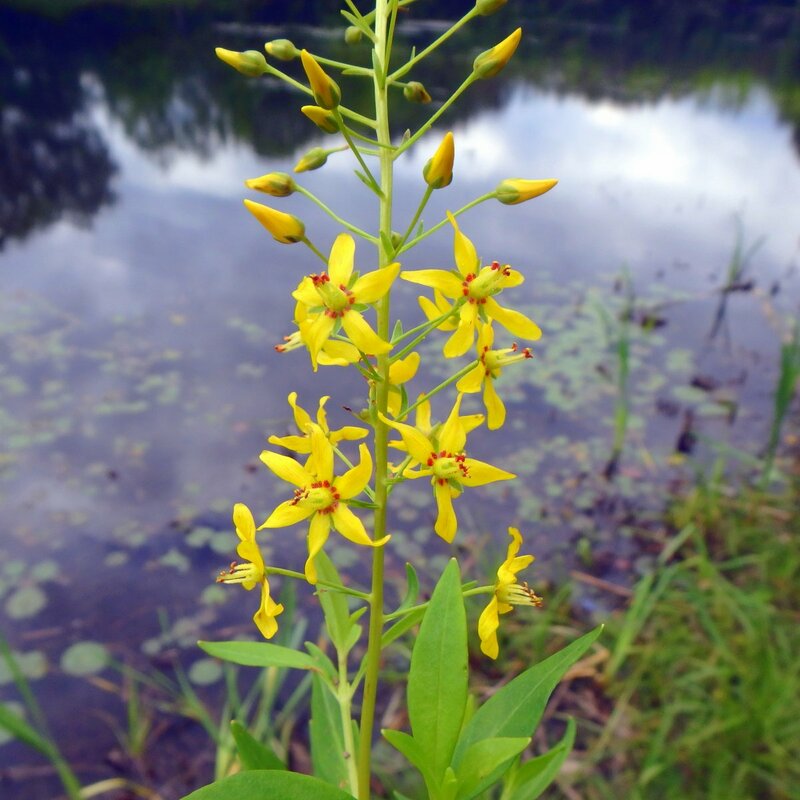 Native swamp candles (Lysimachia terrestris) are another yellow loosestrife that blooms at about the same time as the whorled loosestrife. Not surprisingly, they like to have their feet wet most of the time and are common along the edges of ponds and wetlands at this time of year. I’ve even seen them growing in standing water. These plants stand about 1-2 feet tall and have a club shaped flower head (raceme) made up of 5 petaled yellow flowers. With darker vegetation behind them swamp candles really live up to their name. 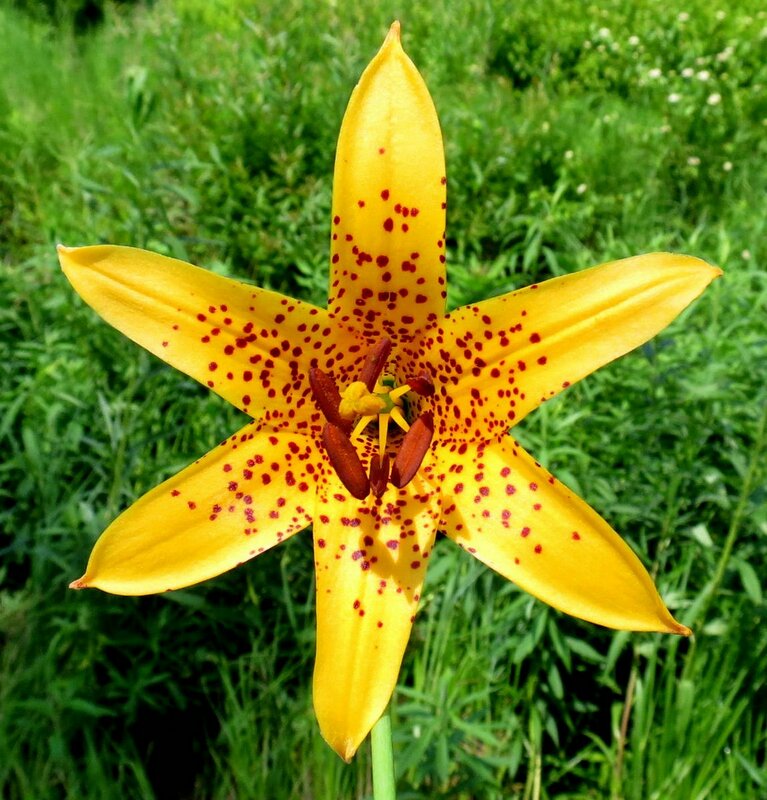 Each yellow petal of a swamp candle flower has two red dots at its base that help form a ring of ten red dots around the five long stamens in the center of the flower. The petals are streaked with red and the flowers are about half the size as those of whorled loosestrife. The red dots on these petals seem to have run a bit and blended together. This is the first time I’ve seen this. Pretty fringed loosestrife (Lysimachia ciliata) is the last of the native yellow loosestrifes to bloom in this area. It’s also the tallest and biggest flowered of the three yellow loosestrifes we have. Great colonies of the knee high plant can be found along roadsides and wood edges, and along waterways. 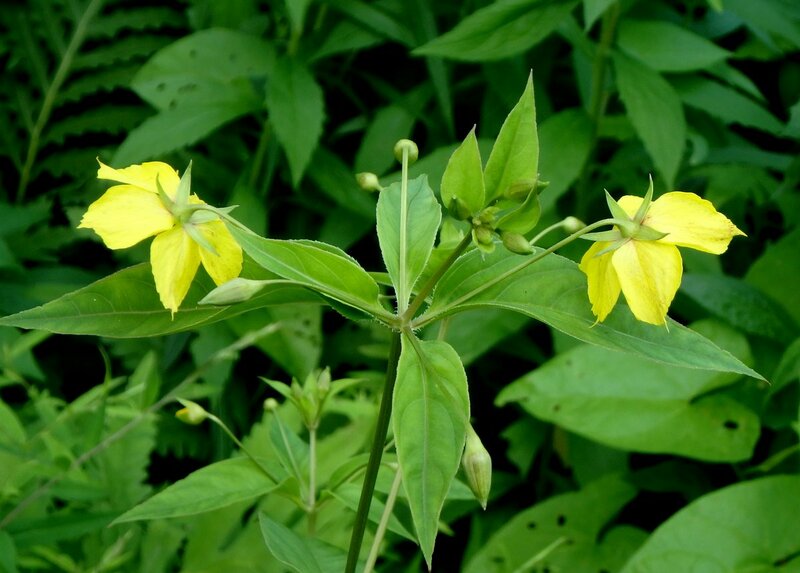 It might be confused with whorled loosestrife (Lysimachia quadrifolia) if the two plants bloomed at the same time, but in this area fringed loosestrife usually blooms later. Like the lilies, this year it’s about two weeks early. 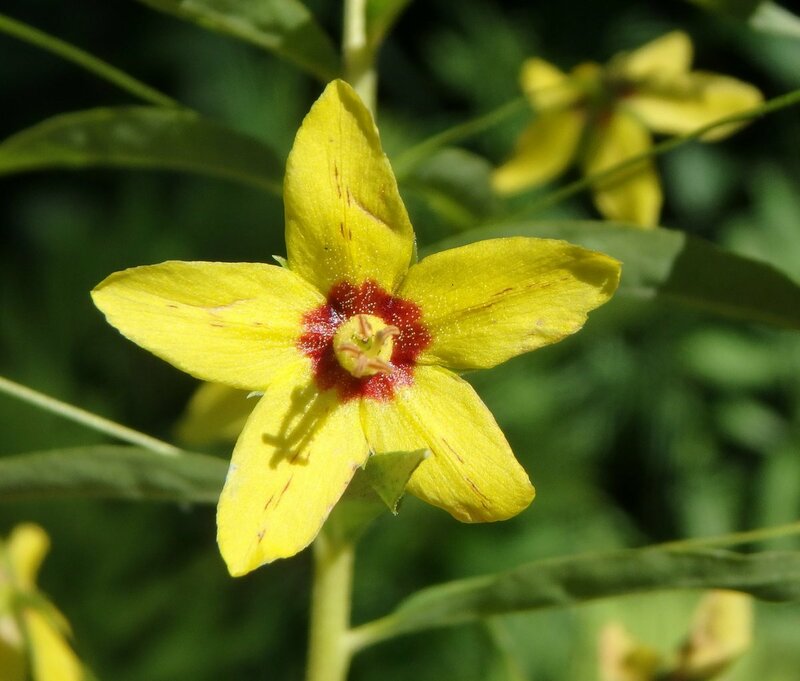 The flowers on fringed loosestrife are about the size of a quarter and nod to face the ground. On whorled loosestrife they face outward. The leaf arrangements on the two plants are also very different. Fringed loosestrife gets its common name from the fringe of hairs on its leafstalks, but sometimes the flower petals are also fringed. It’s a cheery, pretty plant that often gets overlooked because there is just so much in bloom at this time of year. 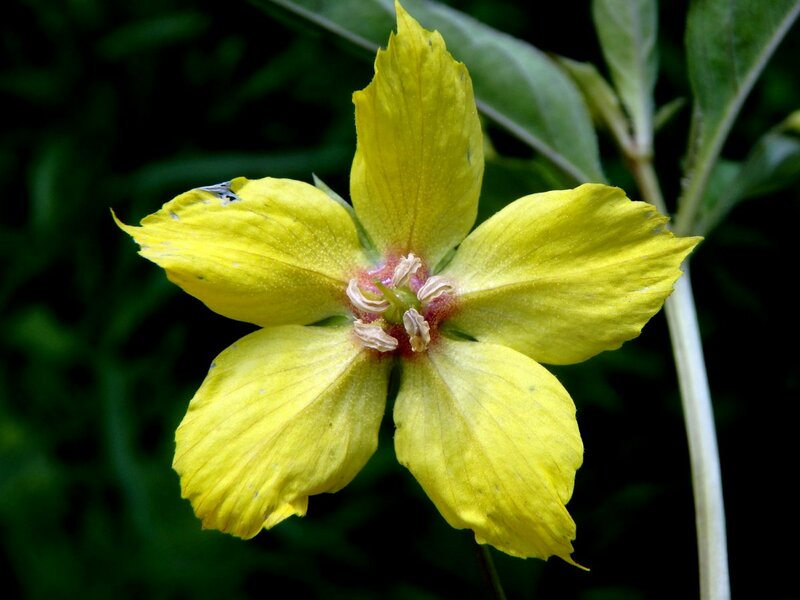 The flowers of fringed loosestrife are unusual because of the way they offer oils instead of nectar to insects. The oils are called elaiosomes and are fleshy structures that are attached to the seeds of many plant species. They are rich in lipids and proteins. Many plants have elaiosomes that attract ants, which take the seed to their nest and feed them to their larvae. Trout lily is another plant with elaiosomes. Many years ago a friend gave me a piece of her Japanese iris. I don’t know its name but it’s a beautiful thing that is blooming now. 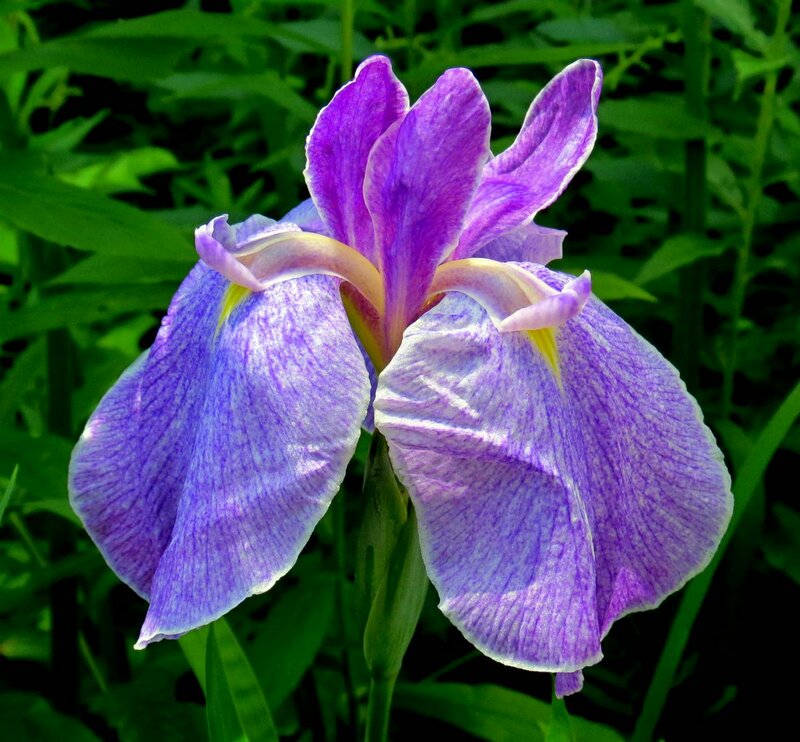 It has very big flowers; they must be 2 or 3 times as big as a bearded iris blossom. 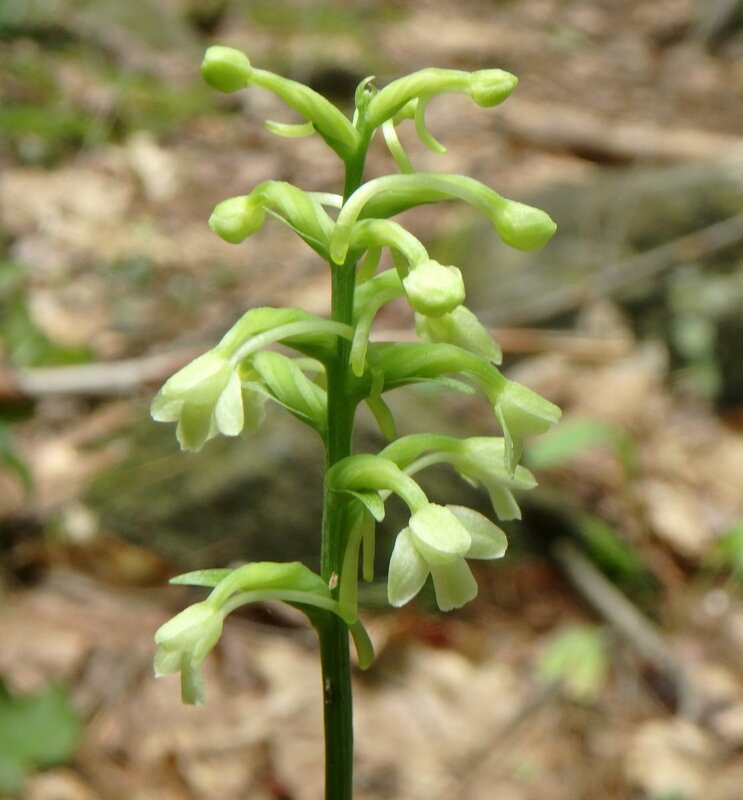 Two years ago I followed a trail through a swamp and was astonished to see a two foot tall greater purple fringed bog orchid (Platanthera grandiflora) growing right there beside the trail. This year once again I’ve been following its progress off and on for months, watching it grow and produce buds, hoping all the while that nobody would pick it or a deer wouldn’t eat it. Finally it bloomed at exactly the same time it had last year and the year before. This is easily one of the most beautiful flowers that I’ve seen, and I’ve seen a lot of flowers. It is something I’d happily walk many miles to see because such a sight is so very rare; truly a once in a lifetime find in these parts. It grows in black, very wet swamp mud where for part of the spring there is standing water, so it obviously likes wet feet. I’ve read that the flowers are pollinated by large butterflies and moths, but I’ve never seen an insect near them. I do hope they get pollinated and produce plenty of seeds. 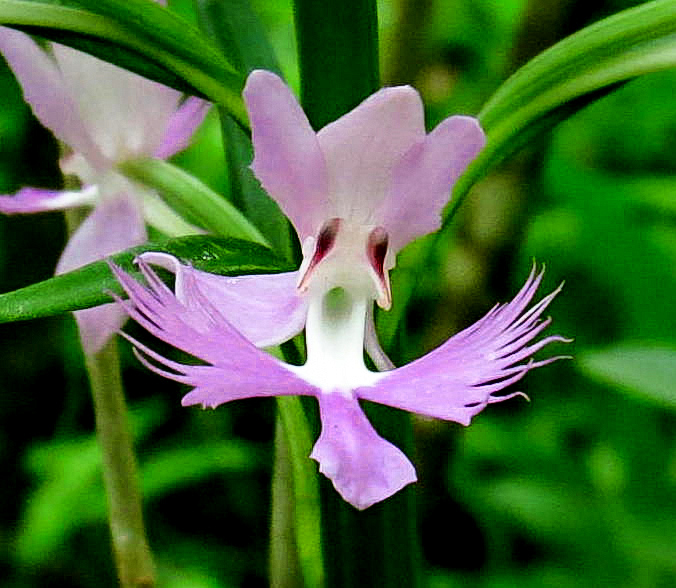 The Native American Iroquois tribe actually dug this orchid up for its roots and made tea from them to protect them from ghosts. Ghosts or not, I’d have a very hard time digging up something so beautiful. Now is the high point of the year for the flower lovers among us in this area. You don’t have to look very hard to find them. They’re in lawns, meadows, river banks and waste areas; really just about everywhere. Now is the time to see Deptford pinks (Dianthus armeria) which don’t have the jagged red ring around their center like a maiden pink (Dianthus deltoids) and bloom later than maiden pinks; usually in July. 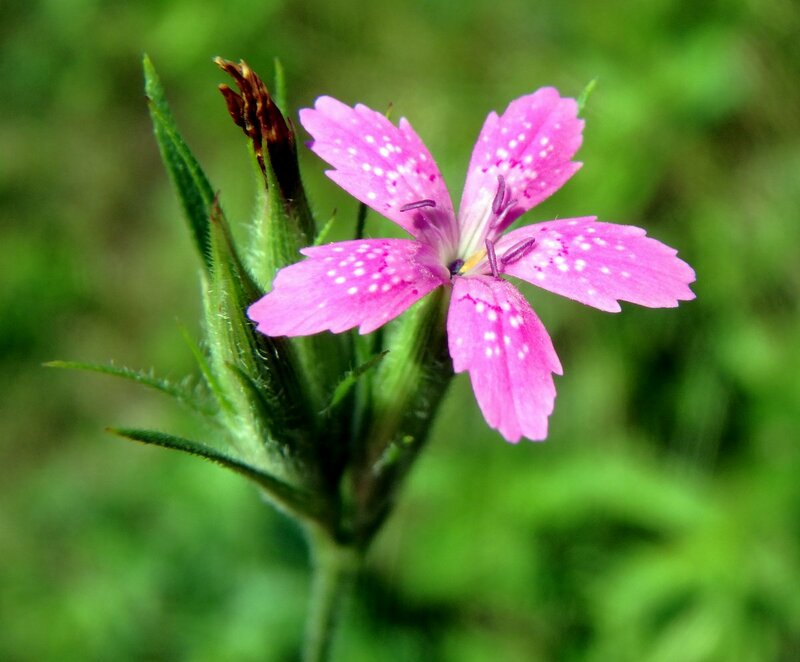 The flowers are also smaller and the plant, rather than growing in large clumps of 40-50 flowers out in the open like the maiden pink, blooms shyly in threes and fours at the edges of meadows. It’s a pretty little thing that I wish I’d see more of. Though it originally came from Europe it can hardly be called invasive. 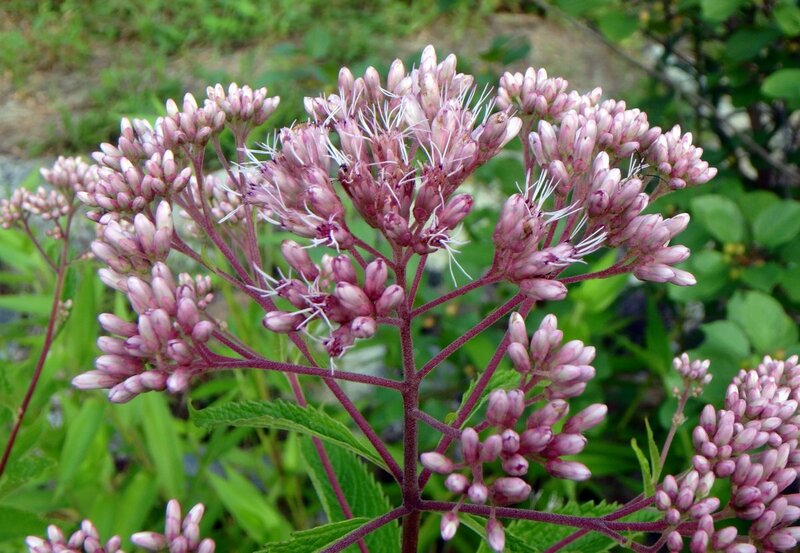 Joe Pye weed (Eupatorium) has just started blooming and is a common late summer sight in the meadows. 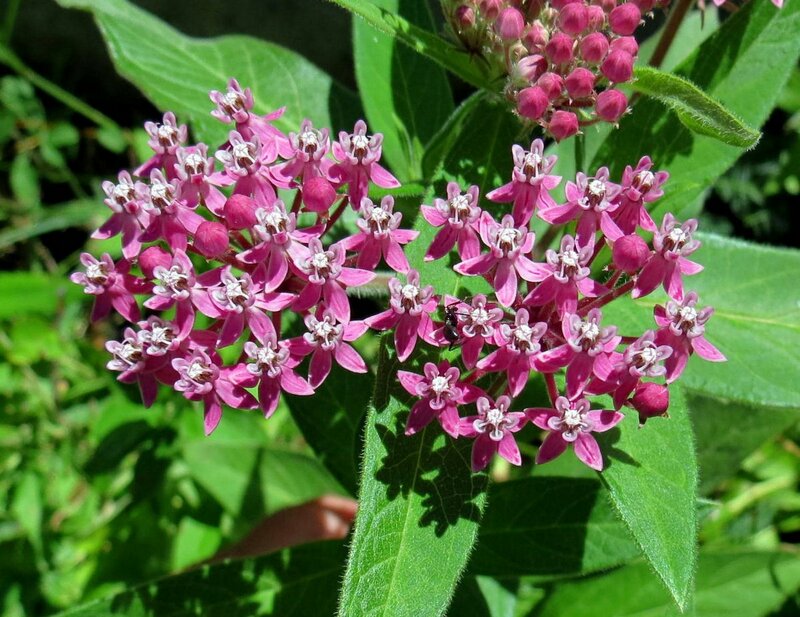 There are several species of this plant including hollow Joe-Pye-weed (E. fistulosum,) sweet Joe-Pye-weed (E. purpureum,) three-nerved Joe-Pye-weed (E. dubium,) and spotted Joe-Pye-weed (E. 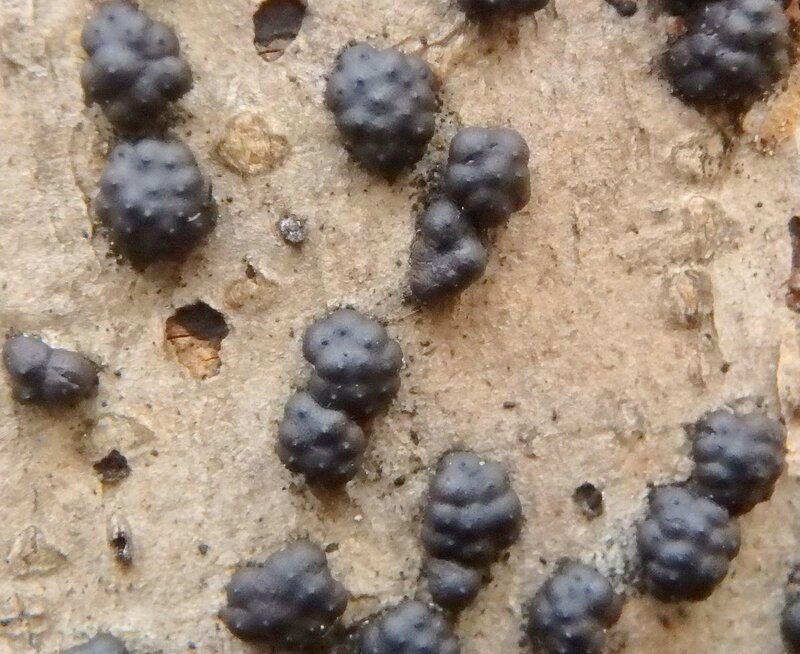 maculatum.) 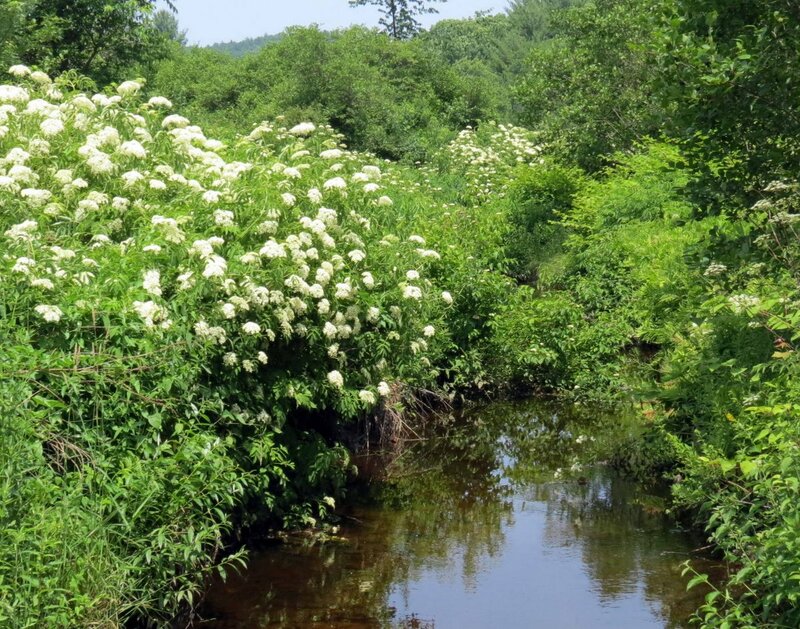 Hollow Joe-Pye weed is the most common species in this area. Joe Pye is thought to have been a Native American healer who used this plant to treat early Massachusetts Bay Colony settlers suffering from typhoid fever, but the discussion over the origin of the name goes back and forth. For instance I’ve read that a Native word for the plant was “jopi,” which meant typhoid, and it is thought by some that jopi the plant name became Joe Pye the person’s name. Soapwort’s (Saponaria officinalis) leaves contain a natural soap called sapronin. When the leaves are crushed and scrubbed together in water a soapy lather forms. In the past this plant was used for washing clothes and making soap. It hails from Europe and though it is used medicinally it is considered toxic and some people have violent toxic reactions to it. 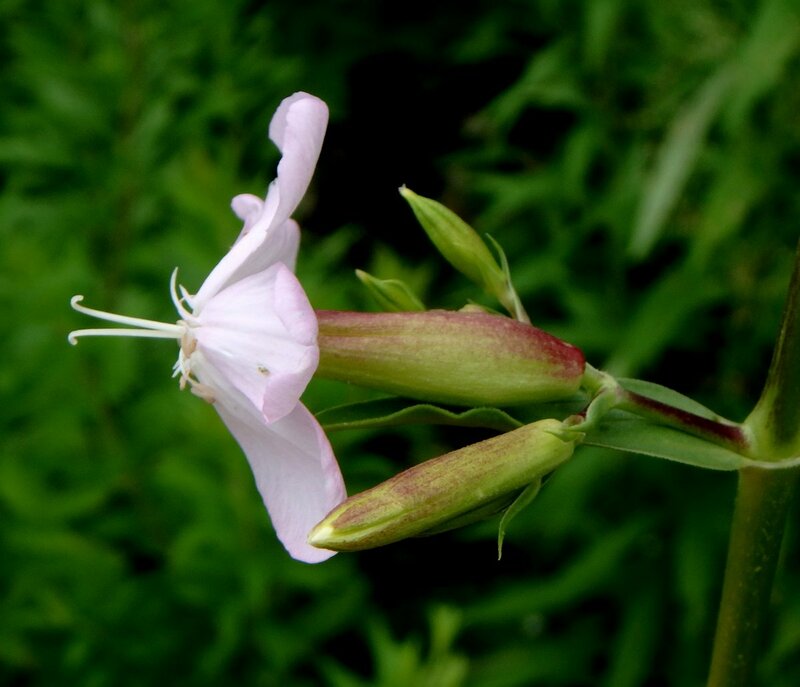 I’ve heard that soapwort is also called bouncing bet because of the way the unusual recurved petals bounce the flowers in a breeze, but I’ve also heard that bouncing bet was a name once used for a laundry woman. It grows to about knee high on a good day but I’ve also seen it sprawl along the ground. It was originally introduced as a garden plant and promptly escaped. 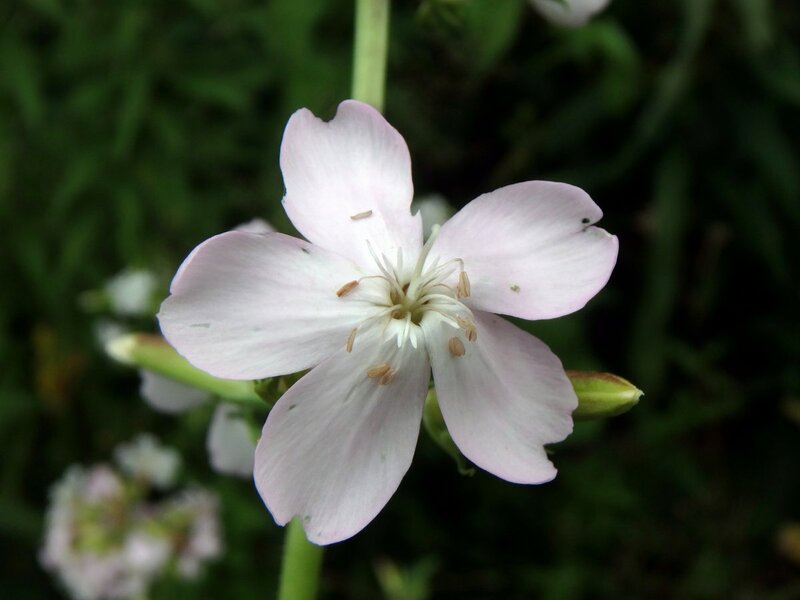 Soapwort flowers can be pink or lavender in full sun and whiter in shade. They usually have 10 stamens and always seem to have quite narrow petals when compared to the more rounded petals of a plant like phlox. The more curved the petals it is said, the older the flower. Bull thistle (Cirsium vulgare) originally hails from Europe. It is thought to have been introduced in the colonial era and has spread throughout the United States, much to the dismay of farmers and cattle ranchers. 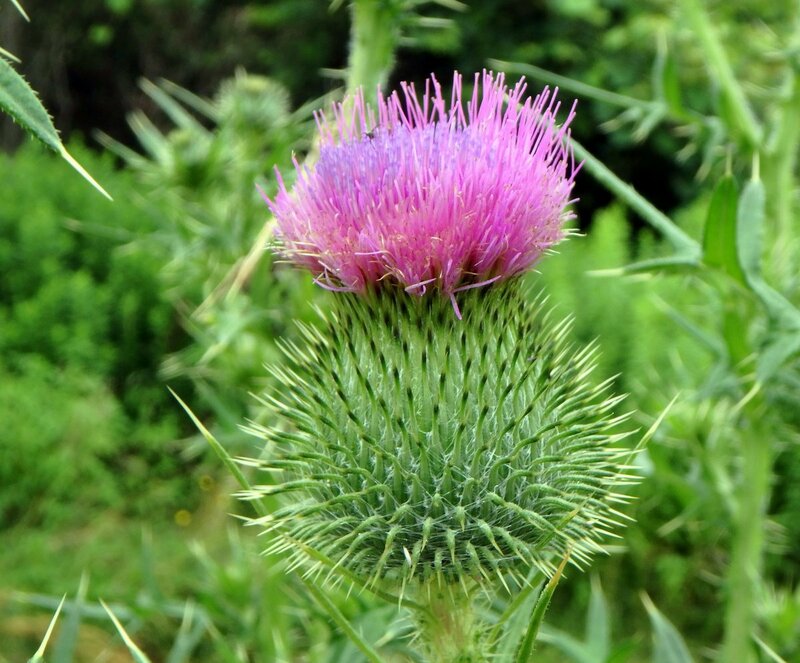 It is also called spear thistle, with good reason. The first flowers often open in the center of the plant as this one did, and that can make it tricky to get a photo of. Those spines are very sharp. Bees love thistle blossoms; I had a bumblebee swoop right over my shoulder and almost push me out of the way to get at this flower. 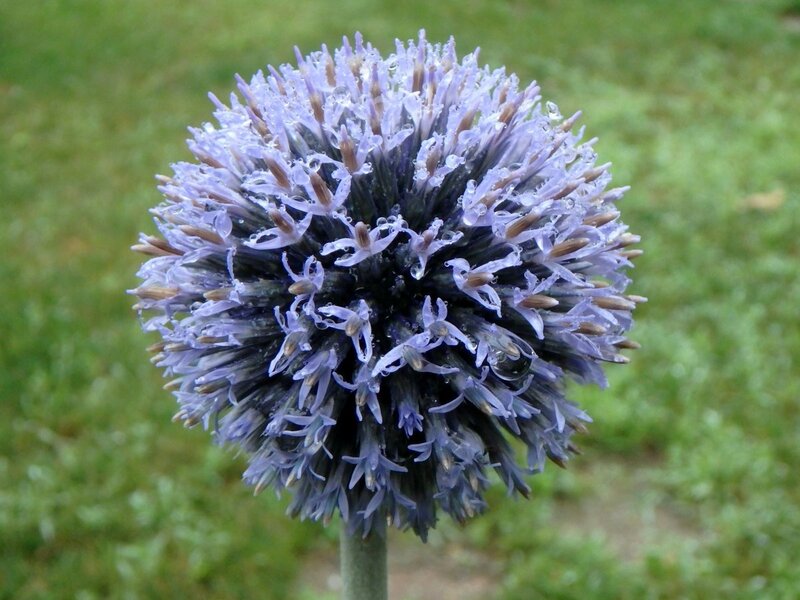 Globe thistle (Echinops) is a garden thistle that isn’t very prickly at all compared to a bull thistle. This plant will bloom for weeks and also makes an excellent cut flower. It likes full sun and doesn’t mind dry soil. Cooler night time temperatures bring out a deeper blue in the flowers. The plant often self-seeds so the spent blossoms should be cut off unless you want a colony. On the other hand, though it’s originally from Europe and Asia I’ve never seen it escape a garden and grow in the wild, so I wouldn’t say it was invasive. Bees love the blossoms, but I don’t know if birds eat the seeds. Finches might. Liatris (Liatris spicata) is a plant native to our prairies and you don’t find it outside of gardens that often here in New Hampshire. Every now and then you can find a stray plant in a meadow but it isn’t anywhere near as aggressive as black eyed Susan and some other prairie plants. It is also called blazing star and is grown commercially as a cut flower. I think that the closer you get to the tiny flowers, the more beautiful they become. It’s a very useful plant for attracting butterflies to the garden. 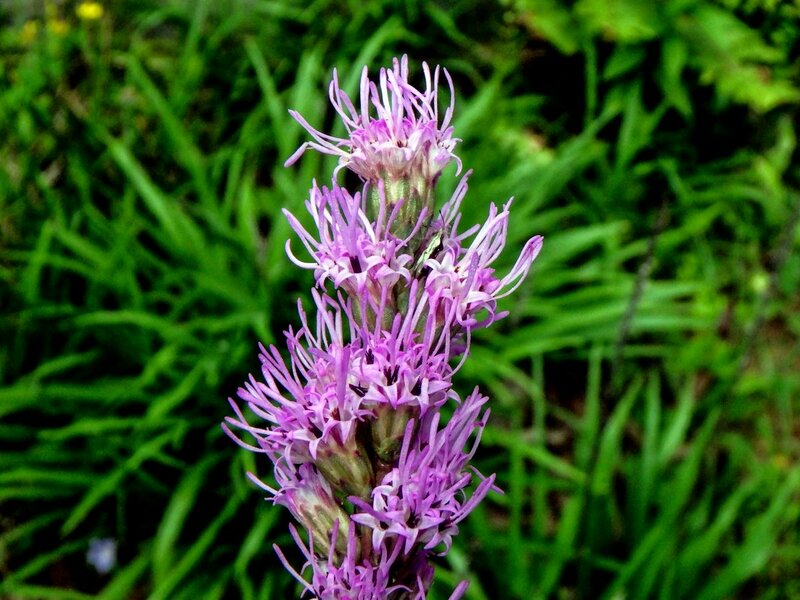 Native Americans baked and ate the roots of some of the more than 43 varieties of Liatris. They are said to taste like carrots. Other parts of the plant were used medicinally to treat heart ailments. 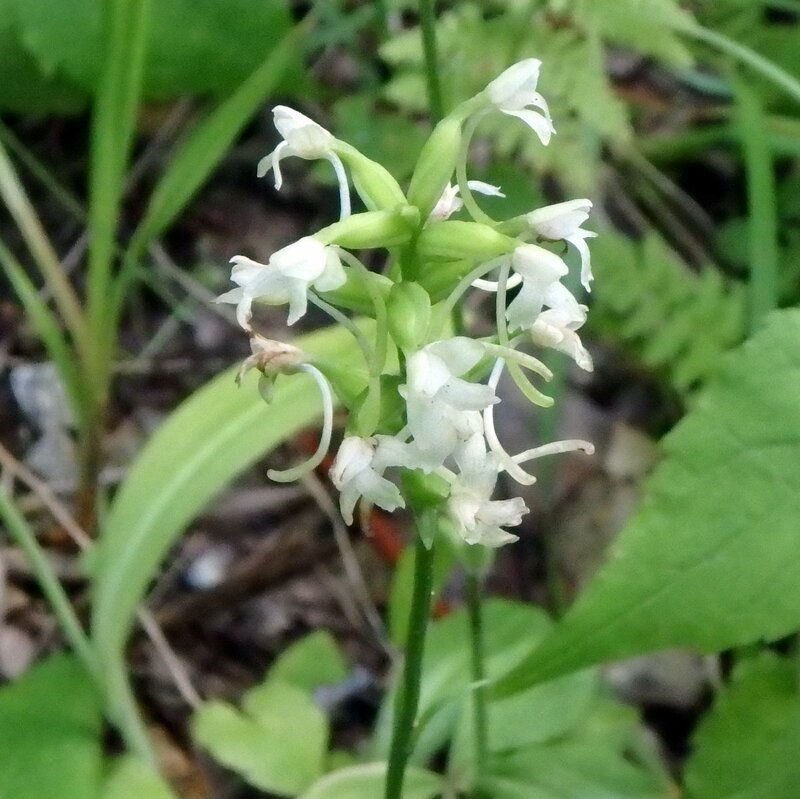 There are a few orchids blooming now and one is the broad leaved helleborine orchid (Epipactis helleborine.) These orchids are originally from Europe and Asia and were first spotted in this country in Syracuse, New York in 1879. 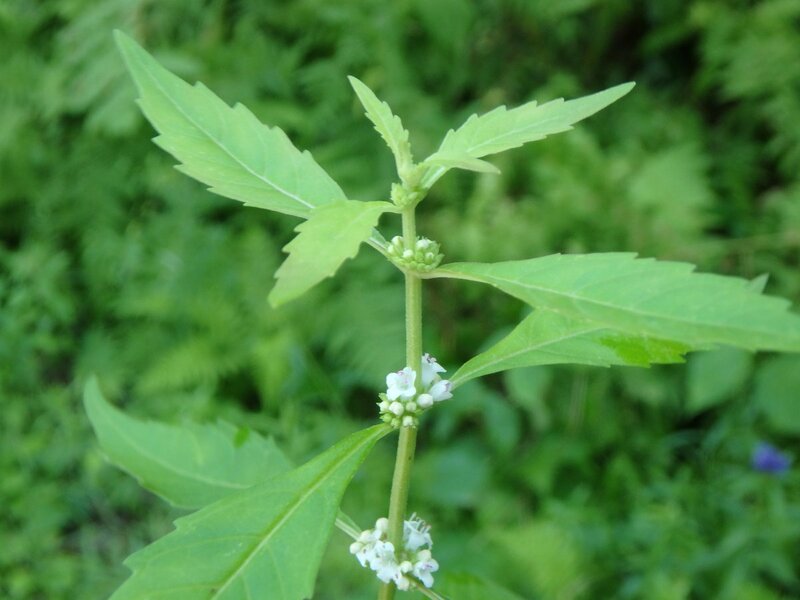 The plant has now spread to all but 19 of the lower 48 states and is considered an invasive weed. It doesn’t act very invasive here; I usually see only a few plants each year and every time I see them they’re growing in deep shade. I’ve never been able to find out how the plant comes by its common name. 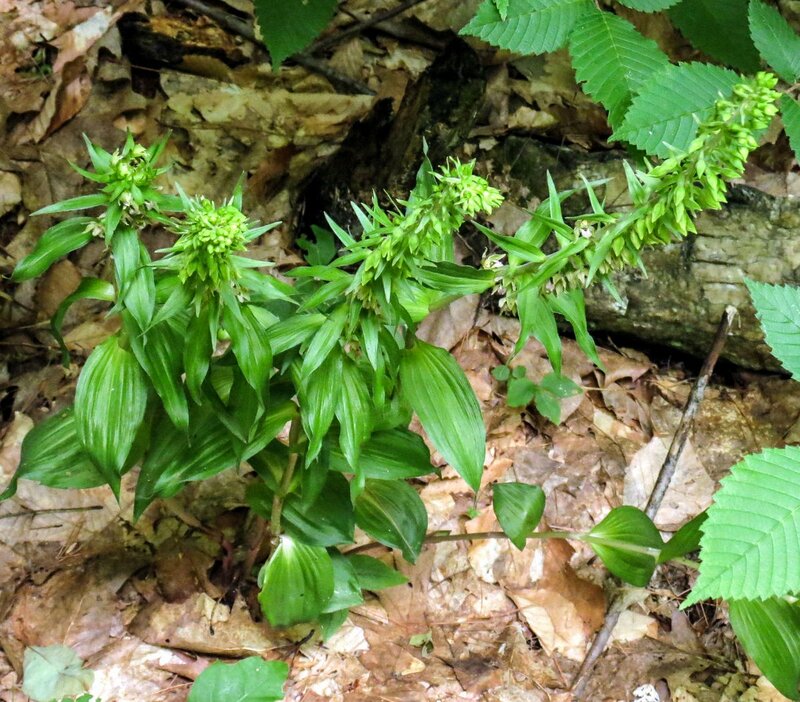 It seems a bit odd because it doesn’t seem to resemble either hellebore or false hellebore, though the pleated leaves are close to those of false hellebore. 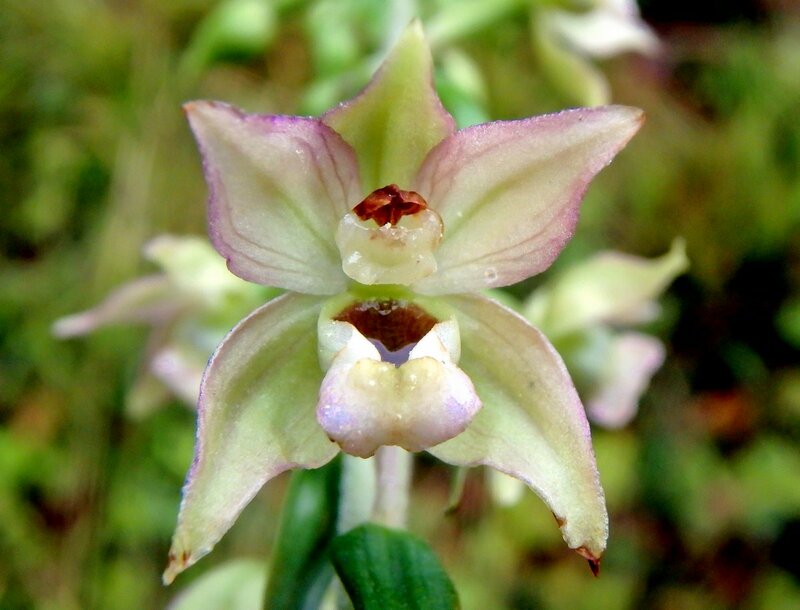 Scientists have discovered that the flowers of the broad leaved helleborine orchids have a secret; their nectar contains the strongest narcotic compounds found in nature; comparable to oxycodone, and when insects (wasps) sip it they tend to stagger around for a while. This increases their chances of picking up the orchid’s pollinia, which are sticky little sacks of pollen that orchids produce instead of the dust-like pollen produced by many other flowers. Once the insect flies off it will most likely be oblivious to the pollen packets that it has stuck all over itself. 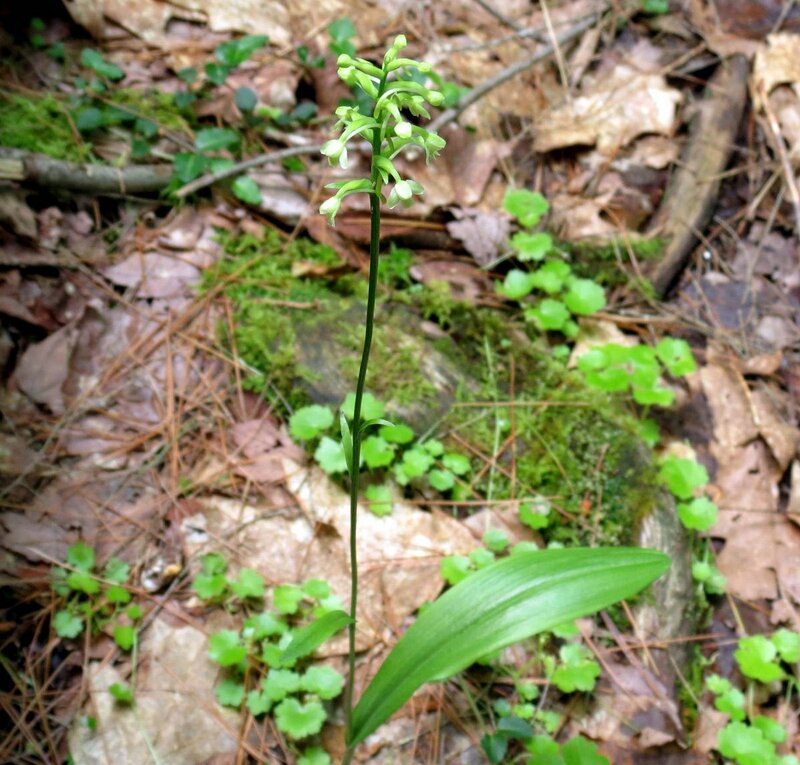 By transporting its pollinia to another helleborine flower the insect will have repaid the orchid for its intoxicating nectar. I’ve been watching the only northern club spur orchid (Platanthera clavellata v. Ophioglossoides) I know of for weeks now, waiting for it to bloom. Finally it did and I felt lucky to be able to be there to see it. I found this plant by accident two years ago when it bloomed in this same spot. Last year there was no sign of it so I assumed that I’d never see it again, but here it is. Though the flowers of the northern club spur orchid aren’t at all showy in my experience the plant is rare, so showy or not I’m happy to see it. 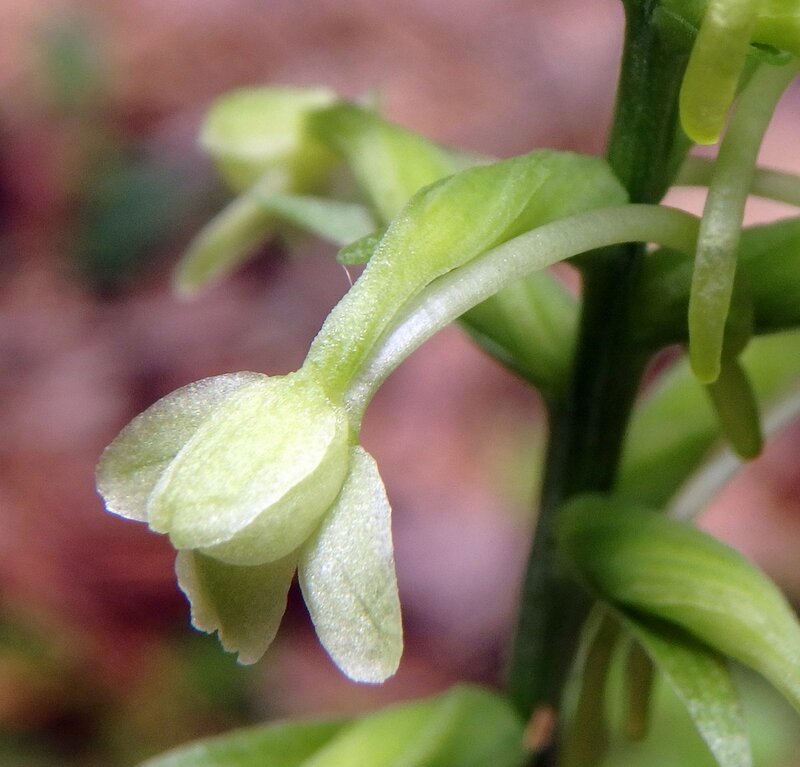 It is small at about eight inches tall and grows in very wet soil in the dark of the woods, and that gives it another common name: the small green wood orchid. 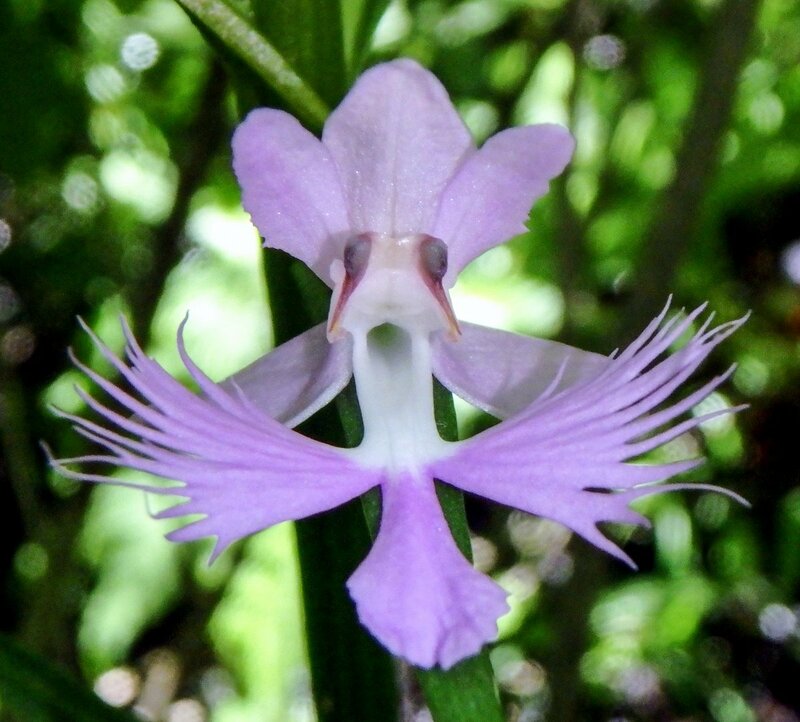 Each flower on this orchid has a long, curving spur that extends from the base, and that is where its common name comes from. Brittle stem hemp nettle is originally from Europe and Asia and is considered highly invasive in some areas, but is hard to find here. It is an annual, growing new from seed each year. 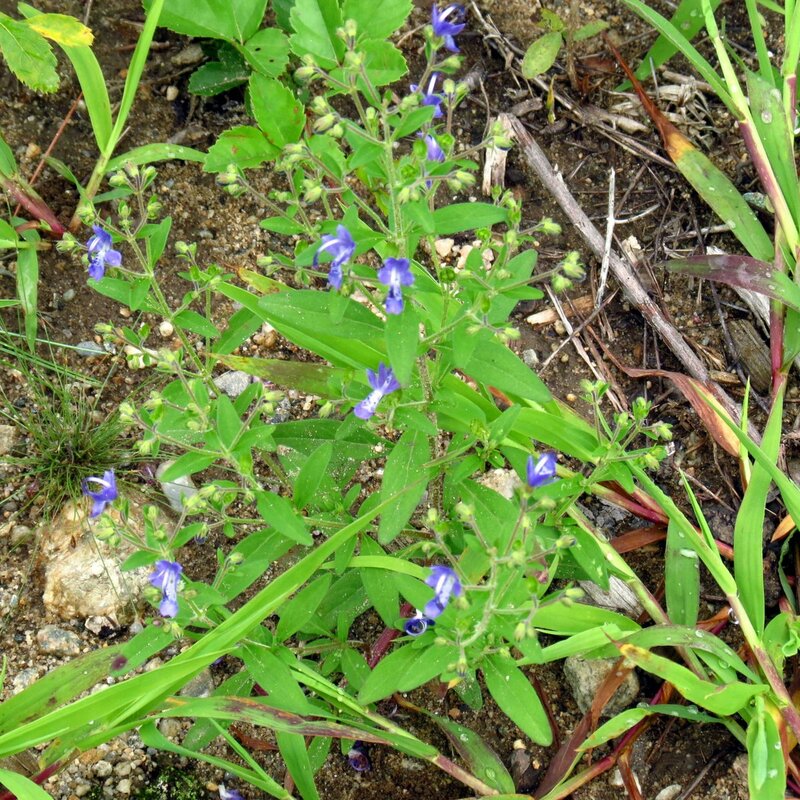 Its small purple flowers grow in whorls near the top of the plant, which is often branched. 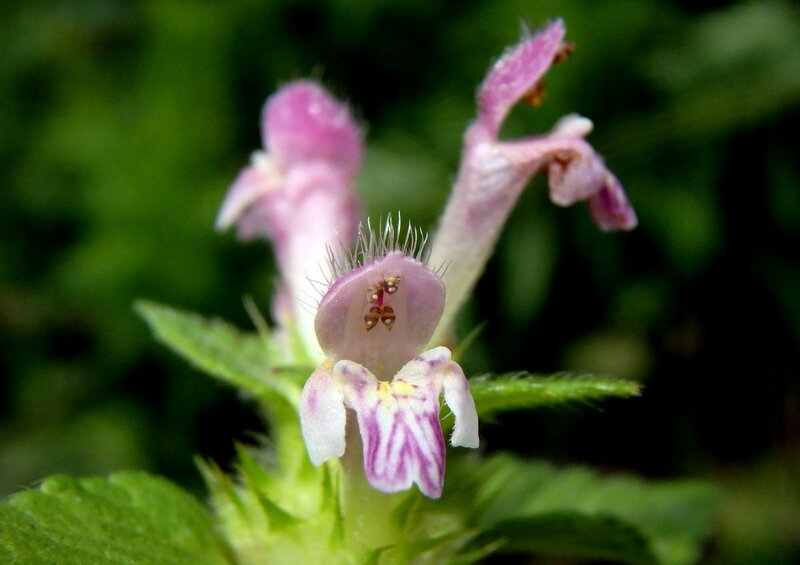 Brittle stem hemp nettle flowers have a large 3 part lower lip where insects land. From there insects can follow dark purple stripes into the blossom. Once inside they’ll pick up some pollen from the 4 stamens that arc along the inside of the upper lip and hopefully pass it on to another flower. 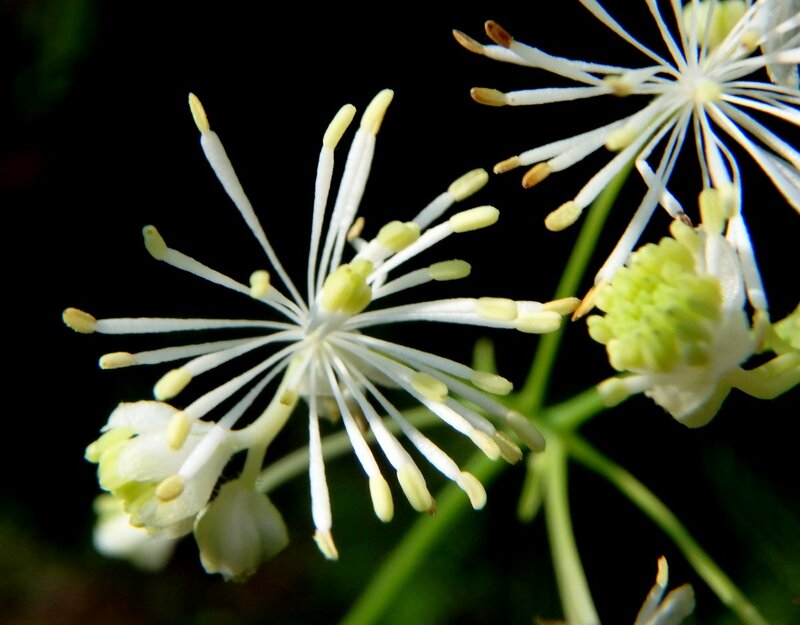 The 3/4 inch long flowers have long white hairs on their upper lip and the square stems are also covered in hairs. When you run your fingers over any part of the plant you can feel its stiff, bristly hairs but they don’t embed themselves in you, thankfully. Common quickweed (Galinsoga quadriradiata) comes from Mexico originally and how it happens to be in New Hampshire is a mystery. 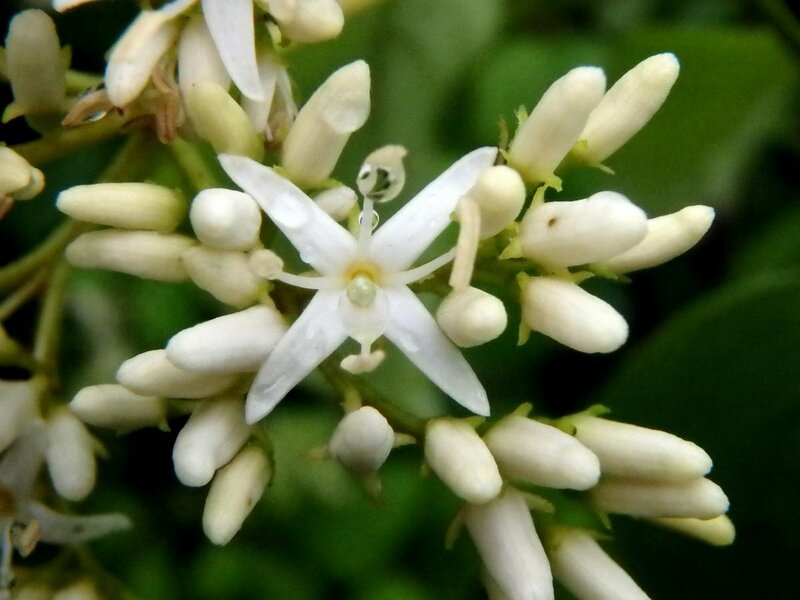 It is also called hairy galinsoga and is considered a weed even in its native range. It is said to be able to reduce crop yields by as much as half if left unchecked. 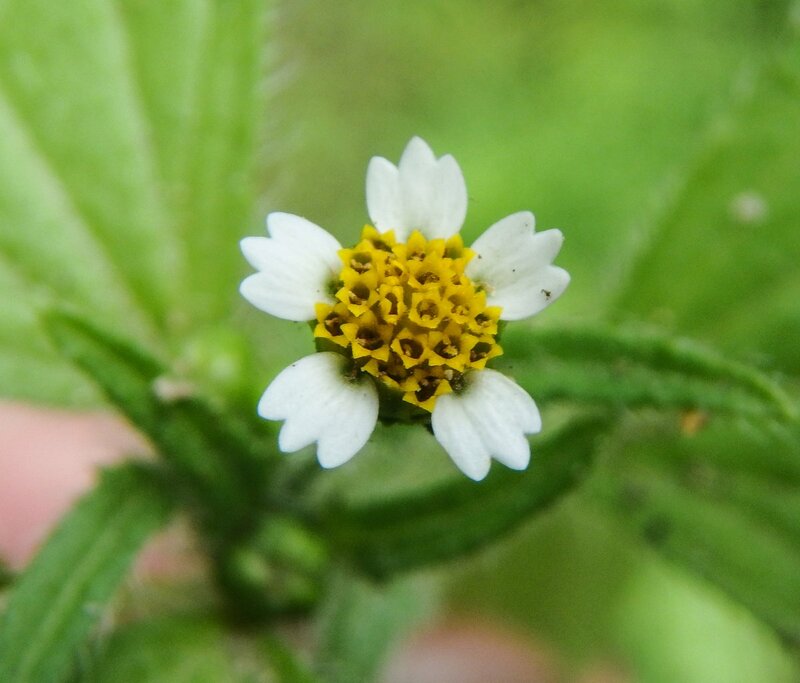 The small flowers are about 3/8 of an inch wide and have five white ray florets widely spaced around the tiny yellow center disk florets. Another common name for the plant is shaggy soldier because of the very hairy stems. We have many different varieties of St. John’s wort but this is a first appearance on this blog for pale St. John’s Wort (Hypericum ellipticum.) 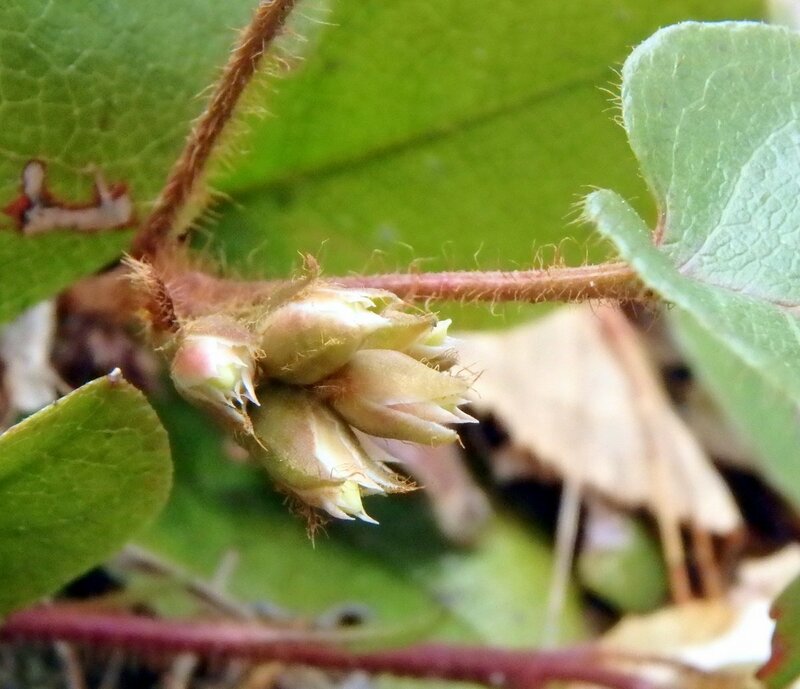 That’s because for years I thought it was dwarf St. John’s wort (Hypericum mutilum) until I took a closer look. 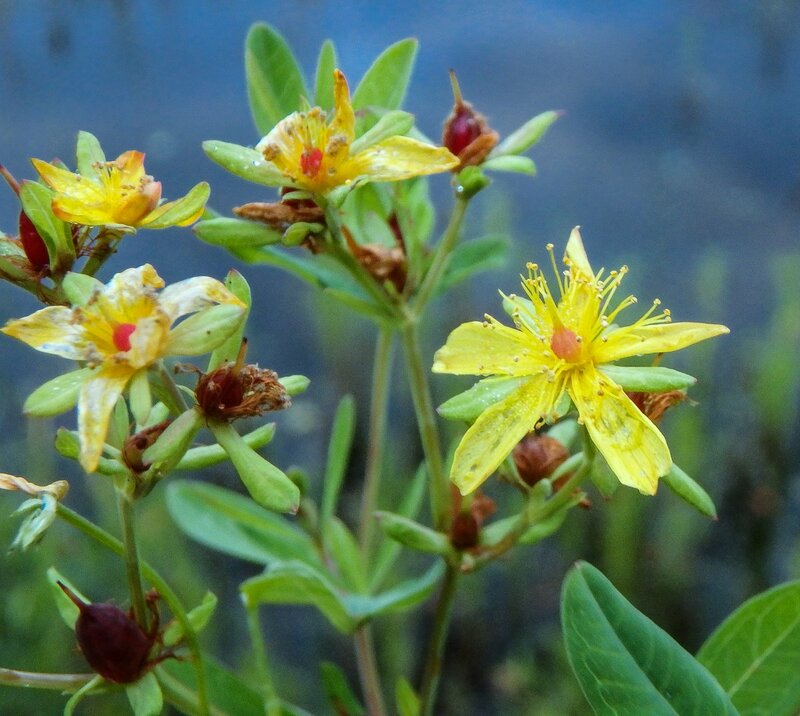 Both plants grow in the wet mud at pond edges, often side by side, but dwarf St. John’s wort flowers are smaller and the plant is very branched, while pale St. John’s wort is not. The color of the flowers is a bit paler than other varieties but unless I saw them side by side I doubt I could tell. 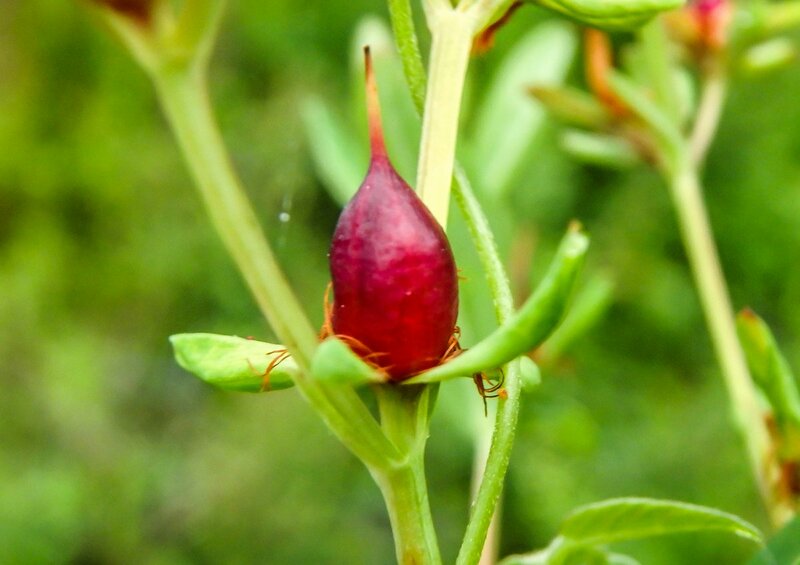 Bright red seed pods help identify pale St. John’s wort. 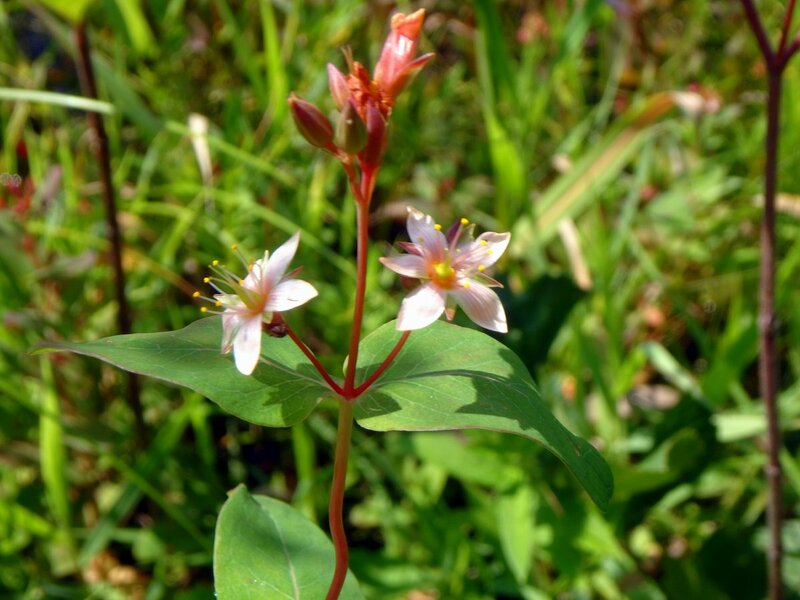 Oddly, Canada St. John’s wort has flower buds that are the same color, but that plant is much smaller and doesn’t usually grow near water. Pokeweed (Phytolacca americana) flowers are about 1/4 inch wide and have 5 petal-like, rounded sepals. 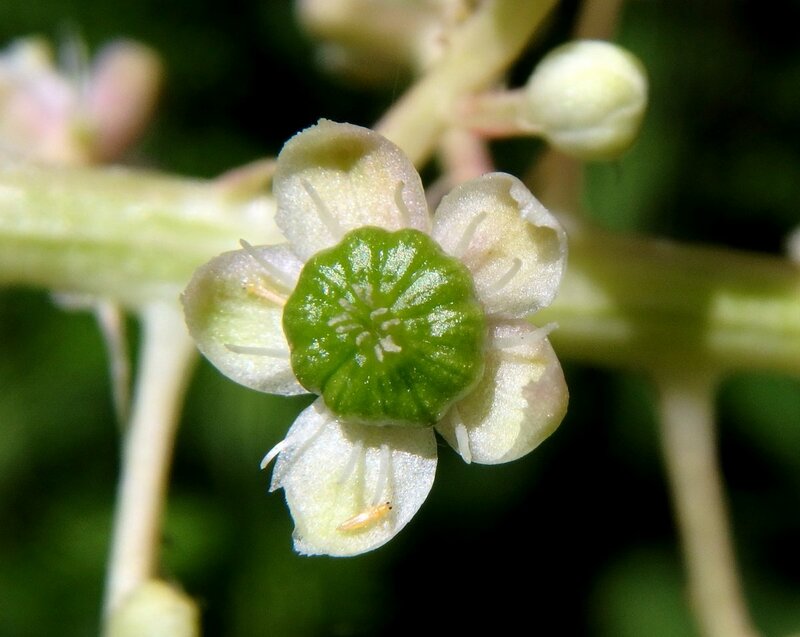 In the center of the flower are green carpels that come together and will form the purple black berry. 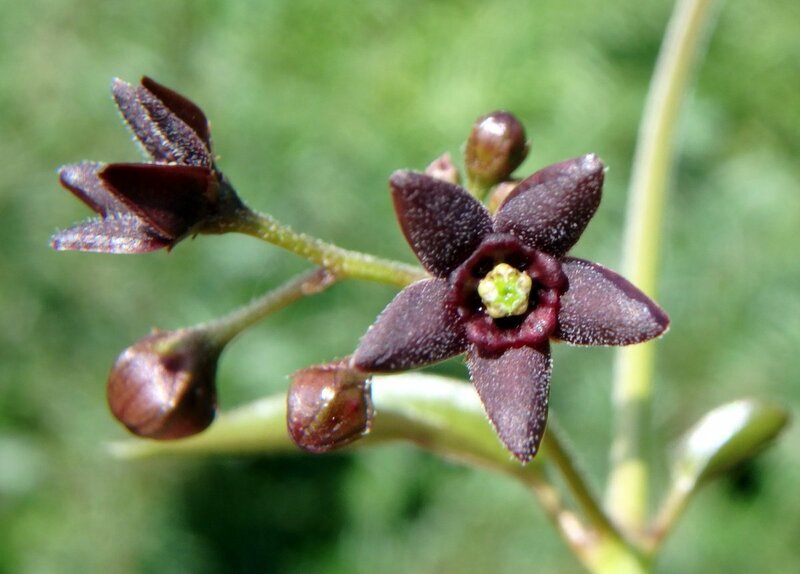 It happens quickly and you can find both flowers and fruit in all stages of growth on a single flower head (Raceme.) Pokeweed was called pocon by Native Americans. 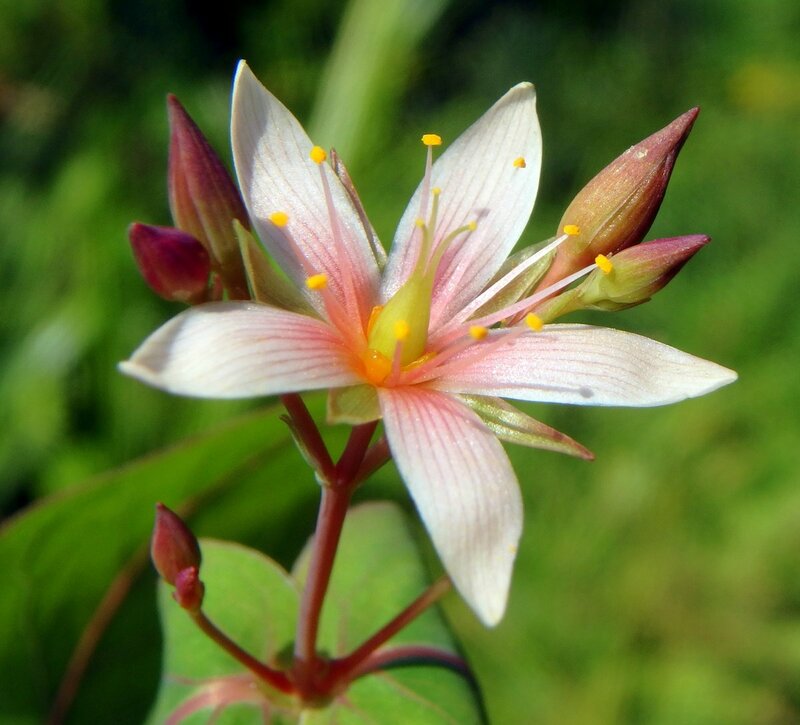 The Delaware tribe used the plant as a heart stimulant and other tribes made a salve from it and used it as a cure for rheumatism. If it isn’t used correctly pokeweed can be toxic. Though as a boy all I ever saw were white flowered hedge bindweeds (Calystegia sepium) it has gotten to the point where I see these bicolor ones as often as the plain white ones. 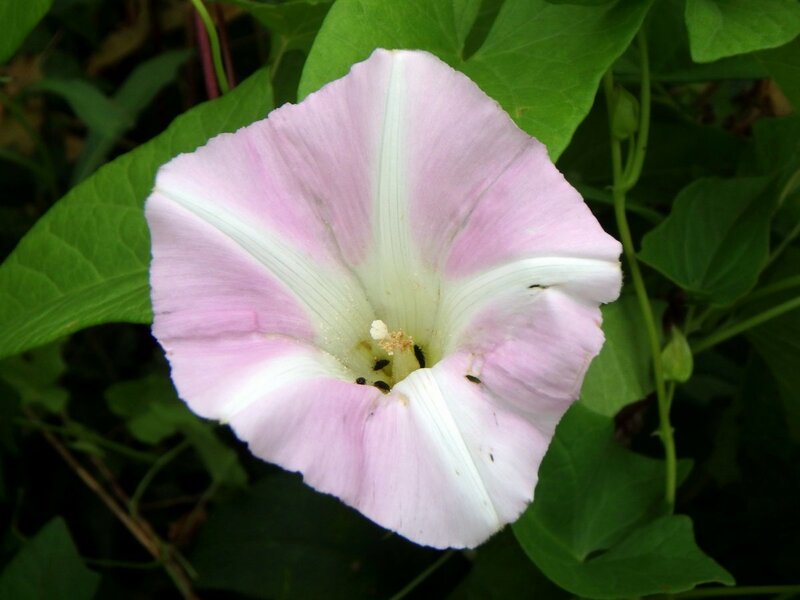 Bindweeds are perennial and morning glories are annuals and one good way to tell them apart is by their leaves; morning glory (Ipomoea) has heart shaped leaves and bindweed has narrower arrowhead shaped, triangular leaves. This flower was full of tiny insects, which are the black spots at the base of its throat. I found some beautiful purple phlox growing on the unmowed side of a road. The flower heads were quite large and anyone with a garden would have been happy to have had them in it. I’m guessing that’s just where it escaped from; I doubt that it’s native but it certainly is beautiful. We do have a native phlox called Phlox paniculata but its flowers are blue. 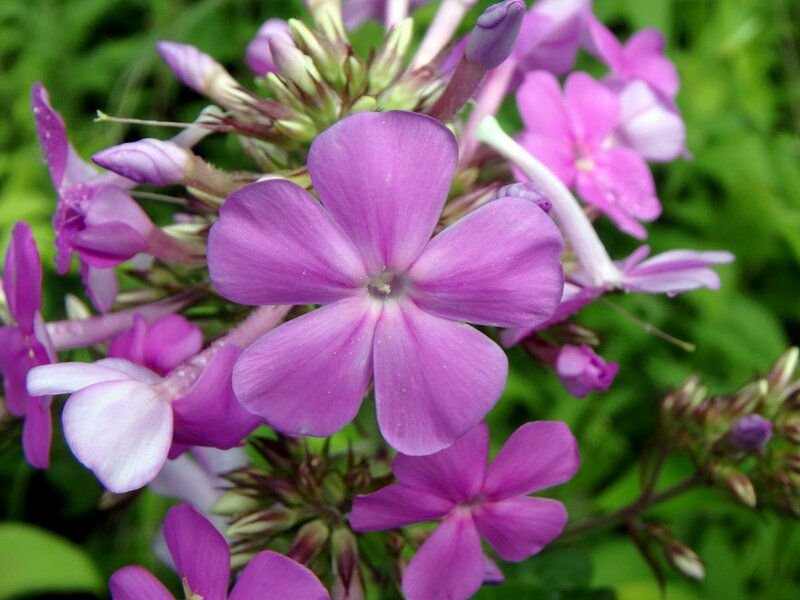 Native Americans used phlox medicinally and they were among the first wildflowers in the United States to be collected and exported back to Europe, where they became very popular. Wherever you happen to be in this world I hope that you are able to see beauty like you’ve seen here each day. 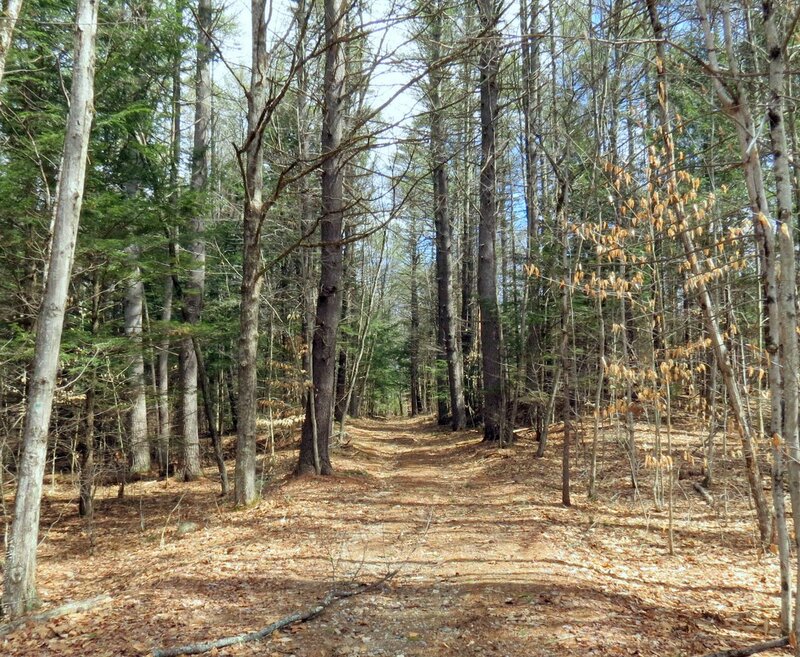 There has been quite a flare up of emotions in these parts lately over plans to cut trees near the Keene Dillant Hopkins airport. The airport isn’t in Keene, it’s actually in Swanzey which is south of Keene, and it is near a fine neighborhood called Edgewood. The Federal Aviation Administration says that the trees have to go for safety reasons, but Edgewood residents are concerned about the increased airport noise and lower property values, among other things. 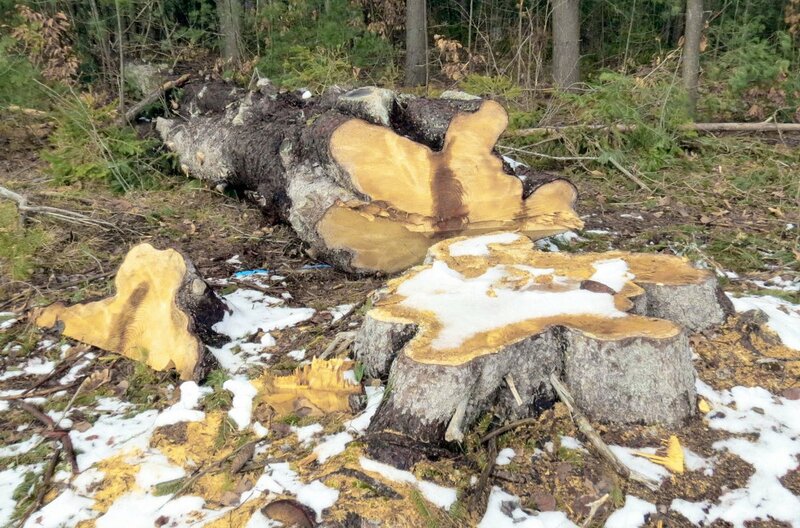 The above photo is of an old, large Norway spruce which was cut recently. One of the first of many. This is an old neighborhood; Keene’s first settlers landed very near here and called the place the “Nine Lot Plain.” The town history of Keene says that “On July 3, 1875, the Keene Driving Park Association opened a fair grounds, which included a half-mile horse trotting course and a grandstand that seated 1,500. It was a center for many Keene activities until about 1900. 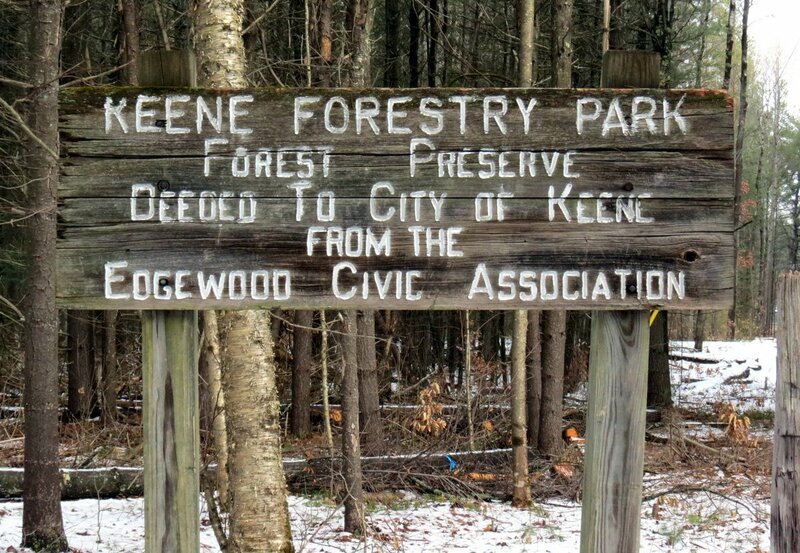 The Park Corporation laid out streets for a development here in 1913.” That development became Edgewood and, as the sign in the above photo attests, the Edgewood Civic Association donated part of the land to the city of Keene. 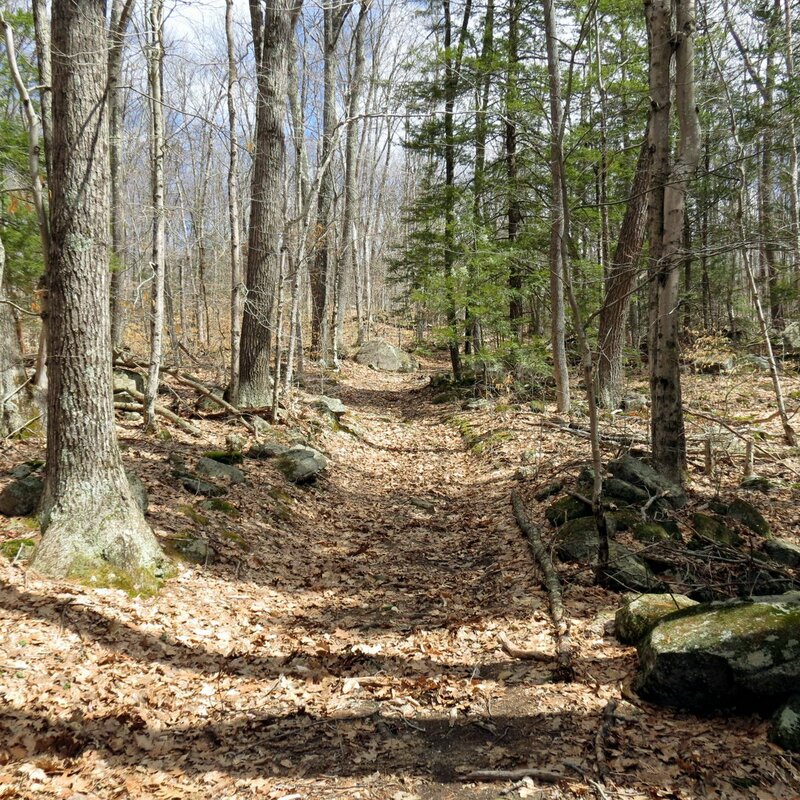 It is forested and is home to many plants, birds and animals that aren’t easily seen in this area. Some are rare and some are endangered. 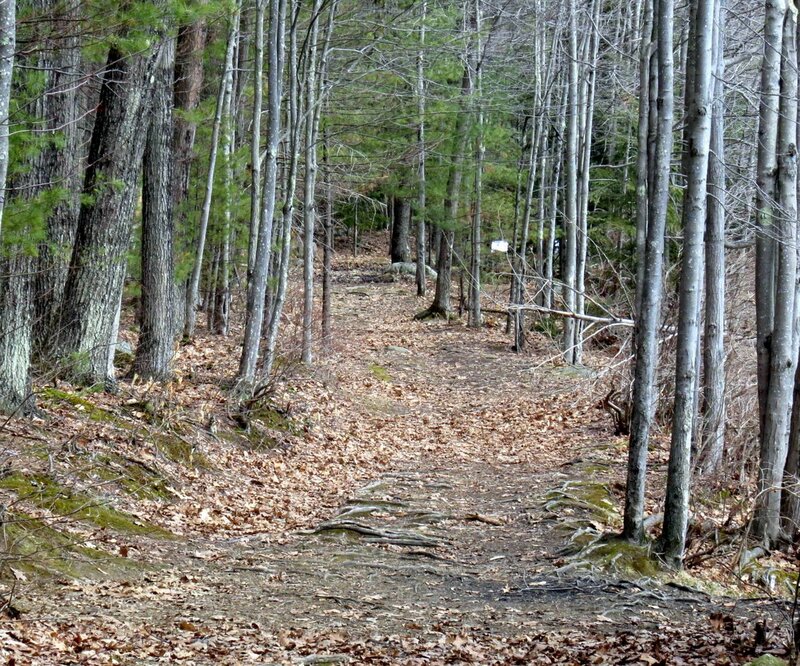 Oddly Albert Proell, manager of the Keene Forestry Association, was allowed to start a tree plantation here in 1906 on unused land. Trees, chiefly Scot pine and Norway spruce, were grown from seed to be used in reforestation projects. The spruce trees have done well but the Scot pines have not; neither the soil nor climate is right for them. Many of the spruce trees are still here and, as the above photo shows, are tall but have no girth because they were meant to be transplanted into other areas, not allowed to reach full size. They are too close together and cast such deep shade that nothing but a few mosses and fungi will grow beneath them. 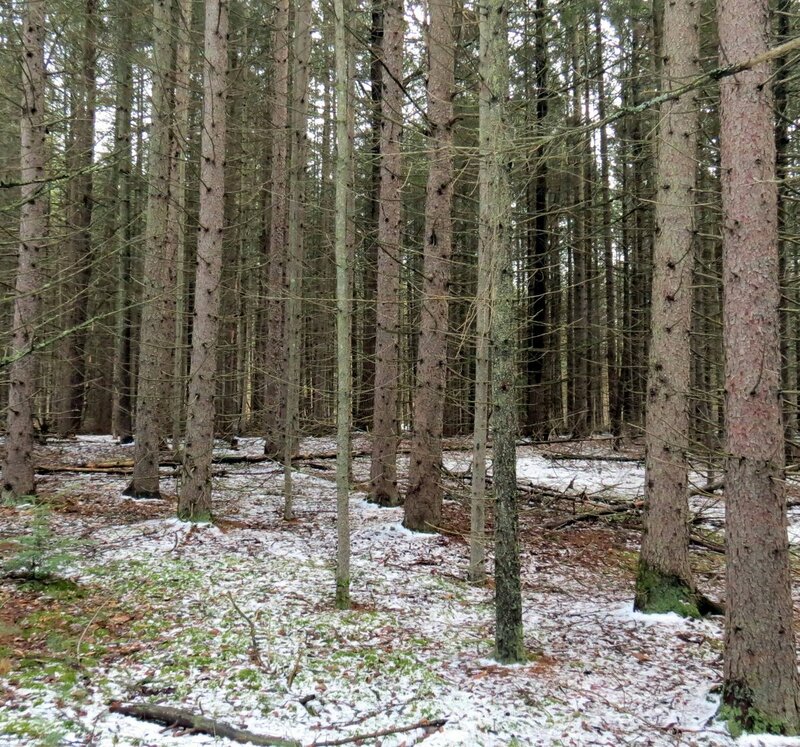 The larger spruce trees in this part of the forest are about 40 years old, but still more poles than trees. 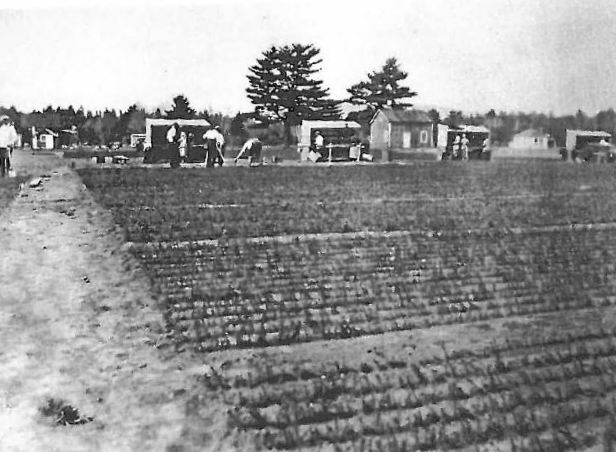 A 1920s look at the tree nursery started in 1906 by Albert Proell, on some of the abandoned agricultural land in the Keene Driving Park. The nursery is thought to be the first and one of the largest of its kind. It was about 5 acres in size. But not all of the trees here were planted. 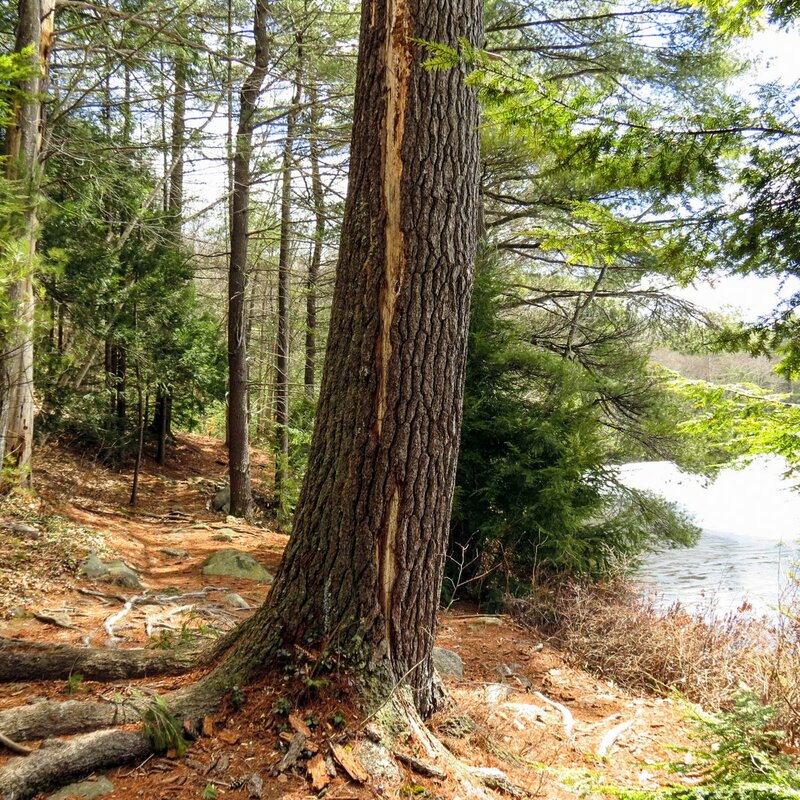 In fact most of them weren’t and some have been here for a very long time, as the white pine (Pinus strobus) in the above photo shows. 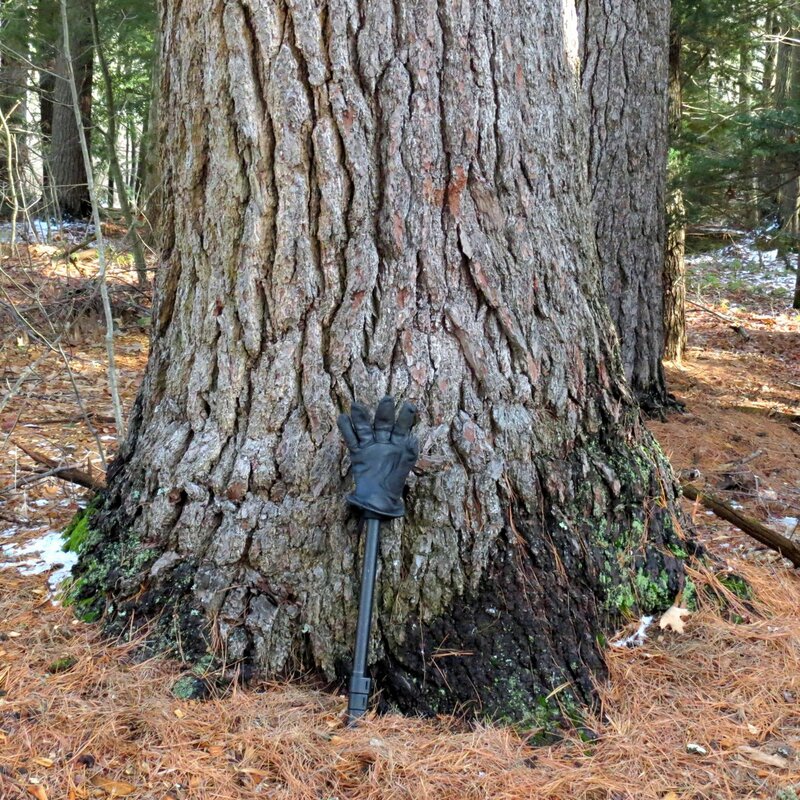 Mature white pines can be 200–250 years old, and some live to be over 400 years old. 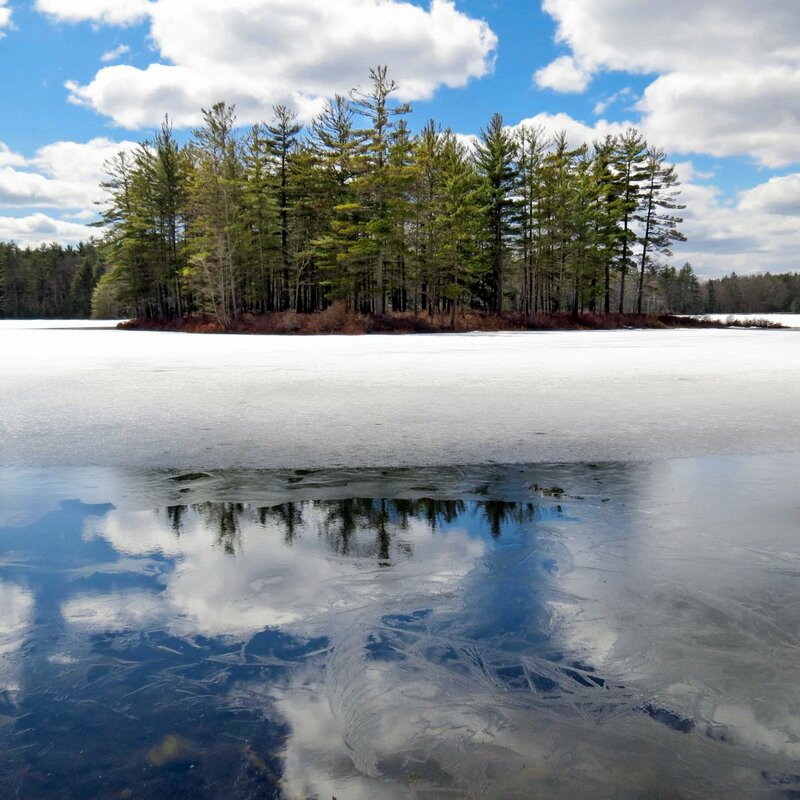 According to the Native Tree Society white pines can reach 188 feet tall, but pre-colonial stands were said to have been as tall as 230 feet. In any case they’re our tallest native tree, and I suspect that most of the trees slated to be cut will be white pines. I put a glove on my monopod to give you an idea of the size of this example, which by far isn’t the largest I’ve seen. 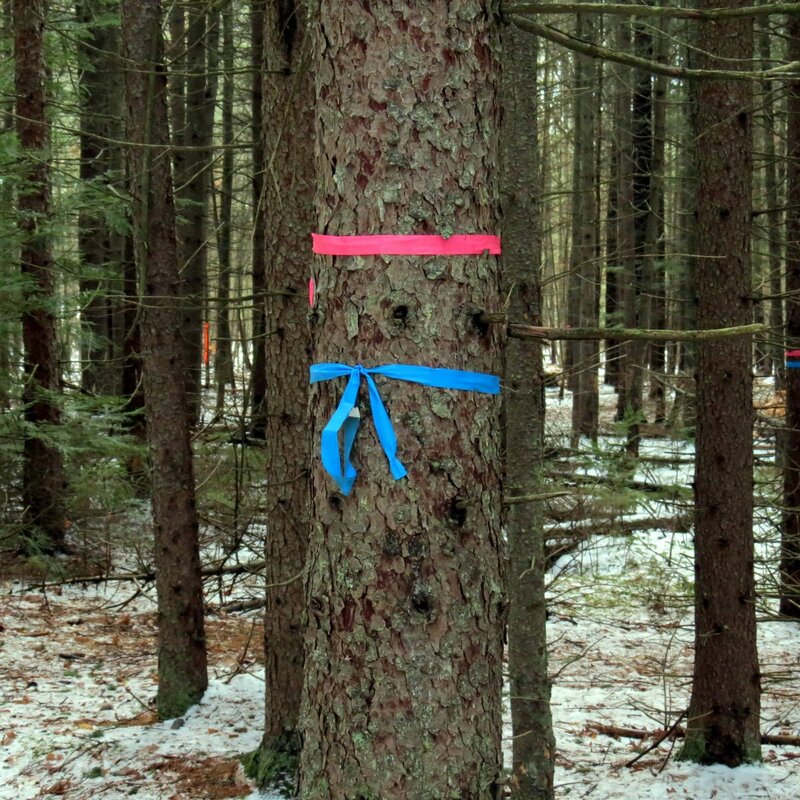 Marking has begun but this is a Norway spruce that stands in the old plantation, and these trees aren’t supposed to be cut. Maybe the tape means “don’t cut,” I don’t know. How ironic that the non-native trees that have created what is almost a sterile monoculture are the ones that will be saved. 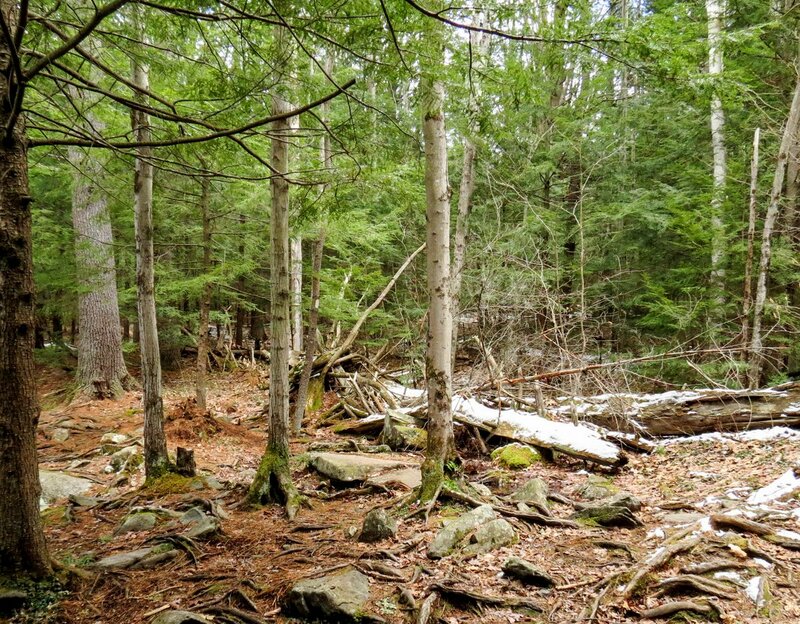 This section of forest still contains a lot of Scot pine but they don’t have any real vigor and many native trees like white pine, birch, maple, oak, and hemlock have moved into what was once part of the old nursery. 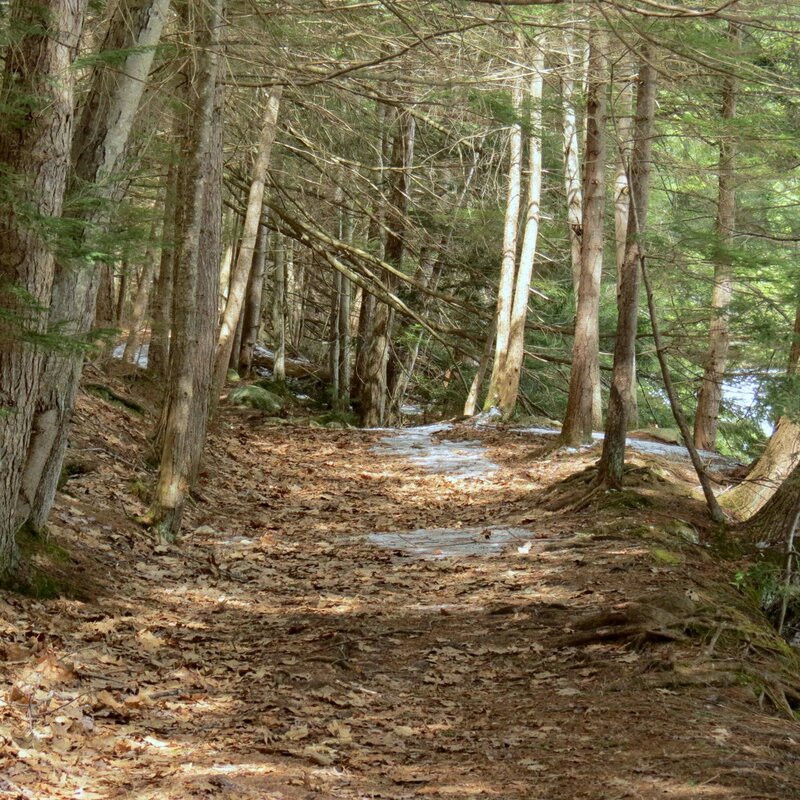 There are many trails through this forest and walking them is an enjoyable experience for many, including myself. I don’t get too excited about cutting a few trees; in truth responsible management is good for a forest and the wildlife that lives there, but in this case I do worry about the impact that the tree cutting will have on the plants that grow here, the people who live here, and others who use this forest daily. There is something to be said for the quality of life, after all. 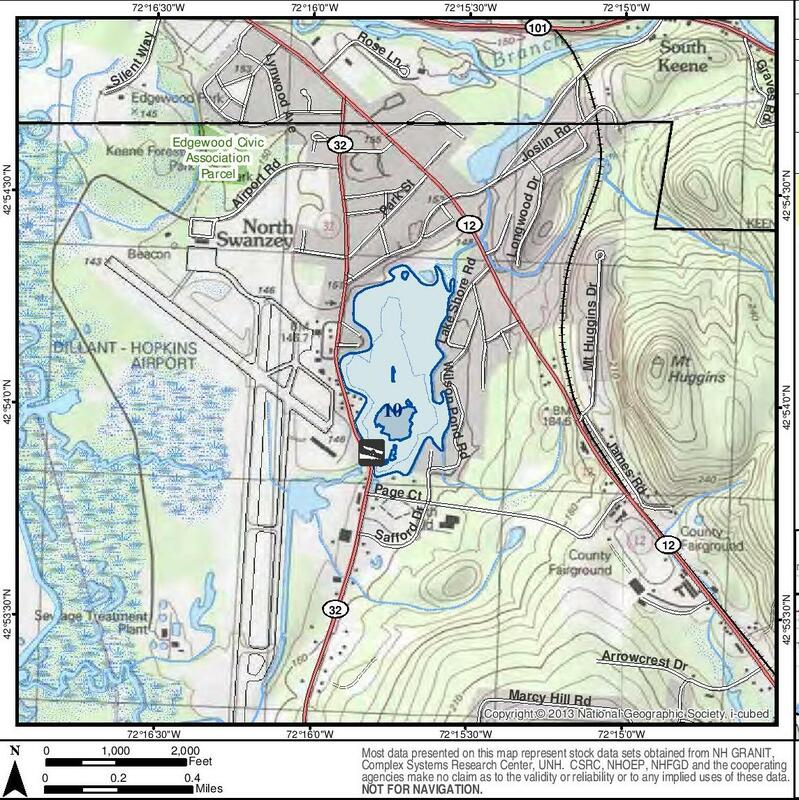 This map shows the two runways of the Keene Dillant Hopkins Airport on the left, and in the upper left corner is the Edgewood forest, marked “Edgewood Civic Association Parcel,” so you can see how close the forest and neighborhood are to the airport. The land that is now the airport was originally purchased in 1942 and the airport opened on in 1943. In 1967 the FAA recommended a 1.8 million dollar series of improvements which included further extending the runways, the construction of a control tower, and improvements to buildings. But before the airport was here, before Edgewood was here, Native American Squakheag tribes lived on this land for many thousands of years. 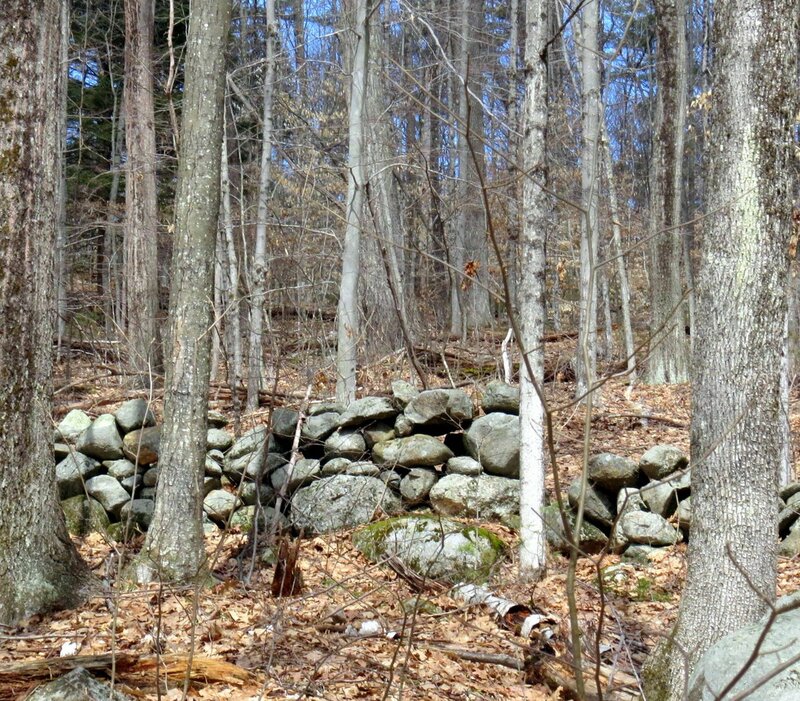 Archeological digs in the area have found Native sites that date back 10,500 years; some of the oldest in the country. 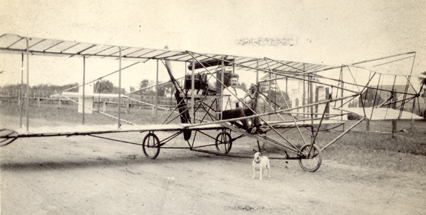 In 1912 Keene’s first airplane took off from the driving park fair grounds and quickly landed in the top of a nearby tree. How’s that for irony? There are extensive wetlands on the airport property and many threatened and imperiled species live in them, including the grasshopper sparrow, the northern leopard frog, the horned lark, the vesper sparrow, the eastern meadowlark, the northern long-eared bat, and the wood turtle. 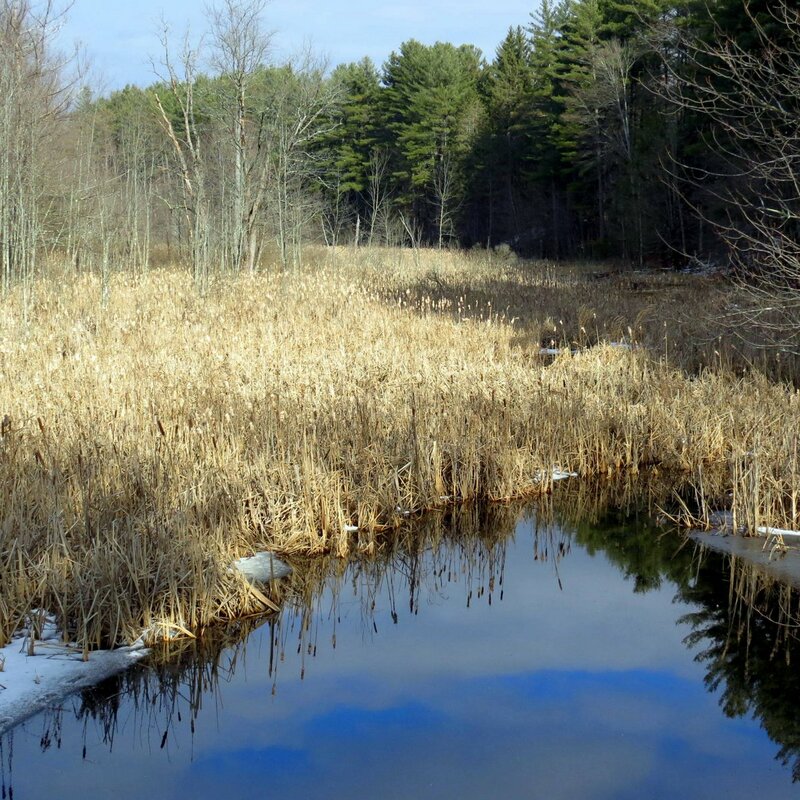 Some species have a rating of “imperiled at a global and statewide level,” including the spot-winged glider and the marsh wren. All have been spotted within a mile of the airport. 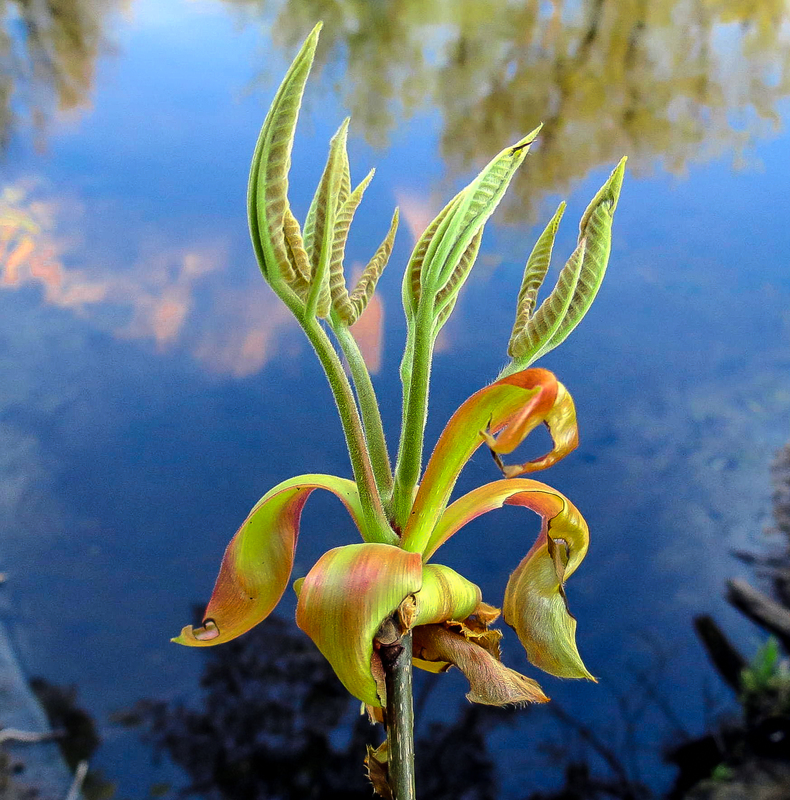 Rare plants include the endangered long-headed windflower (Anemone cylindrica,) and the uncommon swamp white oak (Quercus bicolor) which I haven’t found yet. Skunk cabbages (Symplocarpus foetidus) also grow in the wetlands here, and though I can’t speak for their rarity this is the only place I’ve ever seen them, and I’ve covered a lot of ground in my time. 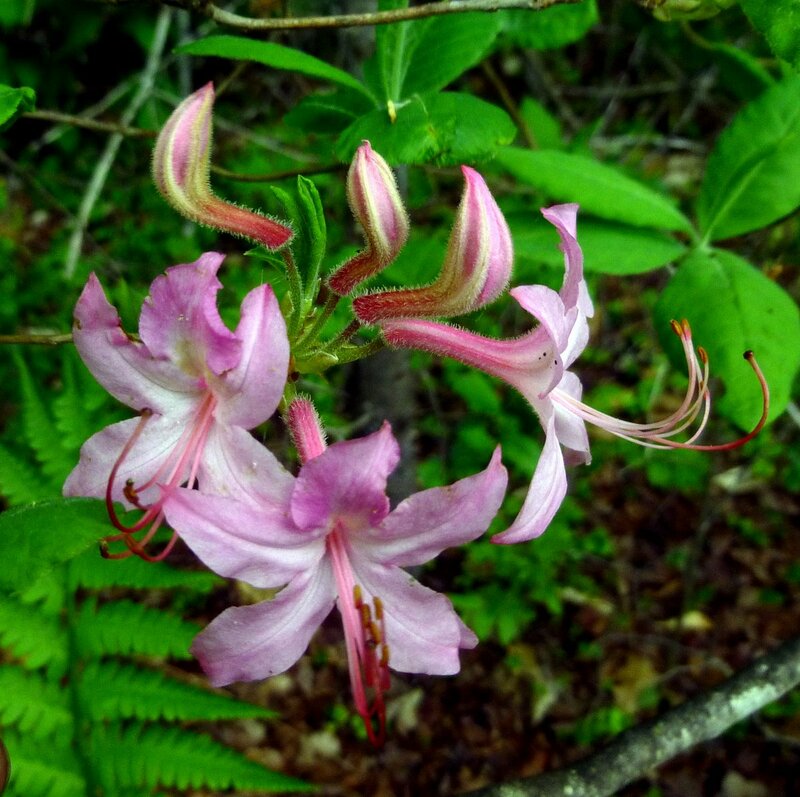 This forest is one of only two places where I’ve found our beautiful native roseshell azalea (Rhododendron prinophyllum) growing. 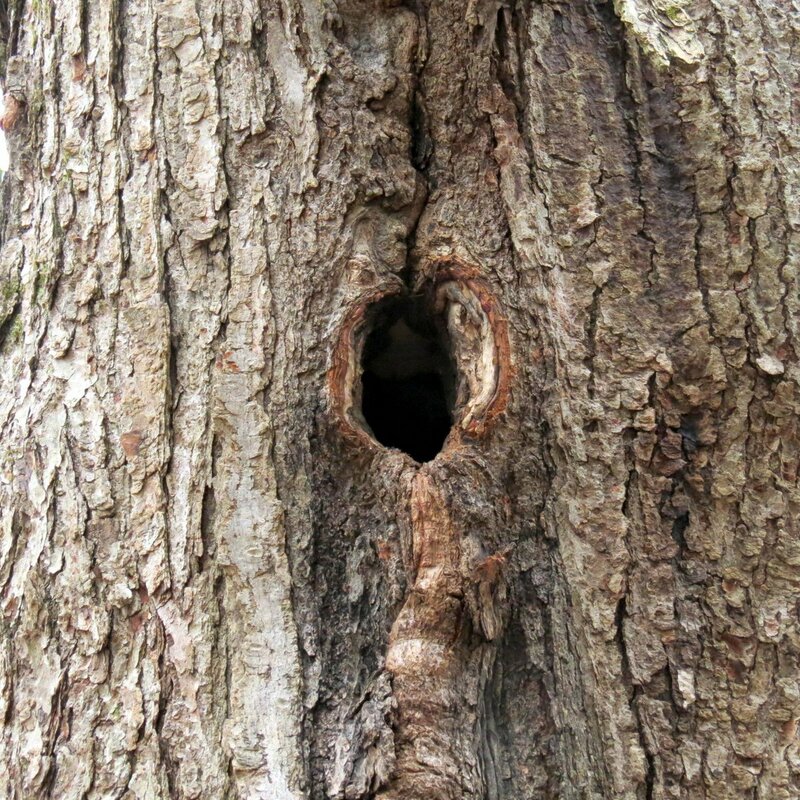 Luckily, I think it lives in a section where trees won’t be cut. At least I hope so. Plants grow where they do because that’s where they find the optimum levels of light, moisture and nutrients, and cutting the trees above them can cause serious changes in what they’re accustomed to. Beautiful little three leaf goldthread (Coptis trifolia) grows in quite a large colony here, but this plant was once nearly collected into oblivion and I’d hate to see them disturbed. Native Americans chewed the roots of goldthread to treat canker sores, which is why the plant is also called canker root. The natives shared the plant with the English settlers and it became such a popular medicine that by 1785 the Shakers were paying 37 cents per pound for it dried, which meant people dug up all they could find. At one time more goldthread was sold in Boston than any other native plant. One of our most beautiful wild orchids, the pink lady’s slipper (Cypripedium acaule,) also grows here in abundance. 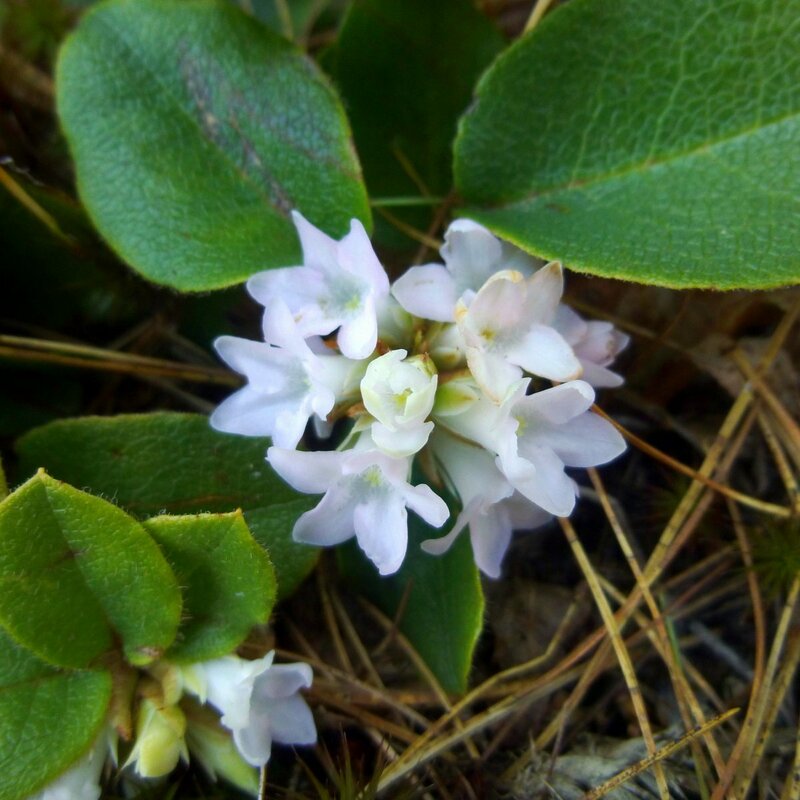 It is also New Hampshire’s state wildflower. This plant interacts with a Rhizoctonia fungus in the soil and this fungus must be present for it to reproduce. 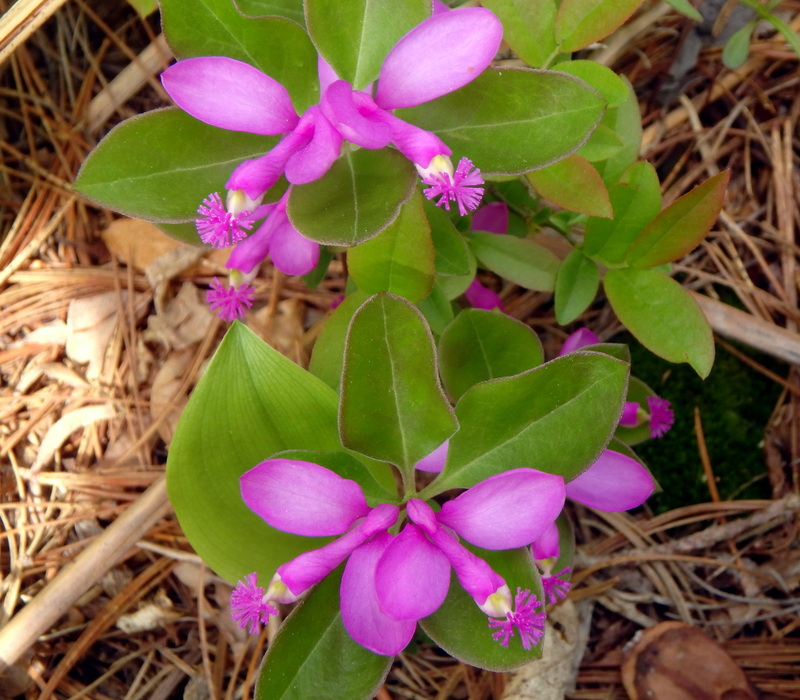 Pink lady’s-slippers are listed as “special concern” under the Native Plant Protection Act. I hope there won’t be any tree cutting in this area. So far I have found just a single example of another of our beautiful orchids here. I don’t think that downy rattlesnake plantain (Goodyera pubescens) could be called rare but it is hard to find and I hope the single example I know of in this forest won’t be run over by a logging skidder. One flowered pyrola (Moneses uniflora) is quite rare; the two plants in this photo are the only examples that I’ve ever seen. 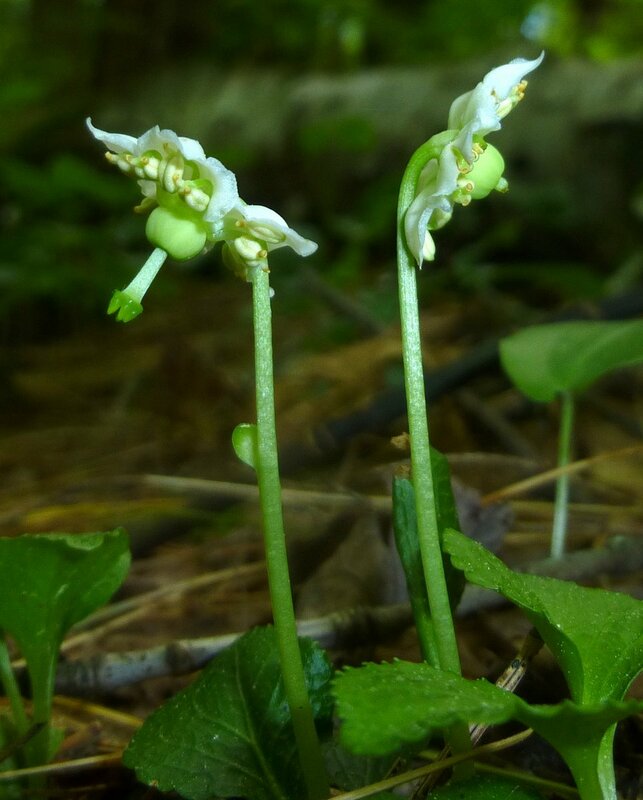 This plant is also called one flowered wintergreen and single delight. It is found in dry, cool, undisturbed forests and was used by Native Americans as a cold remedy, and to reduce swelling and ease pain. 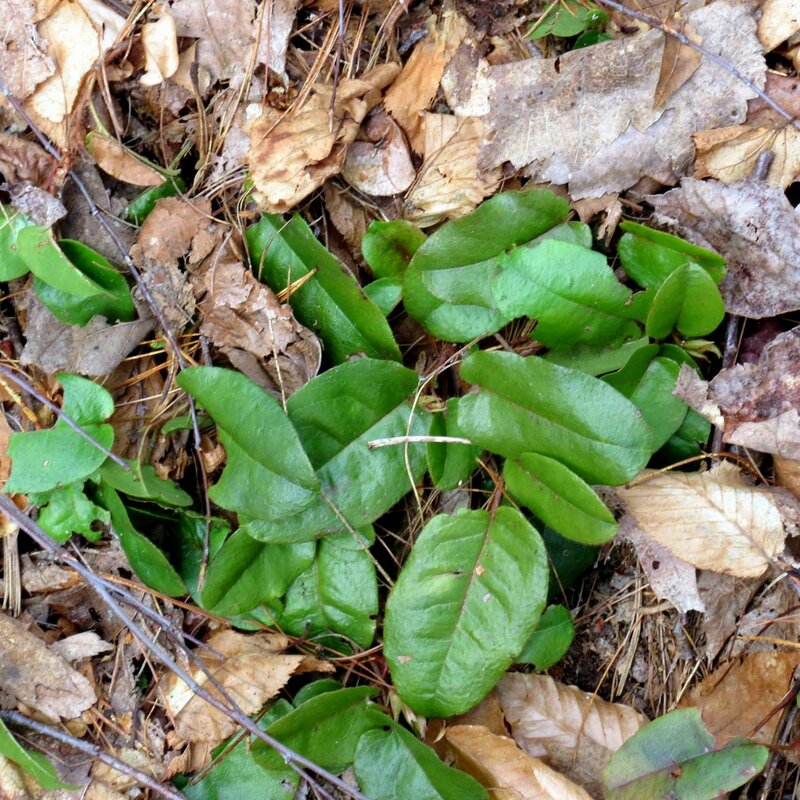 I found these plants in Edgewood forest in 2014 but then lost them and haven’t been able to find them again since, even though I know the general area they grew in. 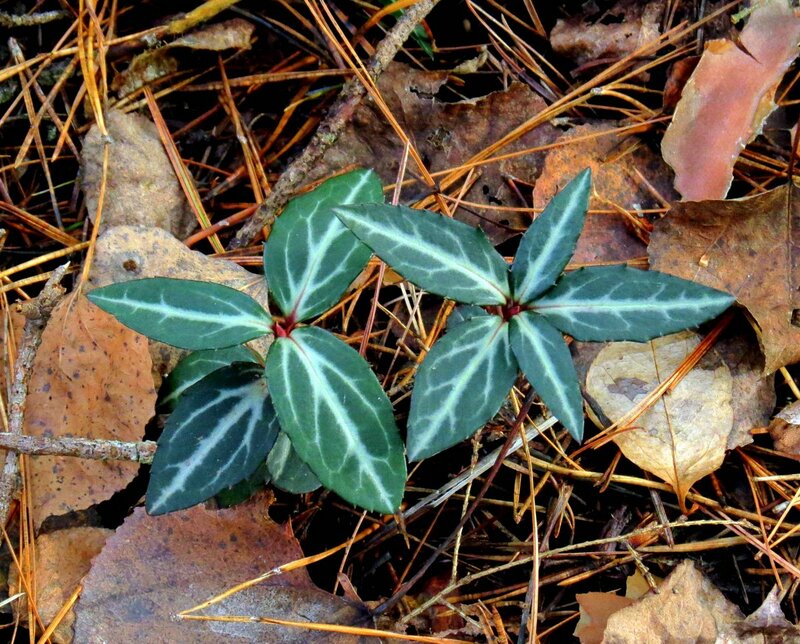 Another rarity in this forest is striped wintergreen (Chimaphila maculata.) I’ve found 5 or 6 examples here, all growing in the same general area. 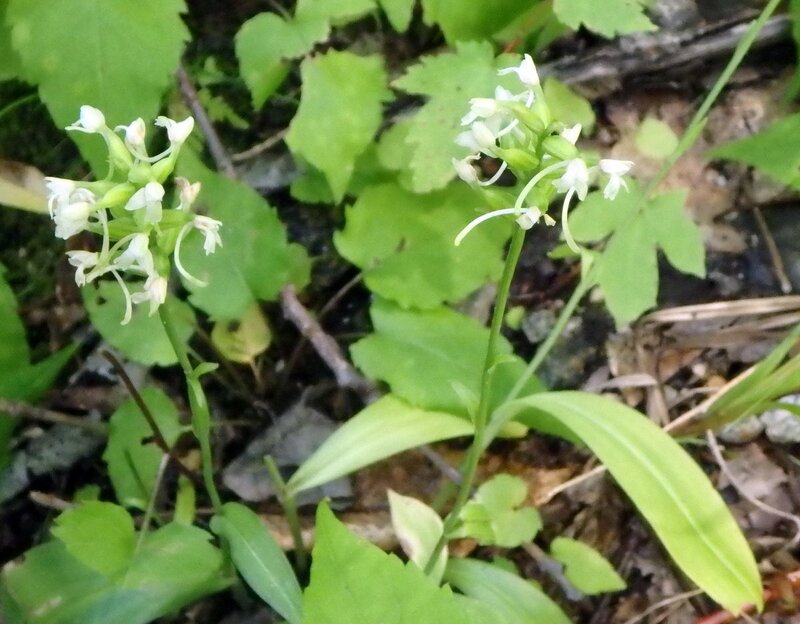 Striped wintergreen has a symbiotic relationship with the mycelium of certain fungi in the soil and is partially parasitic on them through a process called myco-heterotrophy. This means that, even though they photosynthesize, they supplement their diet with nutrients taken from fungi. That explains why they will only grow in certain places, much like our native orchids. It also explains their rarity. I read recently that the plant is considered rare in both New England and Canada. I’ve also read that it won’t grow on land that has been disturbed in the last 100 years. 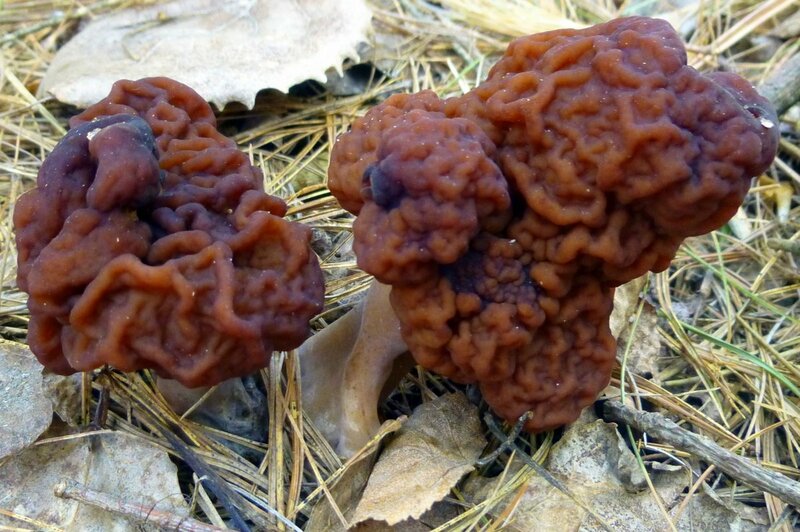 False morel mushrooms (Gyromitra esculenta) also grow here, and this is the only place that I’ve ever seen them. I wonder if they have any relationships with the surrounding plants and trees. They grow very close to both trailing arbutus and several hardwood species of tree. 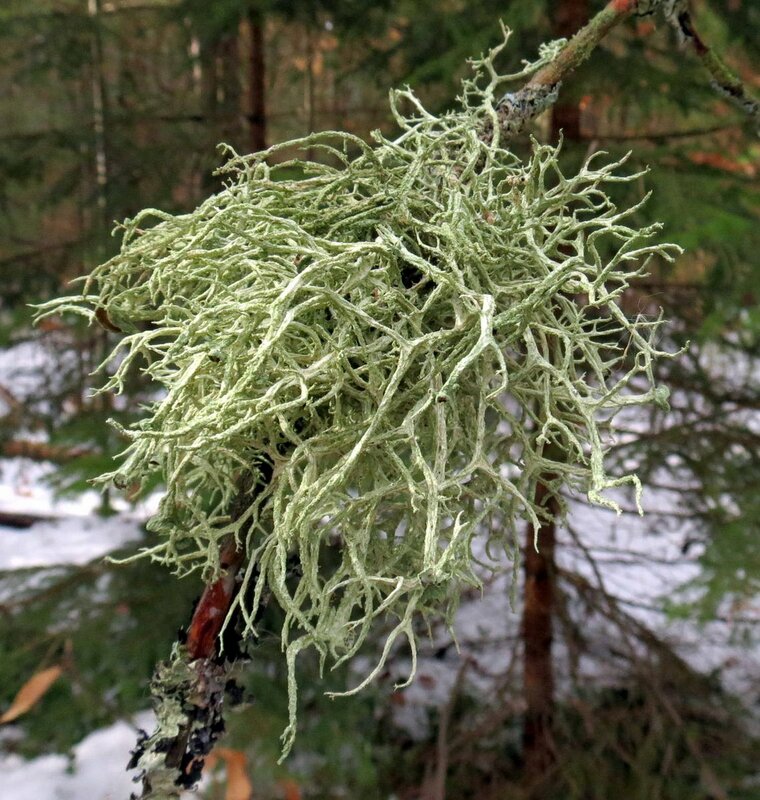 A forest isn’t only about the trees and the plants that grow around them; what about all of the things that grow in the trees, like this beard lichen (Usnea)? This is something I don’t think people who cut trees spend much time thinking about, but cutting a tree affects far more than just the tree. In the end it really doesn’t matter what anyone thinks; the powers that be have spoken and the trees will be cut, but there are different ways to manage tree cutting in a forest. One way is to simply drive a huge log skidder right through it without a thought or care about what is being damaged. That way was used across town on the flanks of Mount Caesar a few years ago and the scars left behind will never fully heal. 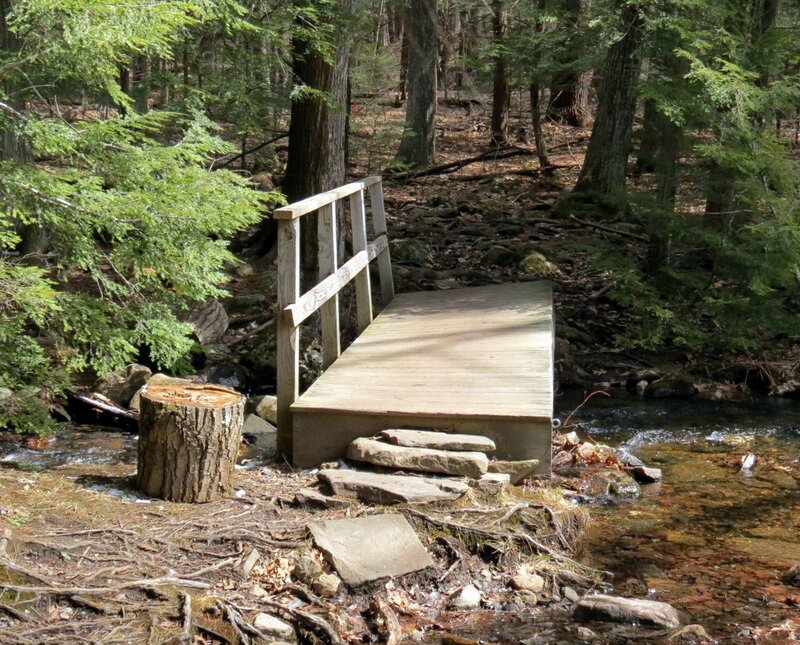 But there is another way, and that way includes care for the surrounding landscape and consideration for the wildlife and people who are being affected. Nobody wants to see a plane hit a tree, but neither do the people who know this forest intimately want to see it destroyed. All photos of flowering plants were taken previously. The first time I did one of these looking back posts was last year and I thought I remembered it being fun, but I found this one a little harder than fun. Picking one photo from 80-100 of them for each of the 12 months isn’t easy, but in the end I decided on the ones that best spoke about the month they were from. Last winter we didn’t have a lot of snow but we always have cold in winter, and that’s why I chose this photo of a tear shaped icicle for the month of January. It is said that January is our coldest month but I’ve seen February earn that title a few times in recent years. Along with cold February can sometimes bring enough snow to cover nearly everything, and this is when tree trunks gain a certain appeal. There are almost always lichens and mosses found on them and last February this maple dust lichen answered a question that I had been asking for some time, which was “Do maple dust lichens only grow on maple trees?” This one growing on a beech tree put the question to rest, and I have since seen them on poplars and young oaks as well. 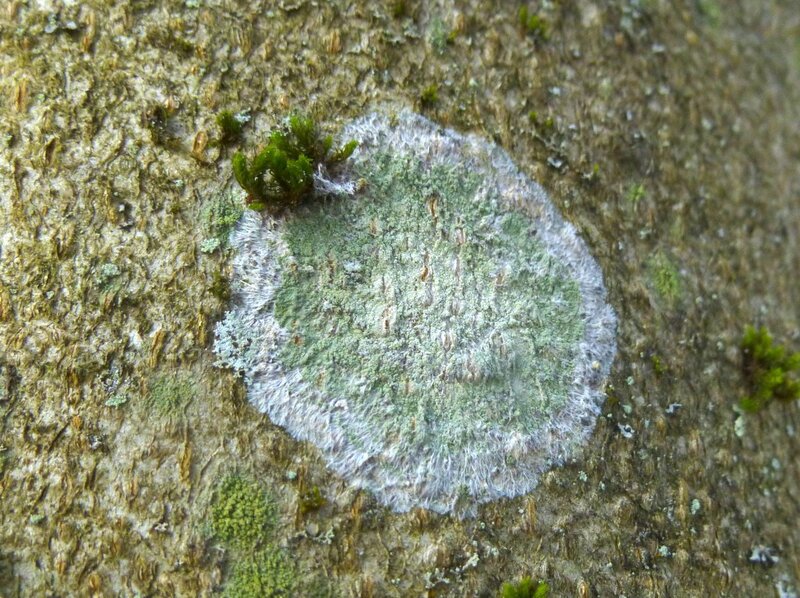 This pretty little lichen averages about an inch in diameter I’d guess, and can be identified by the white fringe around its perimeter. 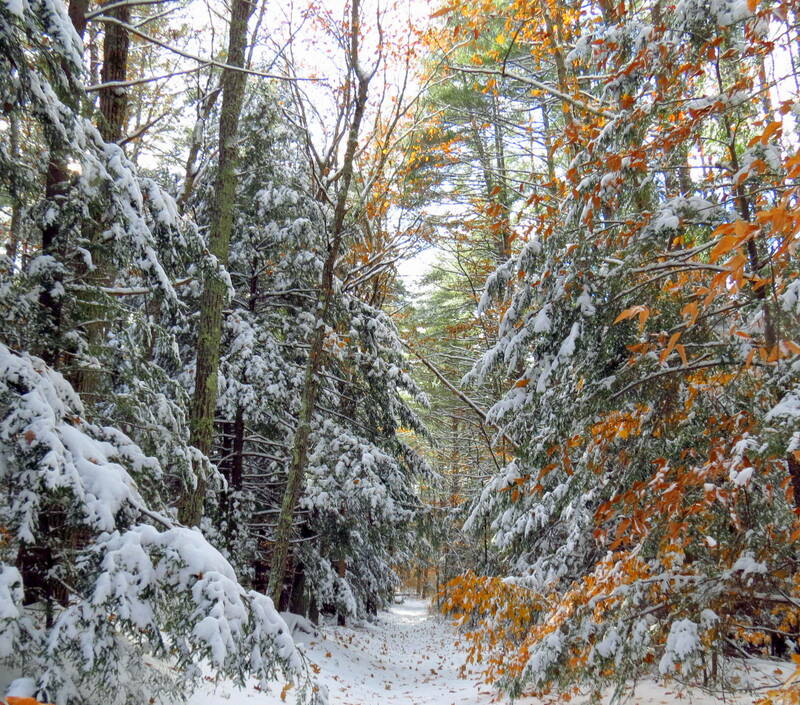 Proof that even when there’s six feet of snow on the ground there is still plenty of beauty to be found. 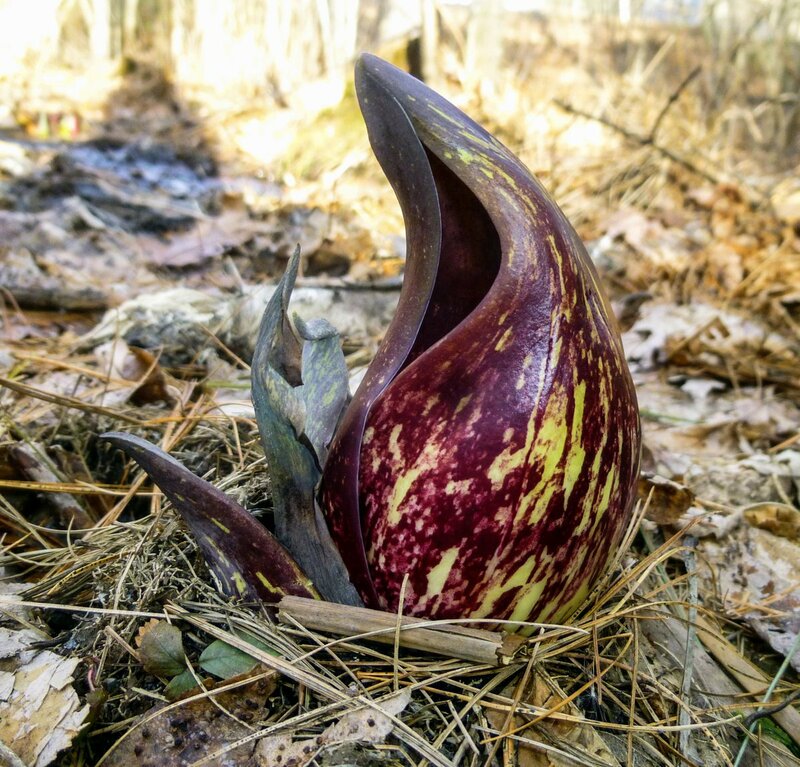 March is when things really begin to stir and one of the first plants I see coming up is skunk cabbage (Symplocarpus foetidus.) As this photo shows, we didn’t have much snow last March but even if we had the skunk cabbages would have simply melted their way up through it. Through a process called thermogenesis, skunk cabbages raise their internal temperature so it’s above the surrounding air temperature, and this melts any ice or snow that might hinder its progress. The dark color of their blotchy spathes attracts sunlight and that means they are also heated by the sun. This makes a nice cozy warming room inside the spathe where early insects can come and hang out and warm up. While they’re inside if they happen to bump into the spadix full of flowers and get pollen all over themselves, so much the better. April is when flowers begin to appear in great numbers. 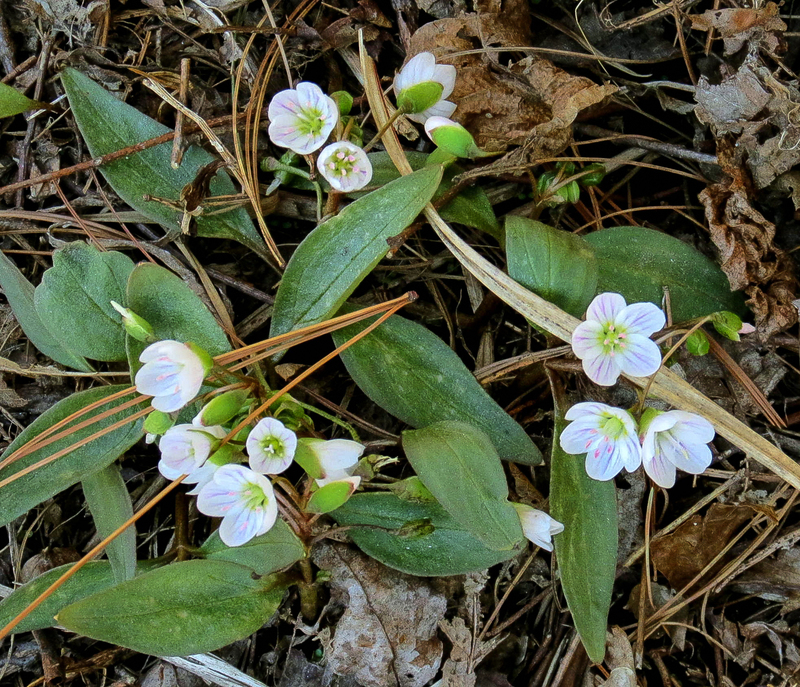 Spring bulbs bloom, trees bloom, and the first of our wildflowers bloom, including wild ginger, purple trillium, trout lily and the beautiful spring beauties (Claytonia virginica) shown in this photo. 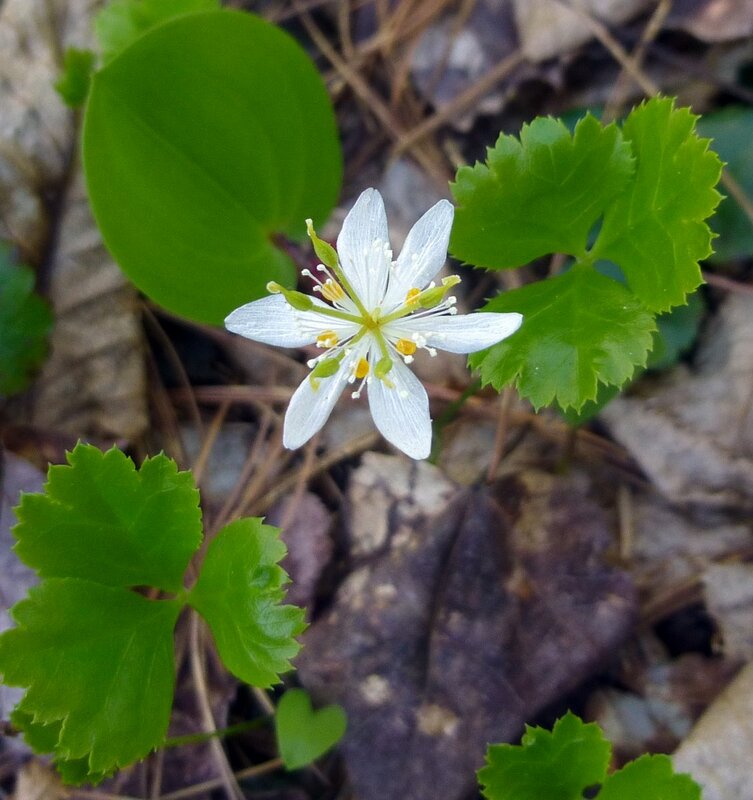 I’m always so excited when I see their first blooms I drop down to my knees and start taking photos, forgetting that there are often leafless poison ivy vines crawling under last year’s fallen leaves. But itchy knees are worth it when beautiful things like these can be seen. There are few sights as breathtaking as a woodland floor carpeted by thousands of them and I’m very anxious to see them again. In May the leaf buds on many of our trees start breaking and king among them is the beech, in my opinion. 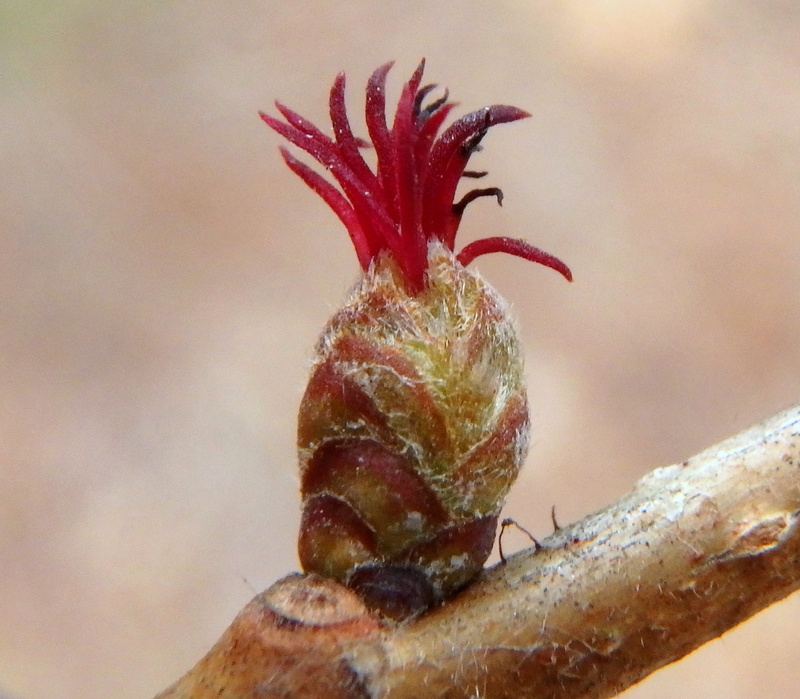 American beech (Fagus grandifolia) bud break begins when the normally straight buds start to curl. The curling is caused by the cells on the sunny side of the bud growing faster than those on the shaded side. 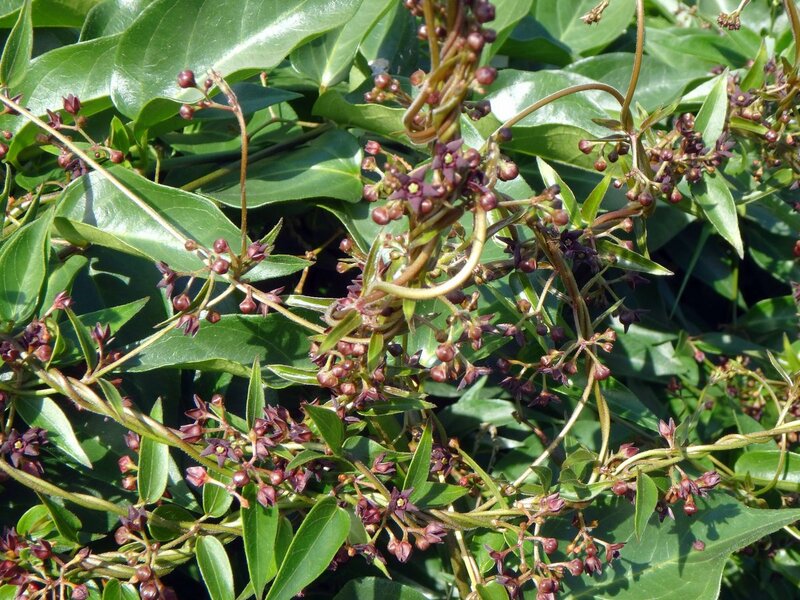 This creates a tension that curls the bud and eventually causes the bud scales to pull apart so the leaves can emerge. Once the downy angel wing like leaves begin to show they unfurl quickly, so you have to watch carefully. I check them each day, and it’s always worth the effort to see something so beautiful. It’s too bad that so many people miss such a captivating event. In June there are many beautiful wildflowers blooming and I had a very hard time choosing which one to include here. 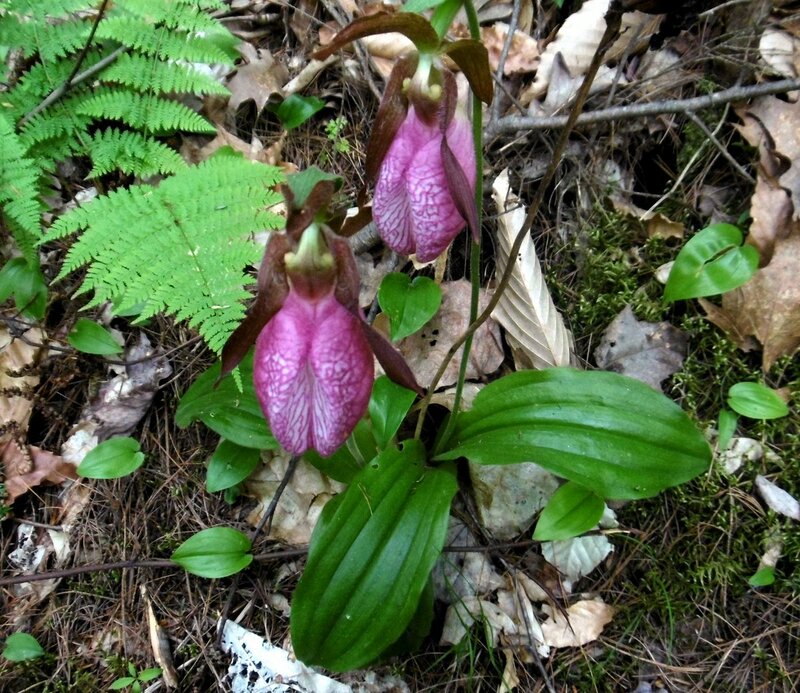 In the end I chose the pink lady’s slipper (Cypripedium acaule,) which is New Hampshire’s state wildflower. 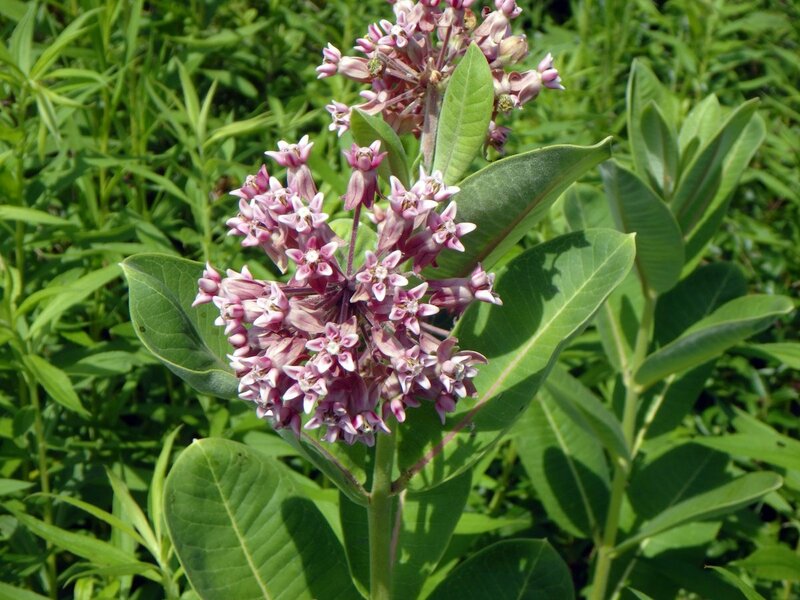 The wild part of the word is significant, because our official state flower is the lilac, which isn’t native to New Hampshire. In any case the lady’s slipper is a beautiful native orchid and we’re lucky enough to have several different examples of them. Pink are the most common in this area but I’ve heard that there are yellow ones tucked away here and there and I’m always looking out for them. 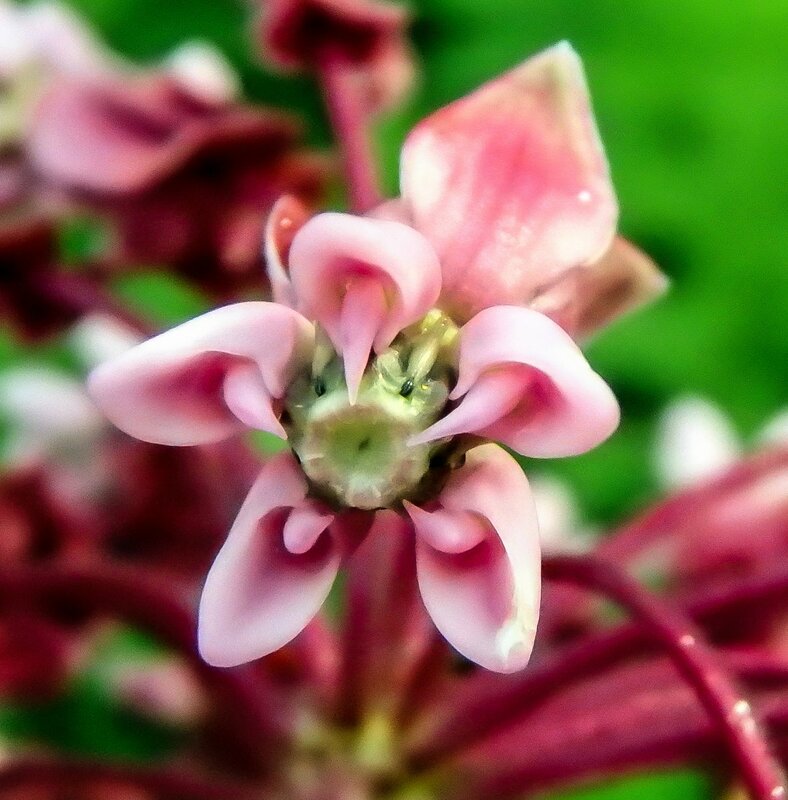 July is when I finally get to see the swamp milkweeds again. In my opinion they are easily one of our most beautiful wildflowers, and one that I’ve lost myself in more than once. If only there were more of them. I know of only two or three smallish clumps and last year one of those was too sick and insect ridden to even blossom, so they’re something I have to search for here, but their rarity and beauty make them worth every minute of searching. 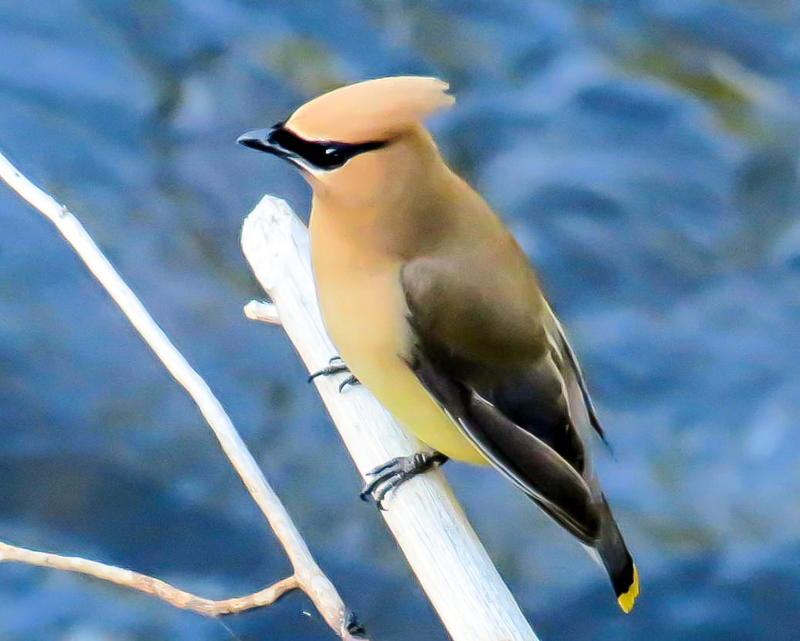 August is when the silky dogwood berries ripen and the cedar waxwings appear out of nowhere to eat them up, and isn’t it amazing how nature will teach you such things if you just pay a little closer attention? I love seeing the beautiful blue and white berries that always remind me of Chinese porcelain, and I also love seeing the sleek beautiful birds that feast on them. The fungi and slime molds didn’t do too well this year because of our drought but I saw a few in September, including this bolete with a mycoparasite called Syzygites megalocarpus growing on its cap. 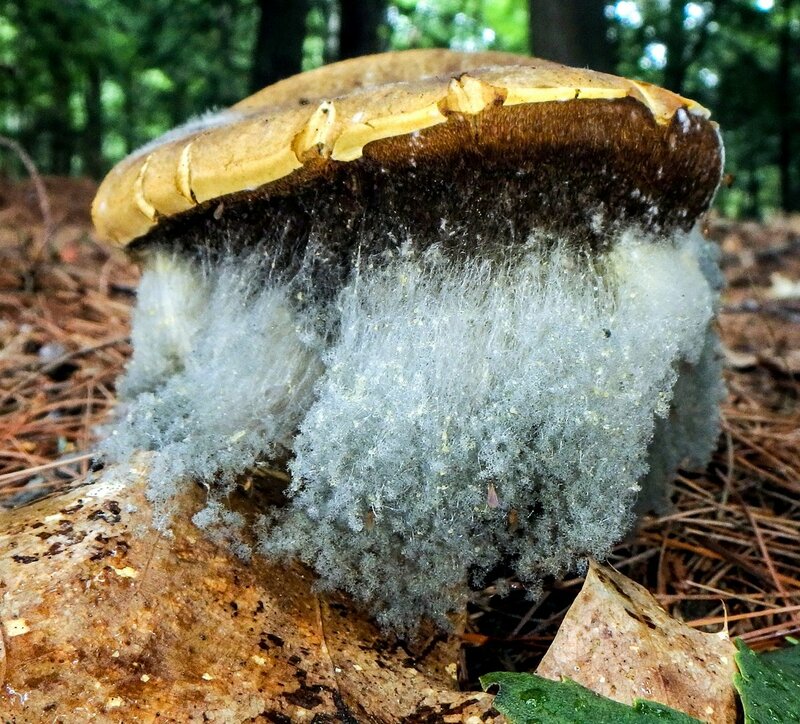 A mycoparasite is essentially a fungus that feeds on other fungi. 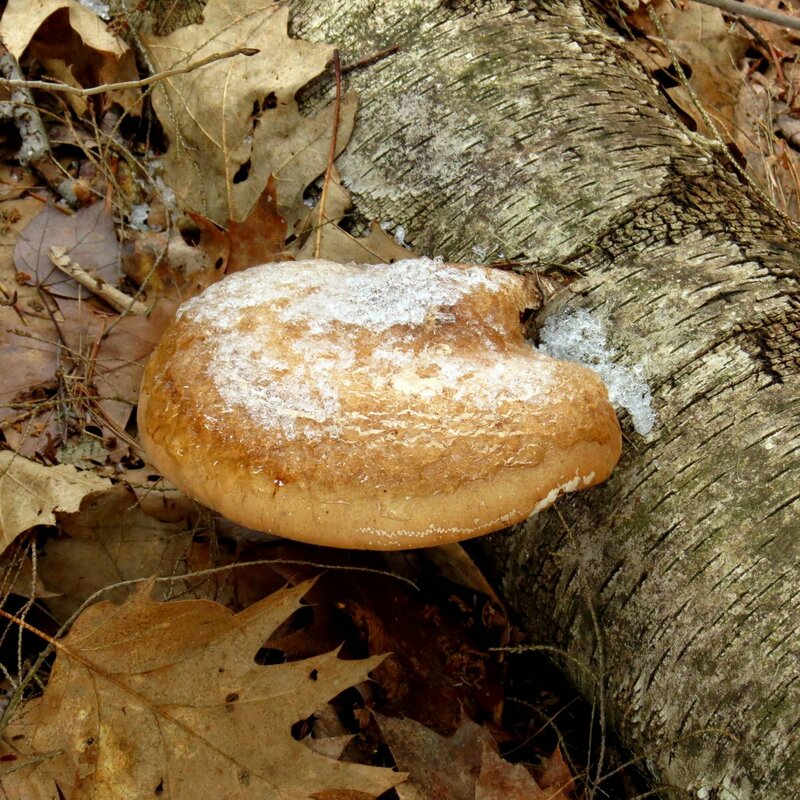 This one has been found on over 65 species of mushroom. It can appear overnight if heat and humidity levels are just right, and that’s exactly what this one did. 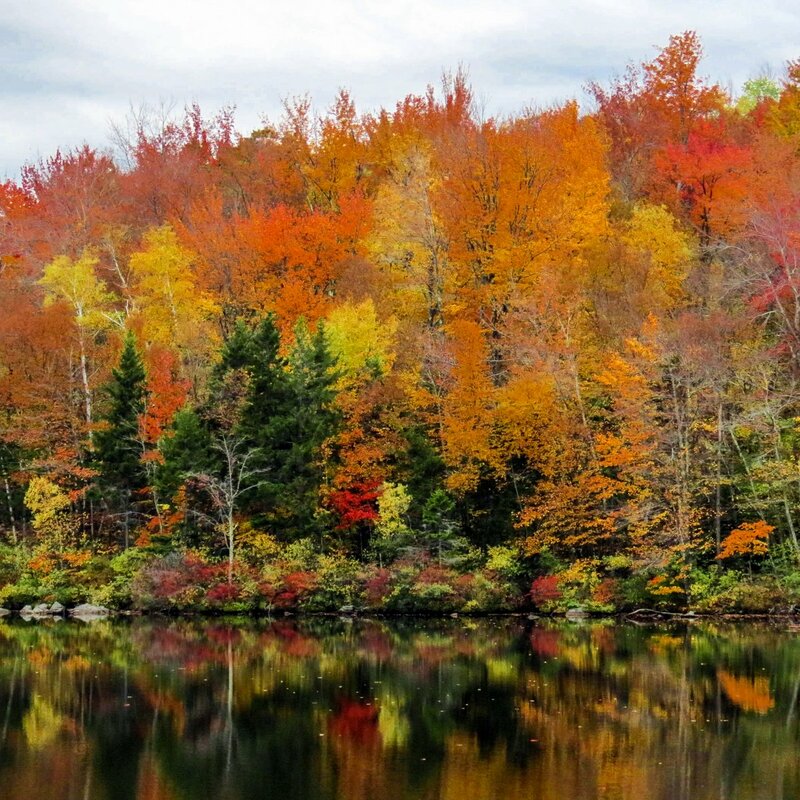 No matter how you slice it October has to be about the fall foliage colors because that’s usually when they’re at their peak in this area and that’s when people from all over the world come to see them. 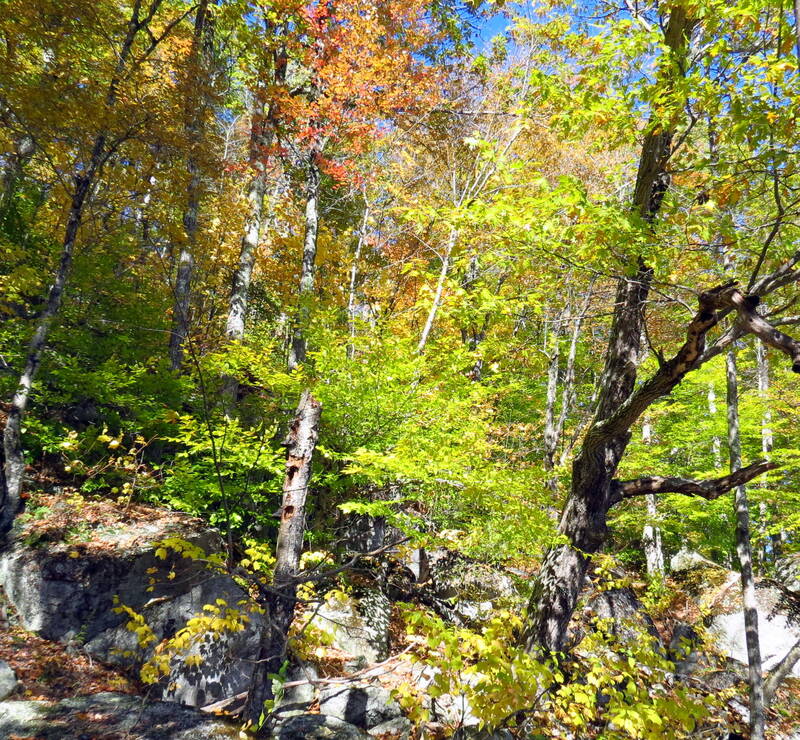 This spot at Howe Reservoir in Dublin is always worth a look because it’s a forest of mostly deciduous trees and it is always colorful in the fall. I love the muted, pastel shades that happened on this cloudy day. 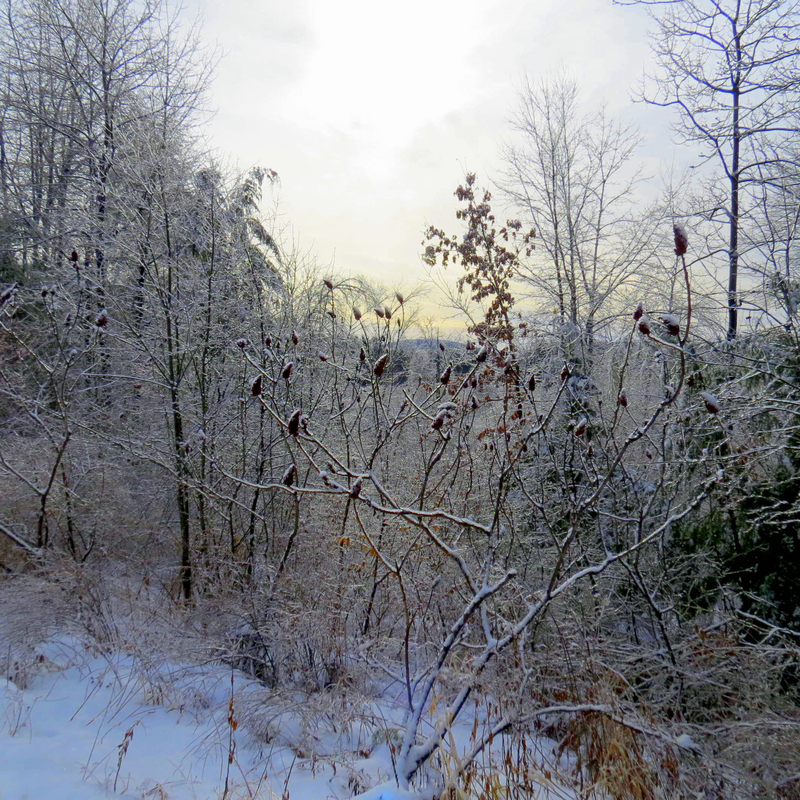 We don’t usually get much snow in November but it does get cold enough for ice to form on puddles and small brooks and streams. 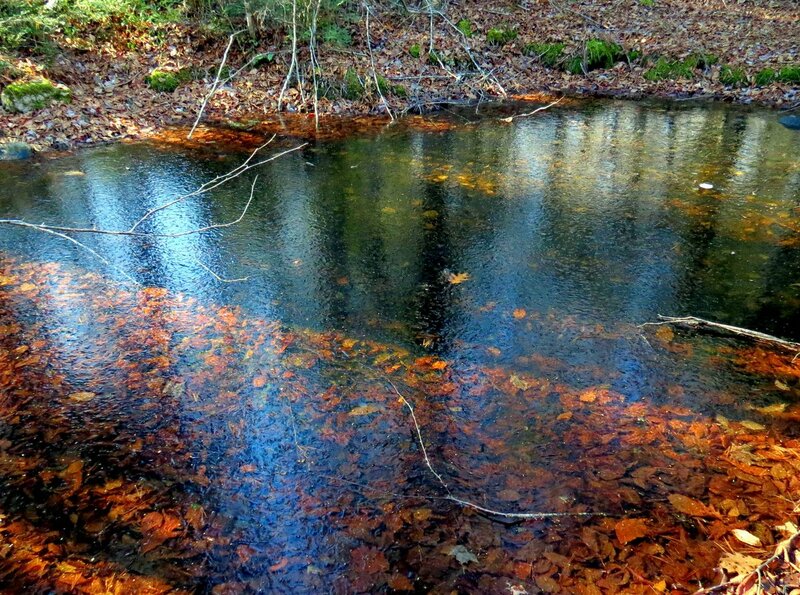 I found this frozen pool in the woods on a cool walk one November day and I liked the many colors in and around it. 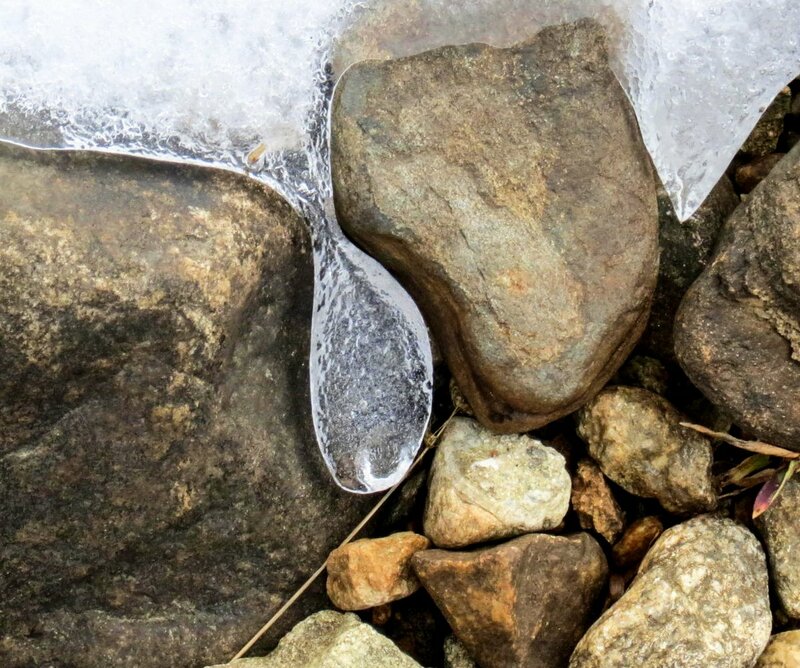 The ice was thin enough so one step would have probably shattered it. There are people who seem to think that once the leaves fall there is nothing left to see outside until spring, but nothing could be further from the truth. I chose this photo of a split gill mushroom (Schizophyllum commune) that I took in December to show that there is still a lot of beauty and interest out there. You just have to look a little more carefully, that’s all. 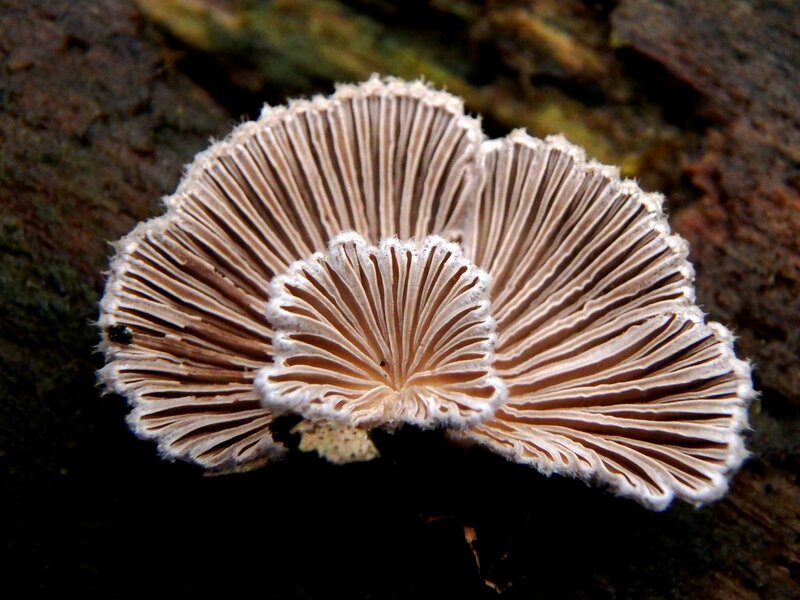 The “gills” on the split gill fungus are actually folds on its underside that split lengthwise when it dries out. 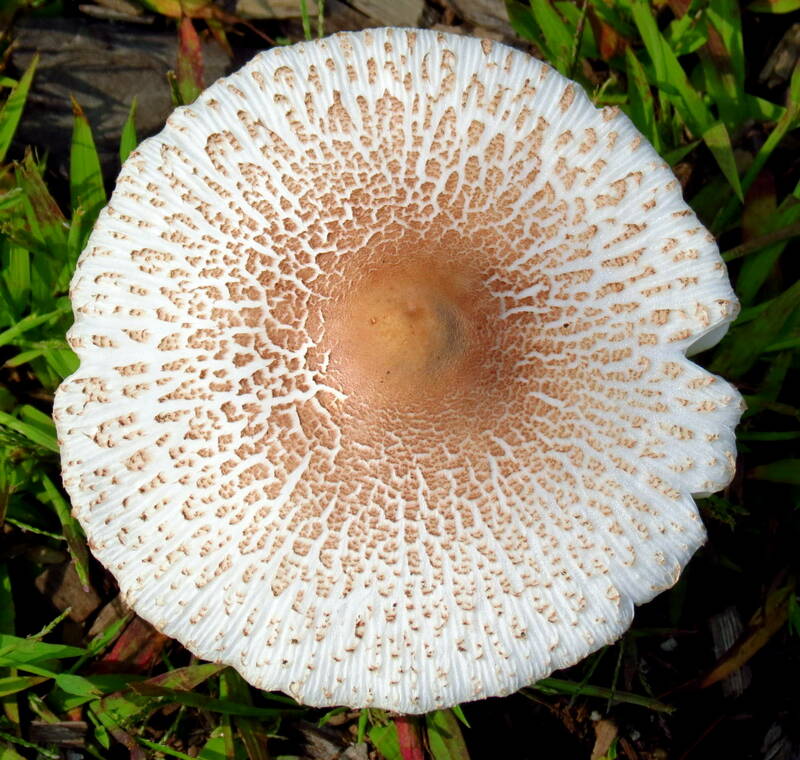 The splits close over the fertile surfaces as the mushroom shrivels in dry weather. When rehydrated by rain the splits reopen, the spore-producing surfaces are exposed to the air, and spores are released. I thought I’d make the photo count in this post an even baker’s dozen so I could squeeze in what I thought was an amazing find in July. I walked down an unknown trail through a swamp and found a two foot tall orchid growing right beside it on a mossy hummock. It’s either a purple fringed orchid (Platanthera psycodes) or a greater purple fringed orchid (Platanthera grandiflora.) I’m not sure which but it is definitely one of the most beautiful wildflowers that I’ve seen. The chance of finding something like this is what keeps me wandering through these woods. 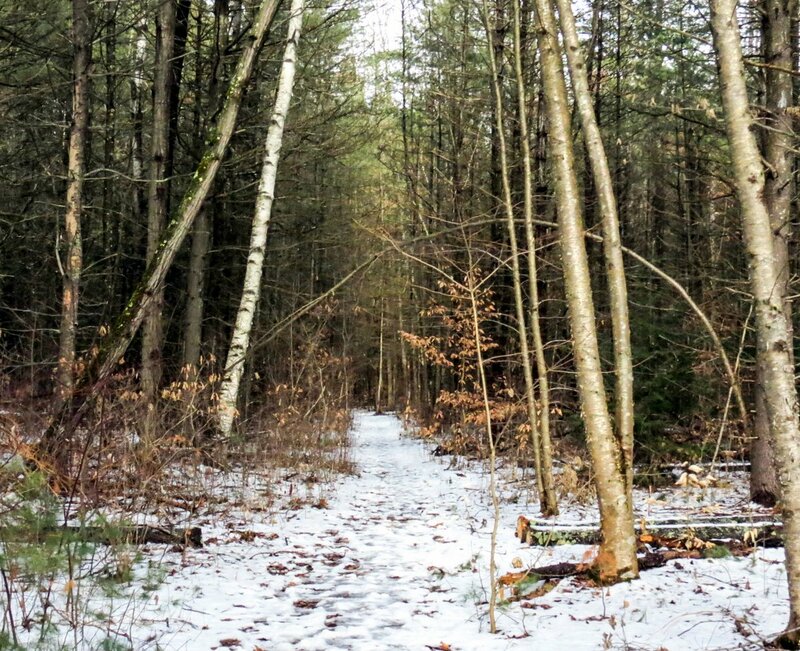 There are beautiful things around every turn in the trail. Thanks for stopping in. I hope everyone has a safe, happy, nature filled New Year!